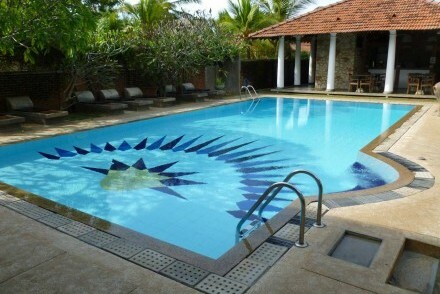 Sri Lanka has a wide variety of places to stay depending on your mood, budget, location or preference. 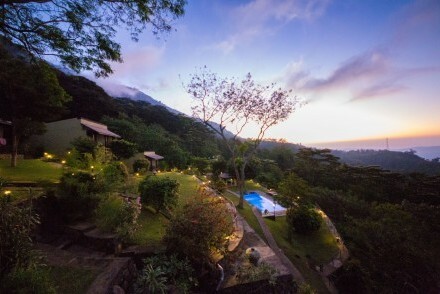 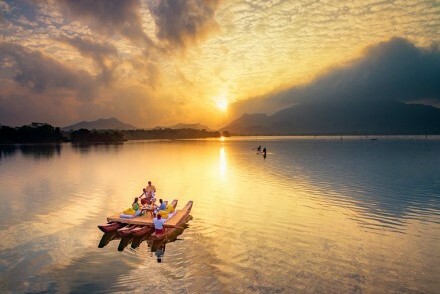 Many different styles of accommodation are on offer from family-run guesthouses and homestays to exclusive walauwas (mansion villas), including boutique and niche hotels, former government rest houses and tea planters’ clubs, colonial-era bungalows and hotels, sumptuous suites and villas, and traditional cabanas and tree houses. 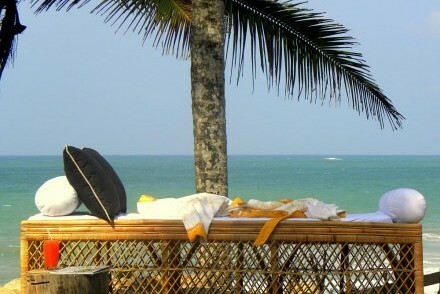 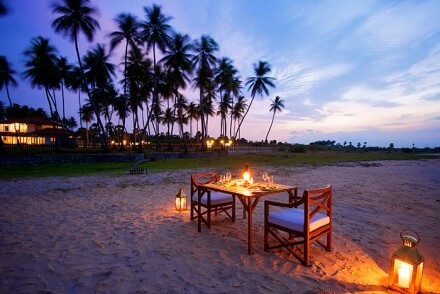 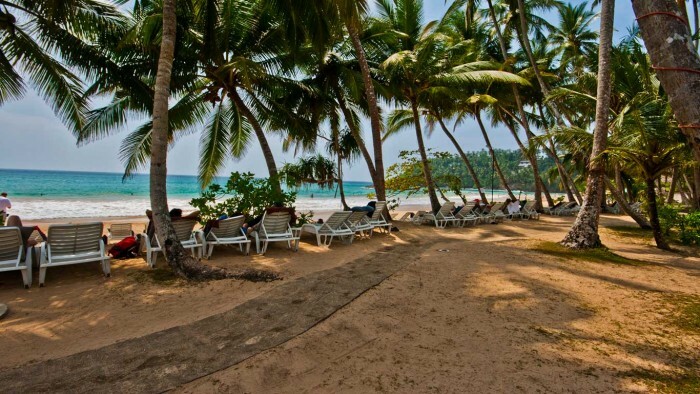 It is possible to rest your head in a combination of these places on your holiday in Sri Lanka. 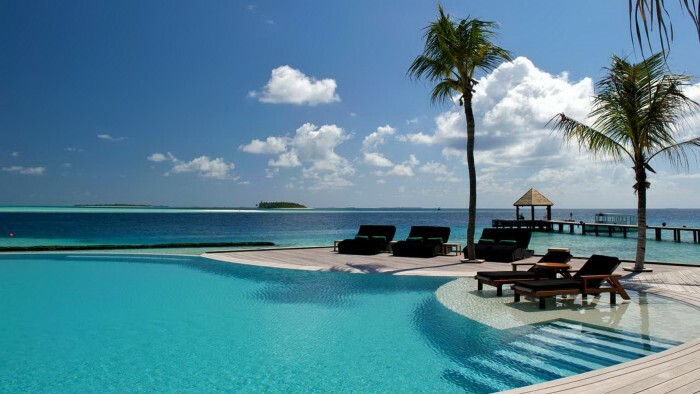 Our resorts in Maldives are specially selected for their character, quality and ambiance. 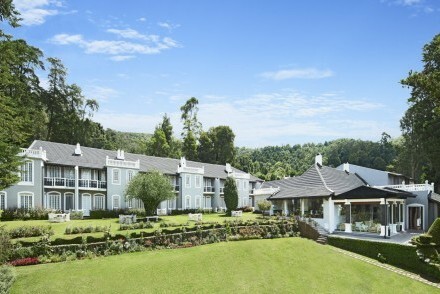 Please see below for a summary of the accommodation we offer. 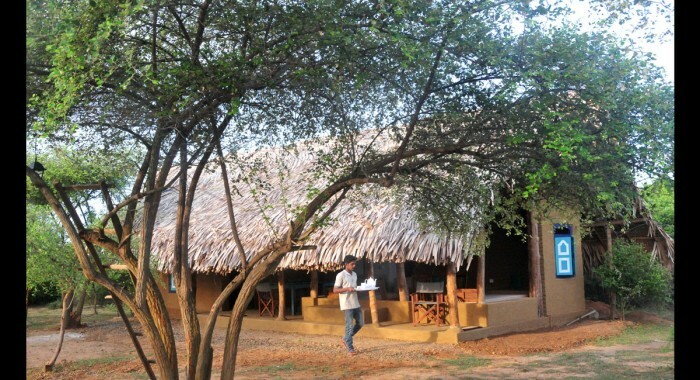 For more details, click on Trip Planner and log in for photos and in-depth descriptions of the accommodation available. 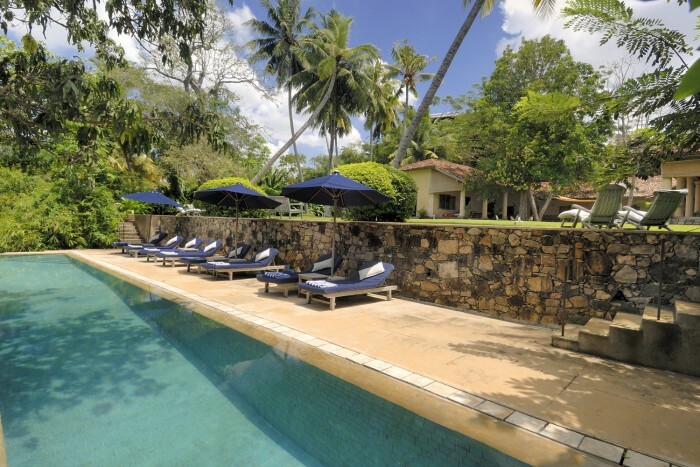 Tikalanka can offer Treat Yourself (Plus), Distinguished, Heritage and Guesthouse accommodation, depending on the type and style of holiday you wish to experience in Sri Lanka and Maldives. The price band given below is the average high season price for a double room. 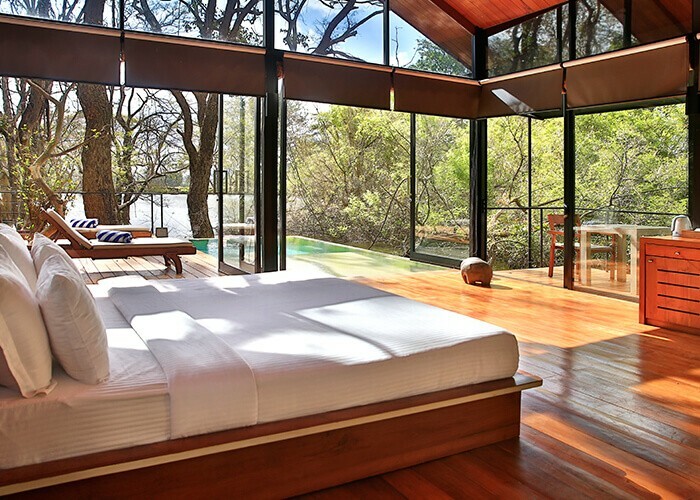 You will stay somewhere extraordinary when you choose the accommodation in our Treat Yourself Plus category. 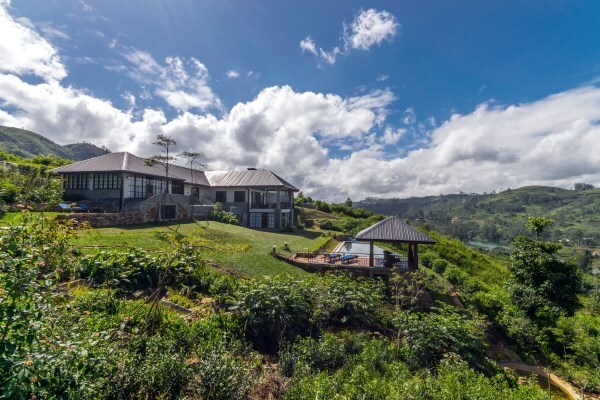 Nothing is left to chance at these top-of-the-range properties, which means the quality of rooms, service, cuisine, gardens and location is second to none. Attention to detail and anticipating your every whim are delivered effortlessly, and the only regret will be that you didn’t stay longer! 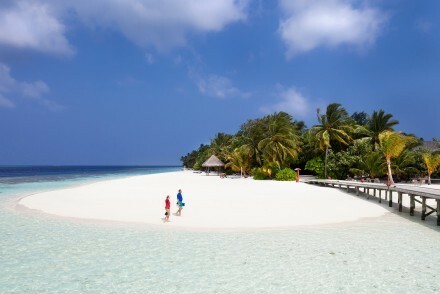 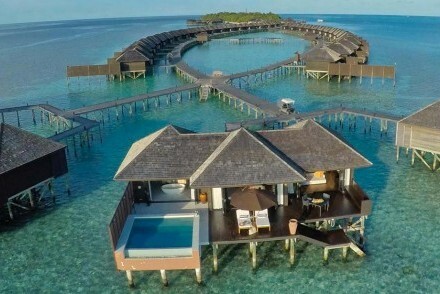 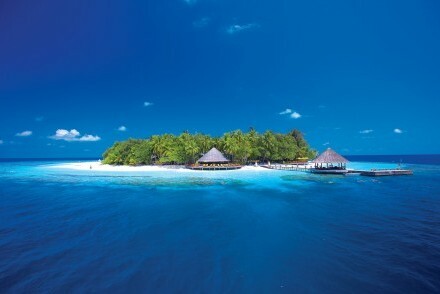 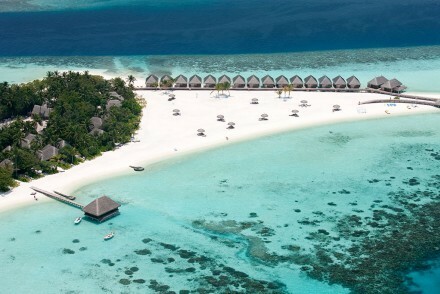 A lot of our Treat Yourself Plus accommodation is located in Maldives. 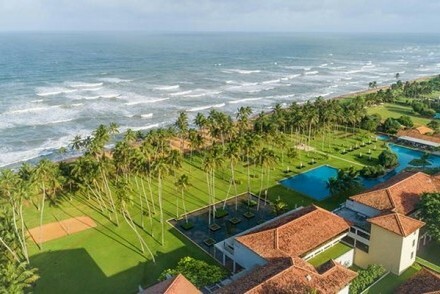 However, Sri Lanka also has its fair share of exceptional places to stay and more are being developed every year, although currently we do not offer Treat Yourself Plus accommodation in the North and East. Below are outline details of sample Treat Yourself Plus accommodation. For more details, click on Trip Planner and log in for photos and in-depth descriptions of the accommodation available. 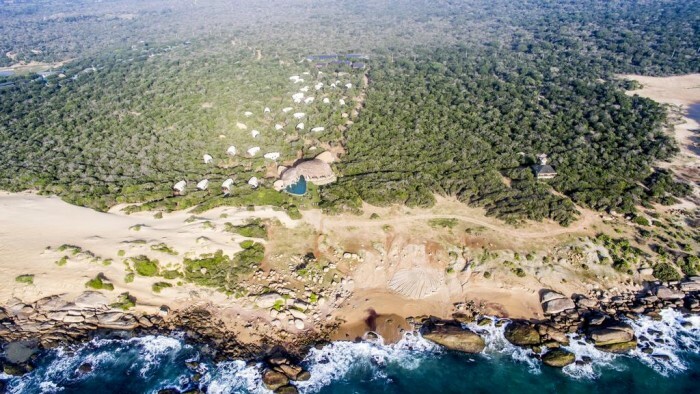 Spectacular luxury tented camp situated in a stunning location where the jungle meets a rugged, empty beach, overlooking the Indian Ocean. 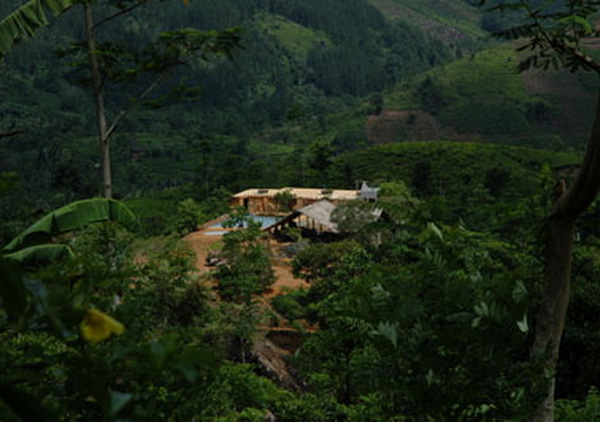 The unique design and use of carefully selected natural materials allows the man-made structures to blend seamlessly into the surrounding landscape. 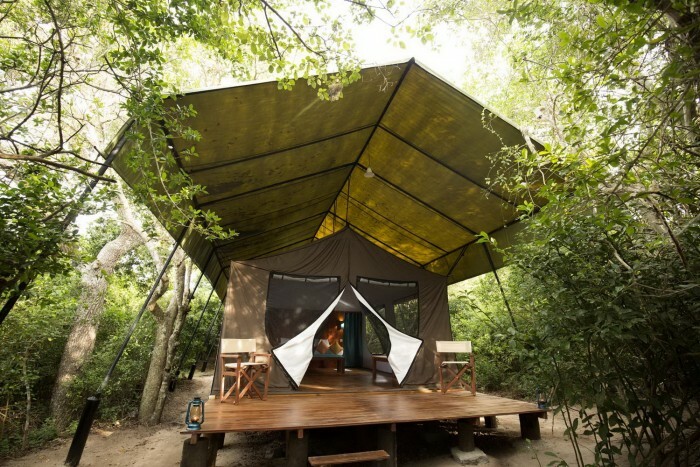 Boutique blend of wilderness camping and an award-winning safari provider, renowned for the personalised service, expert guides and comfortable facilities. 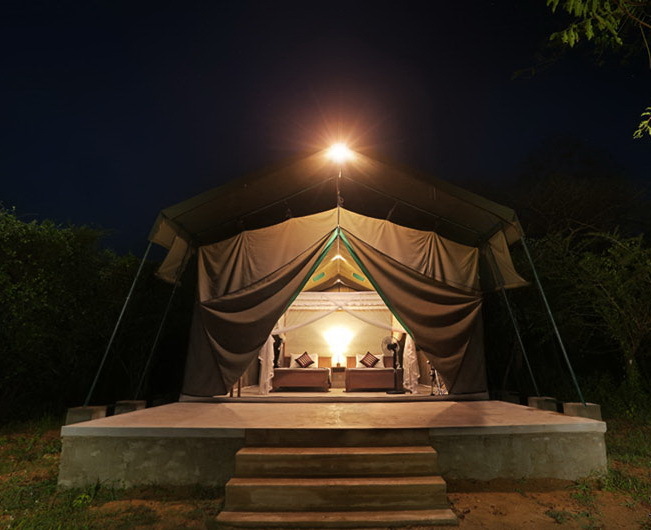 Leopards are a particular expertise of the company and they are relatively easy to spot on safari since Yala has a thriving population. 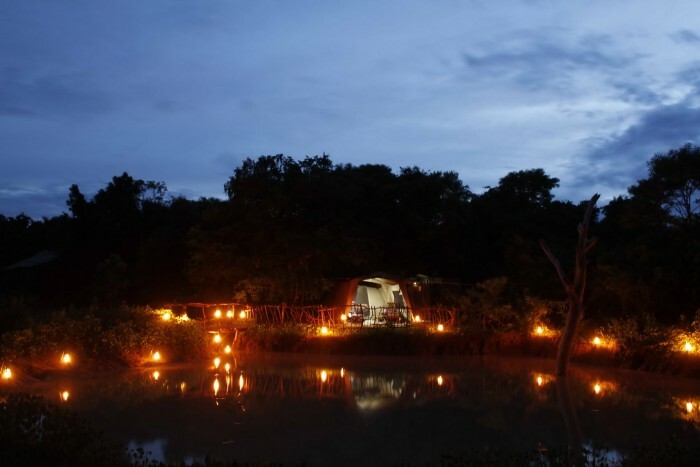 All-inclusive safari campsite adjacent to Wilpattu National Park owned and run by a team of conservationists, nature lovers and wildlife photographers who will endeavour to make your safari a very enjoyable and knowledgeable experience. 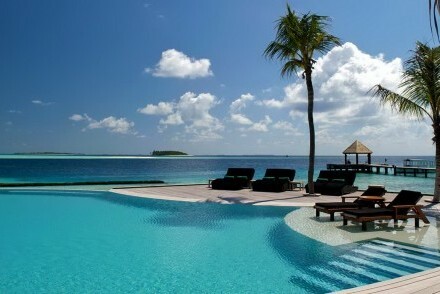 Come and indulge yourself in “A Piece of Heaven”! 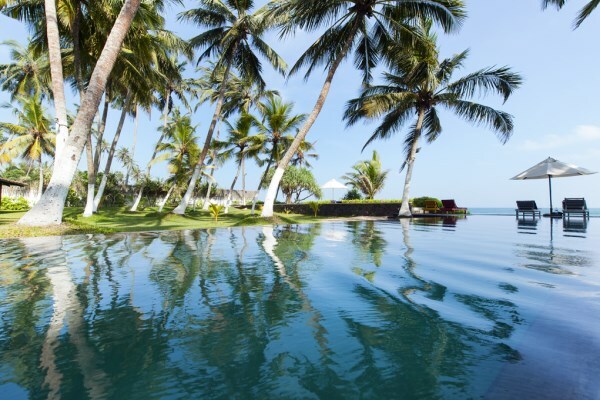 The height of luxury and decadence in an elegantly landscaped and Balinese-influenced tropical garden with views through a beachfront palm grove to the Indian Ocean beyond. 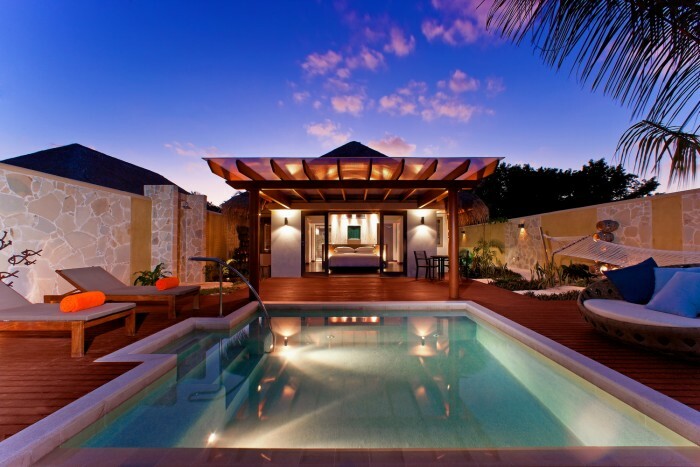 The exceptionally spacious and exclusive pavilions have private gardens, plunge pools and Butler service. 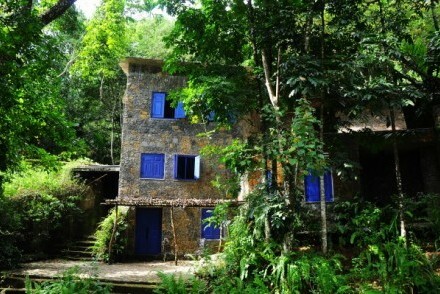 Chic oasis in the jungle surrounded by traditional Chena farms and immersed in a garden redolent with bird calls and resident peacocks performing their courting displays. 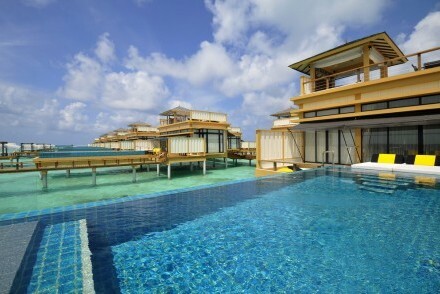 The two-bedroom luxury villa has open-plan living areas, King-size beds, air conditioning, pool, and Wi-Fi. 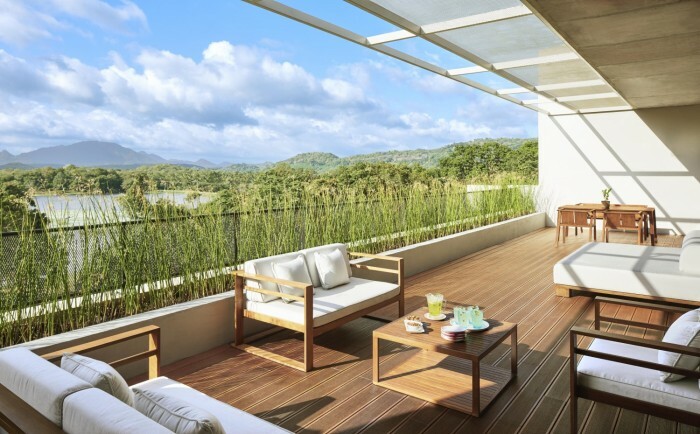 Live the life of a modern-day tea planter at Camellia Hills, a luxurious five-bedroom boutique bungalow in the western Hill Country. 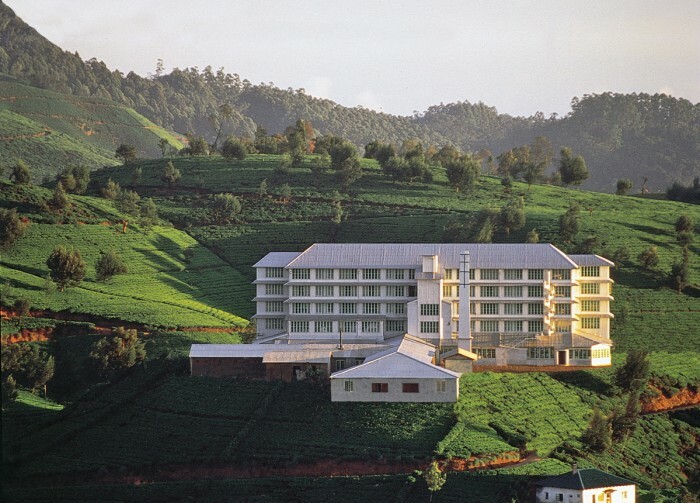 From its verdant valley-side perch, views of the mirror-still Castlereagh Reservoir and surrounding tea-wrapped hills are spectacular. Sri Lanka's first, all-suite, luxury, private bush walks camp immersed in 900 hectares of pristine wilderness that was created by merging an historical hideout and a protected forest. 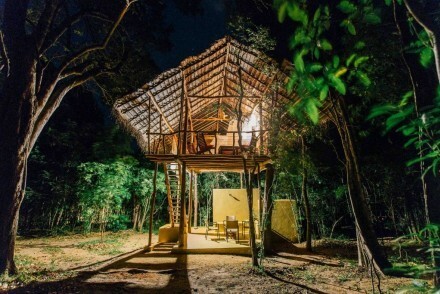 Bespoke jungle treks with local trackers are a unique experience in Sri Lanka. Wilderness adventures in state of the art tents and customised jeeps with expert naturalists dedicated to seeking out the most secretive wildlife in Wilpattu National Park. 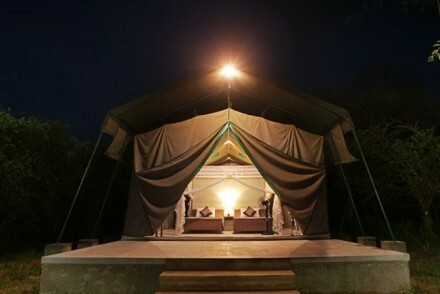 Noel Rodrigo’s Leopard Safaris is an award-winning safari camp specialist and pioneer in ecotourism uncompromising on quality. 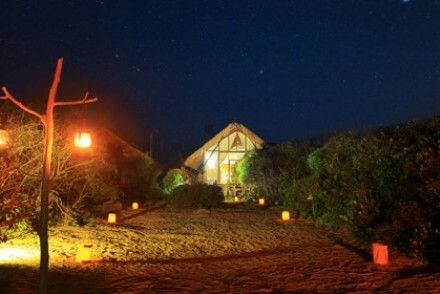 Overlooking a beach where sea-turtles come to lay eggs by moonlight and elephants wander down from the nearby jungle to play in the surf, Uga Chena Huts is a luxury boutique hotel nestling among dunes and trees at the ocean’s edge. 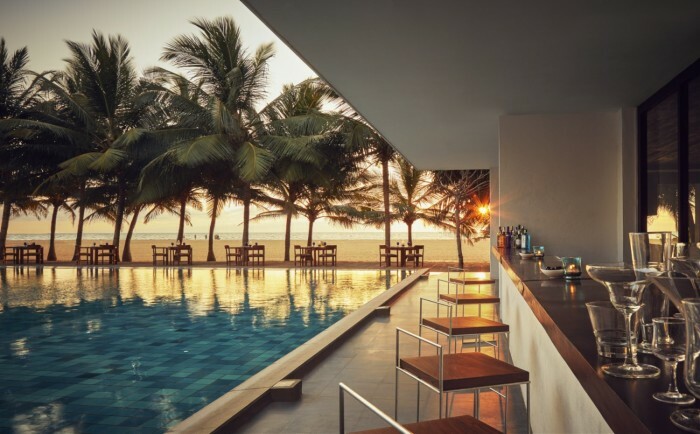 Acknowledged as one of Sri Lanka’s finest and most distinctive all-suite boutique hotels, Aditya’s beachfront location is enhanced by individually decorated and furnished luxury suites, each with a plunge/lap pool or Jacuzzi, as well as a relaxed and refined atmosphere. An exotic luxury beachfront hideaway immersed in a lush tropical garden, Reef has an intimate ambiance and serene, harmonious spaces, which imbue a feeling of relaxed opulence. To maintain the romance and privacy, there are only seven elegant suites. 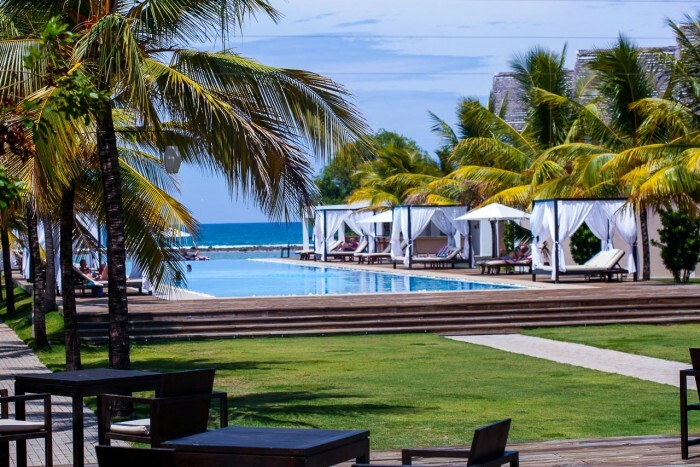 Atop a landscaped promontory overlooking the ocean, stunning panoramas naturally complement the artfully designed private retreats while an array of dining venues and the infinity pool capture the iconic sunsets – paradise regained! Authentic walauwas (mansion villas), boutique hotels, colonial-era bungalows, sumptuous suites and beachside villas are all on offer in our Treat Yourself range. Luxurious living that won’t break the bank and a real flair for providing exclusive quality accommodation combine to ensure an unforgettable stay. 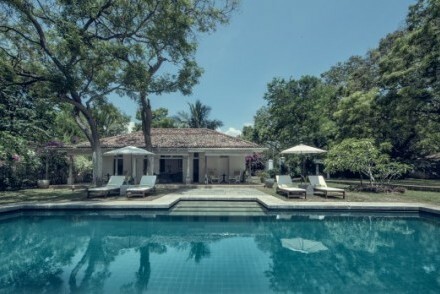 Our Treat Yourself accommodation is available throughout Sri Lanka (except the North) and Maldives. 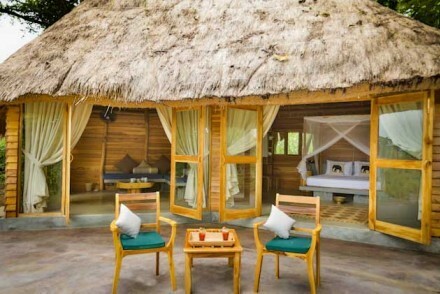 Below are outline details of sample Treat Yourself accommodation. 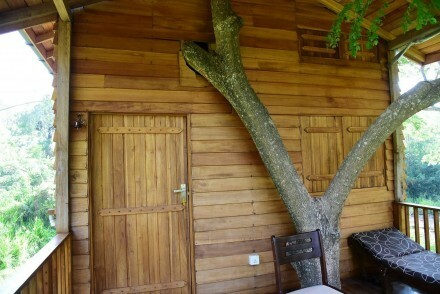 For more details, click on Trip Planner and log in for photos and in-depth descriptions of the accommodation available. 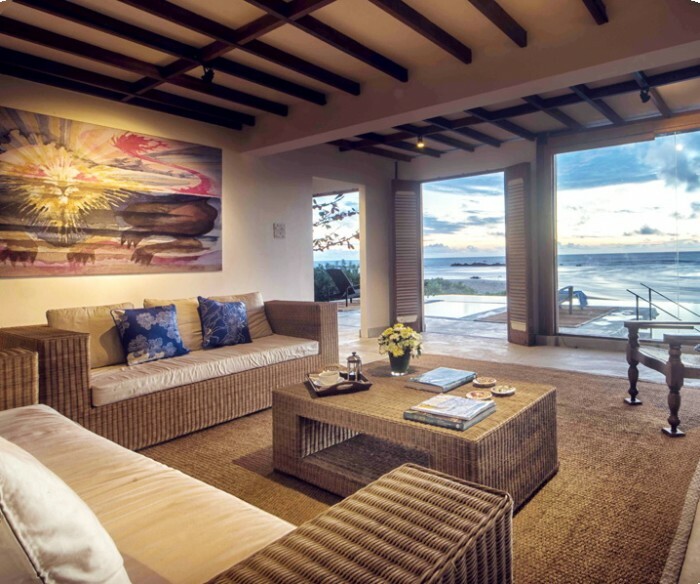 Lavish living, refined style and sumptuous interiors combine perfectly to conjure an exclusive and unforgettable escape at this private, all-inclusive villa, with its ten luxuriously appointed bedrooms and living spaces, which offers a winning formula for total relaxation and indulgence. 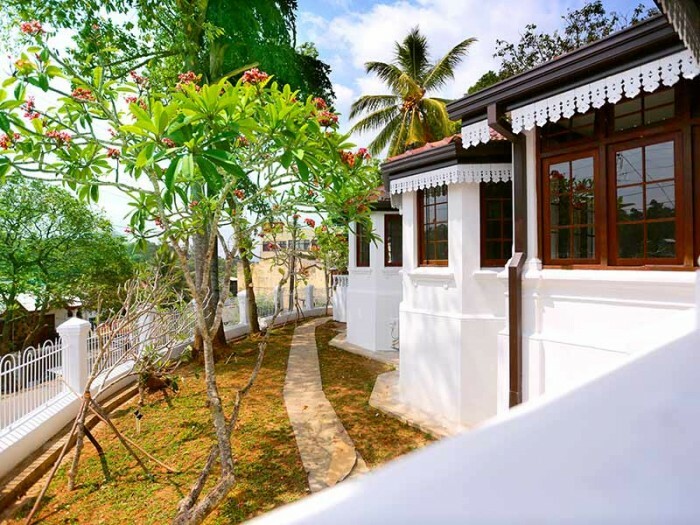 Built in 1884 by a pioneering Scottish tea planter to take advantage of the best views in the area, a significant restoration and renovation have updated the bungalow with modern day facilities and introduced a fresh new style to the property. 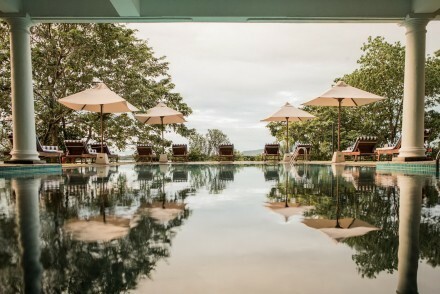 Luxury hotel and spa emulating the ingenious and innovative design of the famous 5th century water gardens of Sigiriya, which is within eye shot. 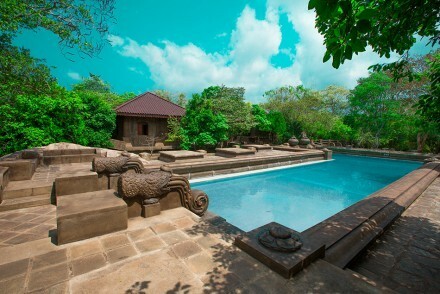 Thirty freestanding and over-sized villas, many with private plunge pools, are artfully dotted around the landscaped estate. Stunning Dutch colonial villa built in 1712 and fully restored with four luxurious and exquisitely decorated suites, a soothing lounge, a treetop infinity pool, and an English tropical garden complete with croquet lawn affording views over Galle and the Indian Ocean beyond. 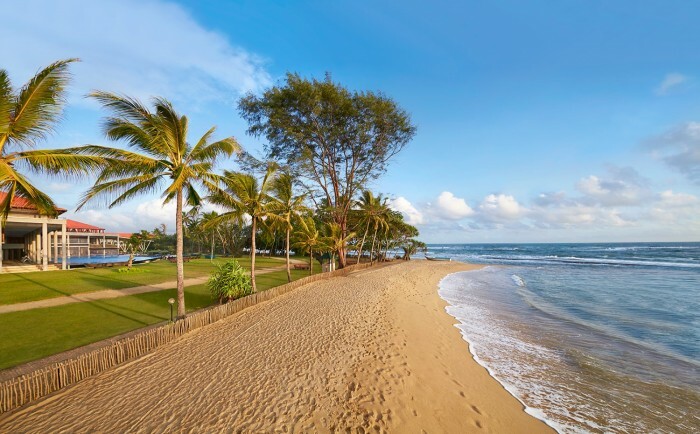 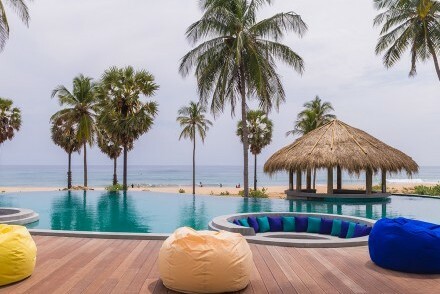 Beneath gently swaying coconut palms on a serene boulder-sprinkled seafront sits Kumu Beach, a contemporary beach hotel home to 10 generous bedrooms, chic living and dining areas basking in the open air, and a generous lawn with infinity swimming pool. 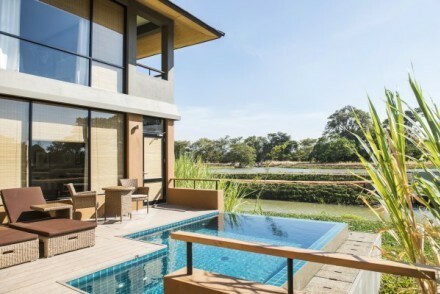 Nestled within extensive and beautifully landscaped tropical gardens, The Wallawwa is the unrivalled choice for a stylish stay close to the international airport. 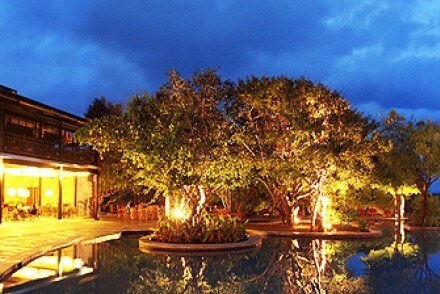 This colonial manor house is a private and secluded luxury hideaway for the perfect beginning or end to your holiday. A charming and an historic Burger raj colonial estate bungalow dating back to 1804 and sensitively restored to its previous grandeur. 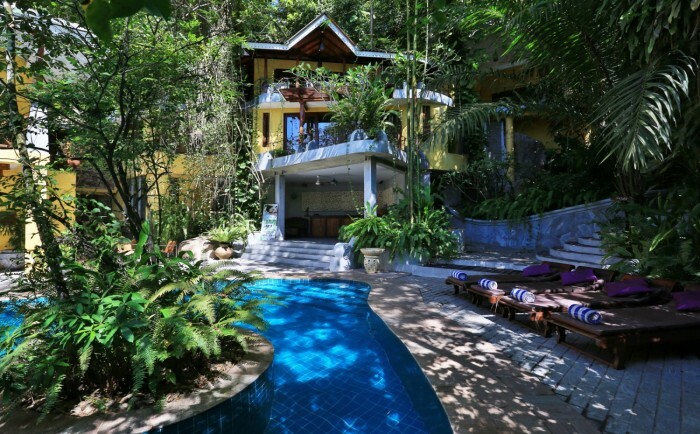 This stunning manor house has individually designed rooms and lush tropical gardens, with a secluded forest pool, envelope the property. 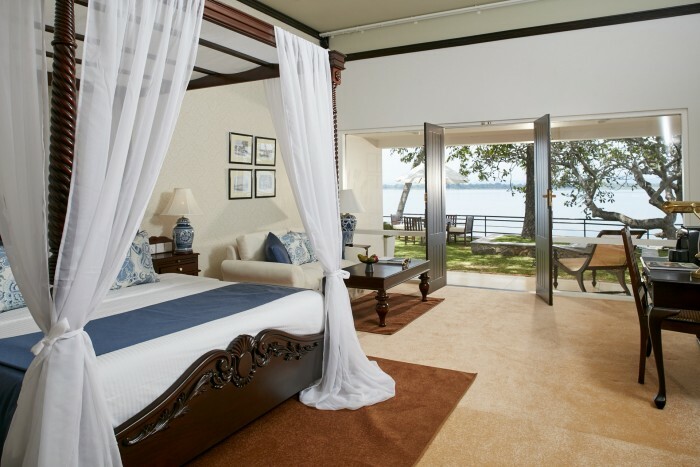 Contemporary tropical design fused with a Mediterranean theme set amidst swaying palms on a pristine beachfront, Uga Bay delivers perfectly calibrated luxuries for those who need to kick-back and relax with the sand between their toes. 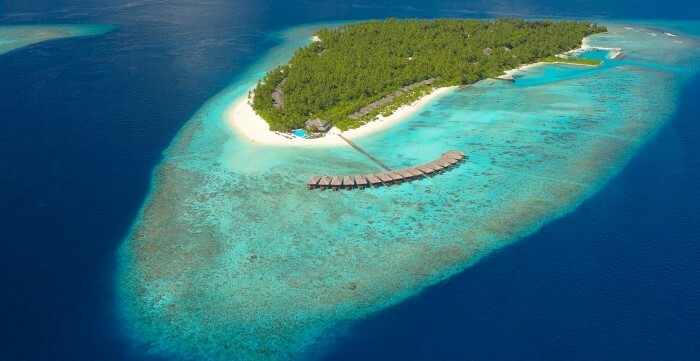 Surrounded by a beautiful turquoise lagoon and long stretches of coral white sand, and renowned for one of the best house reefs in Maldives, Vilamendhoo is a tropical paradise of palms, beaches, sparkling waters and colourful coral reefs teeming with marine life. Our Distinguished category includes a wide variety of styles of accommodation from traditional adobe-clad huts with palm leaf roofs and former tea planter’s bungalows to iconic hotels and colonial villas. 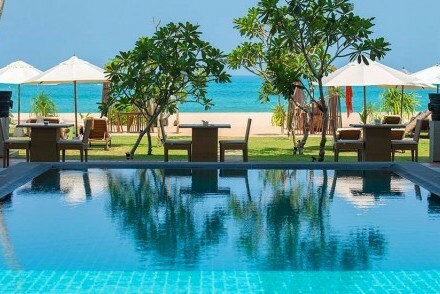 This is one of the key benefits of travelling in Sri Lanka since the island has an extra special place to stay to satisfy everyone’s taste and requirements. 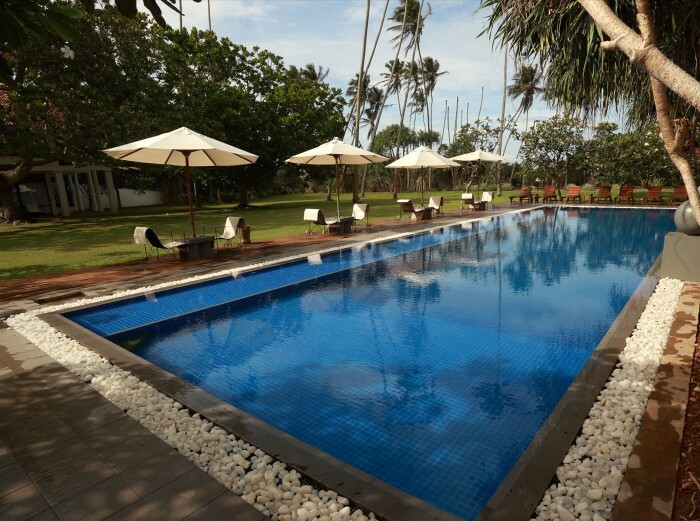 We currently offer Distinguished accommodation in all regions of Sri Lanka, with the exception of the North. 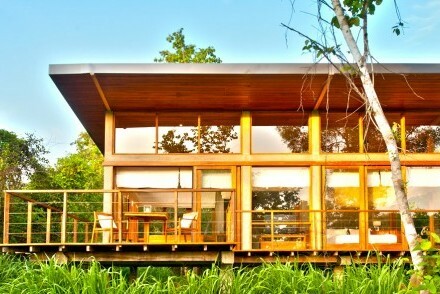 Below are outline details of sample Distinguished accommodation. 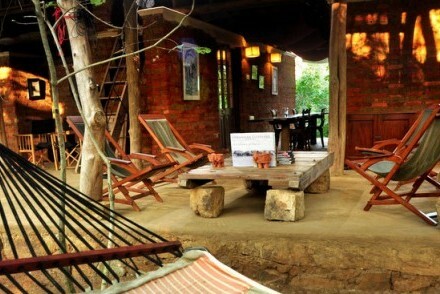 For more details, click on Trip Planner and log in for photos and in-depth descriptions of the accommodation available. Stunning colonial-era property within the original Lipton tea estate with five en suite bedrooms, study, drawing room, dining room, long room, veranda and inner courtyard. 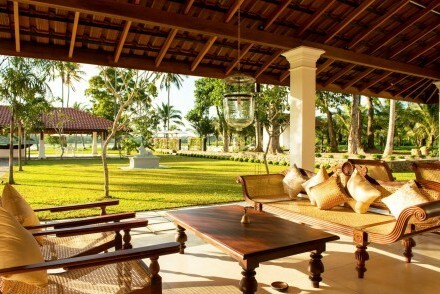 The grounds include a garden suite and cottage, a swimming pool, and a generous lawn for badminton or croquet. 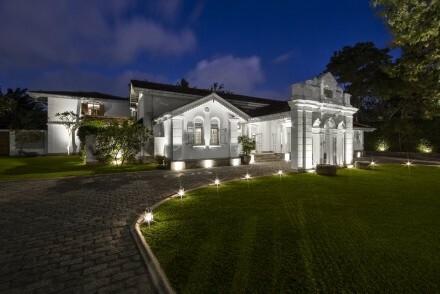 Unique and historic 11-suite luxury hotel in a secluded central Colombo location exuding an atmosphere of peace and tranquillity nestled between leafy Park Street and the lakeside Buddhist shrine of Gangaramaya - a delicate balance of old Sri Lanka and modern luxury. 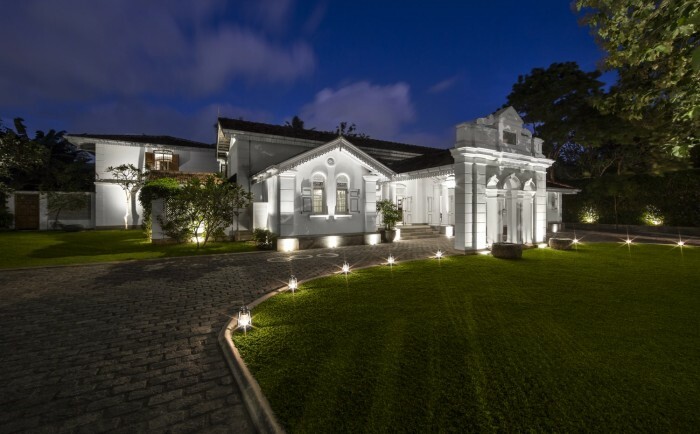 Luxurious boutique hotel set in a magnificently restored heritage home in the heart of Colombo and surrounded by galleries, boutiques, coffee shops, restaurants and monuments. Take a dip in the pool, relax in the library or enjoy a cup of tea in the garden courtyard. Originally created by Taru and inspired by traditional South Asian designs, The River House is a romantic escape that offers five unique suites on over five hectares of a lush tropical garden estate in perfect seclusion on the banks of the Madu Ganga. 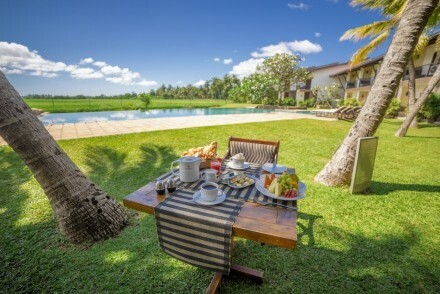 Idyllically tucked away in a secluded sandy cove of Balapitiya Beach, this peaceful and adult-oriented twelve villa boutique resort is hidden amongst Calamansi fruit trees and swaying palms at the edge of the calm, warm waters of the Indian Ocean. 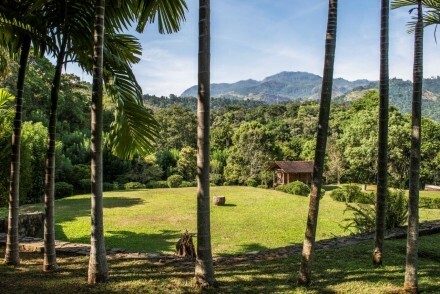 Escape to the south-eastern foothills of the central highlands, comfortably secluded in an atmosphere of traditional agro-luxury. 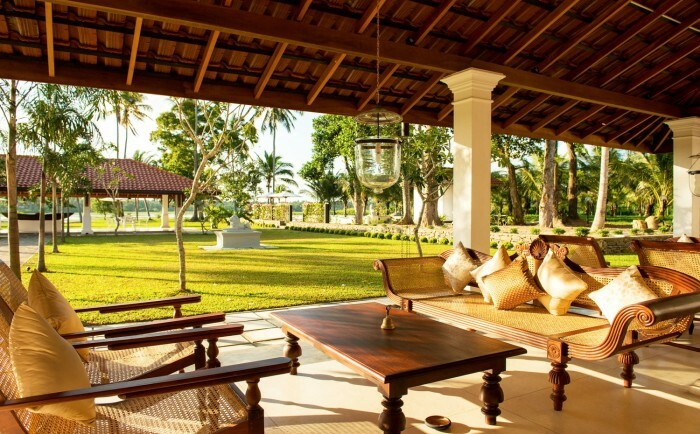 Nestled in the midst of lush paddy fields, the resort has been designed to resemble a traditional village surrounded by rural Sri Lankan landscapes. 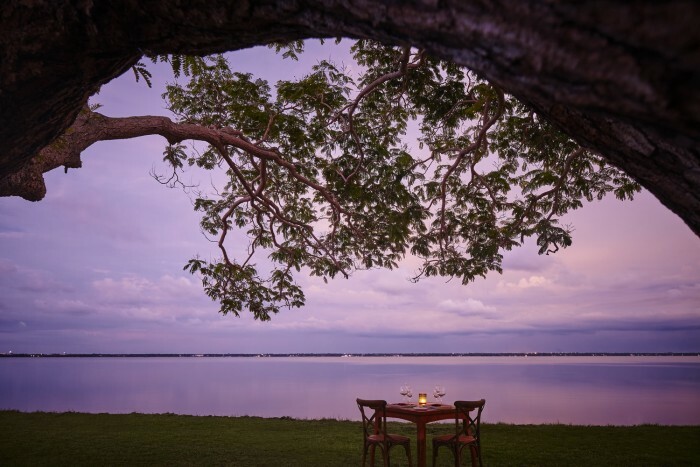 Hidden amongst 3 hectares of jungle in complete privacy in a sublime natural environment with plentiful birdlife and wildlife, this luxury hideaway is not far from the Wilpattu National Park entrance and consists of well-appointed safari tented villas set on stilts high above the ground. 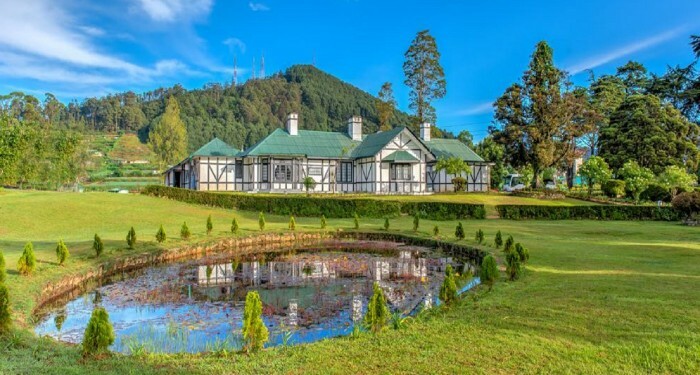 Step back in time and experience the magic of this exquisitely restored 19th century manor house, which has five luxury suites in a hectare of landscaped gardens with trees as old as the house in a quiet and enchanting location, perfect for couples and families. 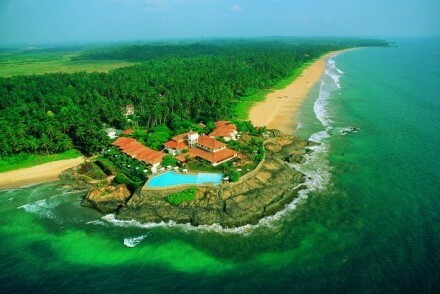 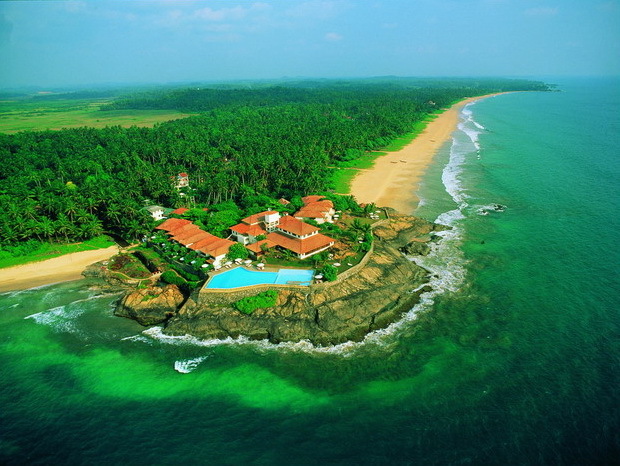 Luxury resort spread over a rocky outcrop along a secluded stretch of coastline. 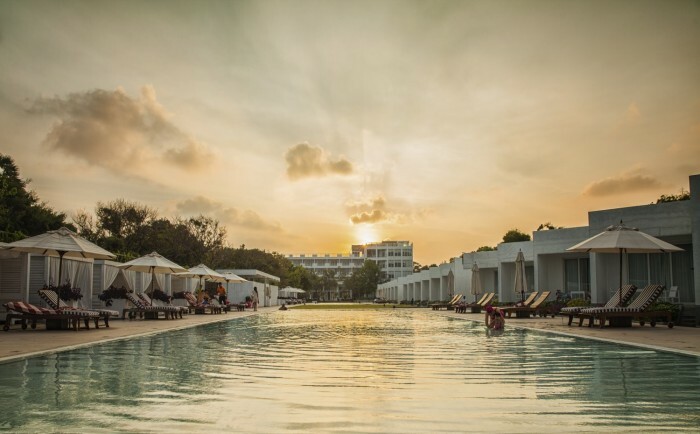 Set amidst a coconut plantation and golden crescent shores with glorious Indian Ocean views, the resort offers a naturally exclusive hideaway for exotic beach life in a tranquil world of your own. 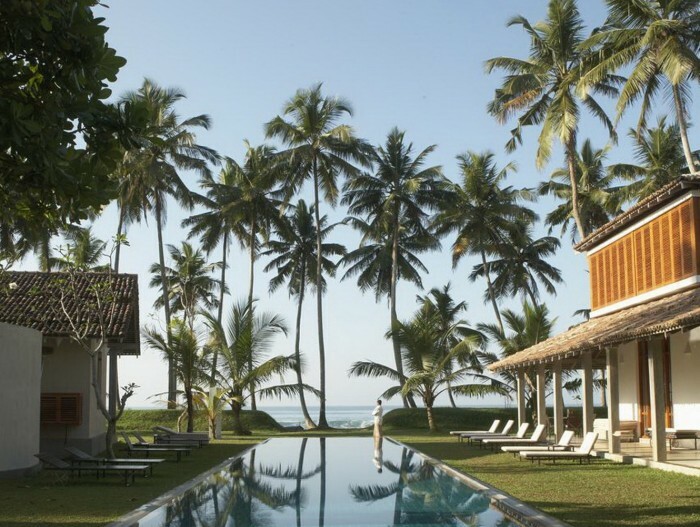 The final private project of Geoffrey Bawa, Sri Lanka’s most celebrated contemporary architect, is located on a curve of a gorgeous pristine sandy bay. 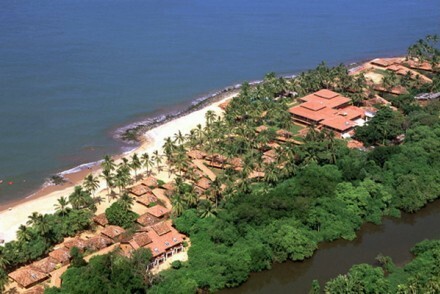 With barely another soul to be seen, this is a destination for relaxing in tranquillity beside the ocean. 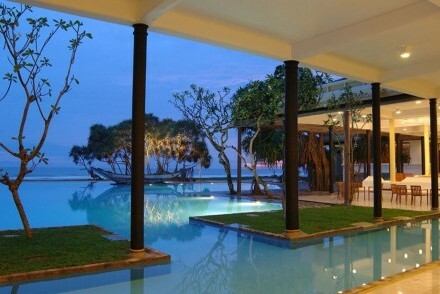 An intimate colonial-style villa overlooking the pristine beach and crystal clear waters of tranquil Mawella Bay. 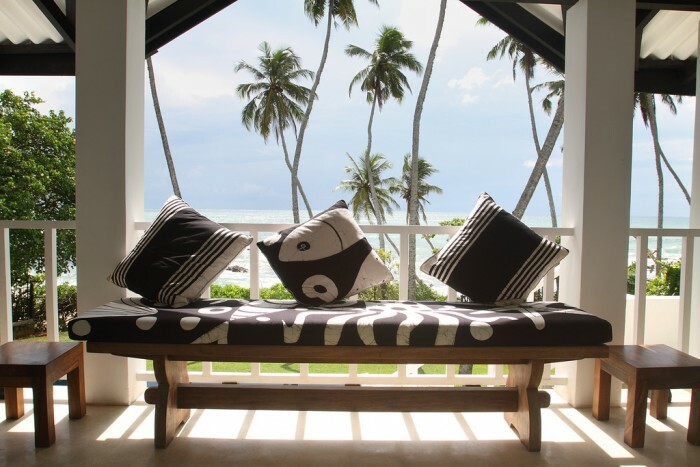 The six-bedroom beachside villa set in a generous tropical garden offers a unique experience that respects nature, celebrates privacy and nurtures luxury in equal measure. 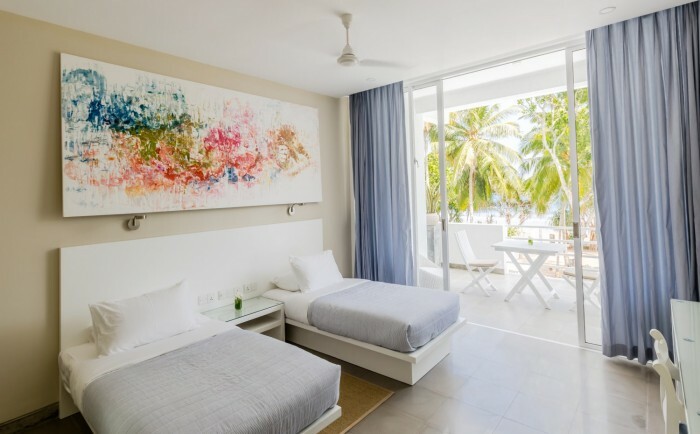 Colourful beachside bar and grill, with boutique accommodation upstairs, and another wonderful Mawella Beach property by Taru, the enigmatic designer and hotelier of all things stylish. 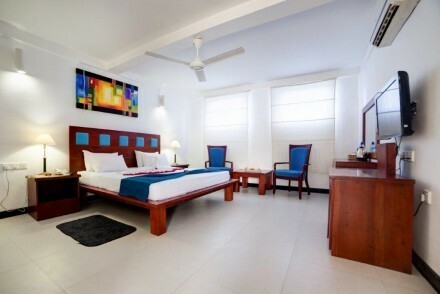 The three large and well-appointed twin bedrooms offer a small hotel experience by the beach. 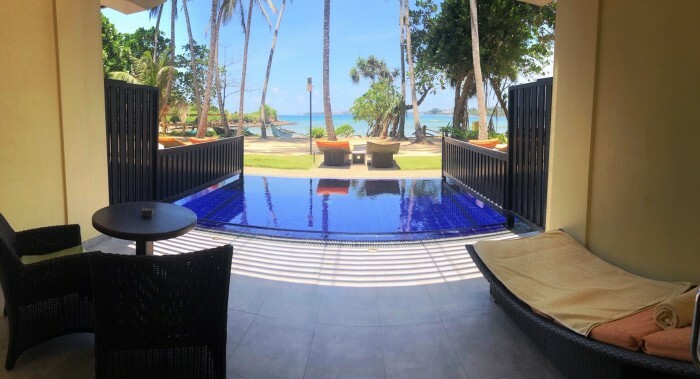 Overlooking picturesque and undeveloped Mawella Beach, this fully serviced villa with resident staff boasts two en suite double bedrooms, a charming garden with a dining pavilion facing the beach and a 9.5-metre long swimming pool at the rear of the property (uniform 1.35-metre depth). 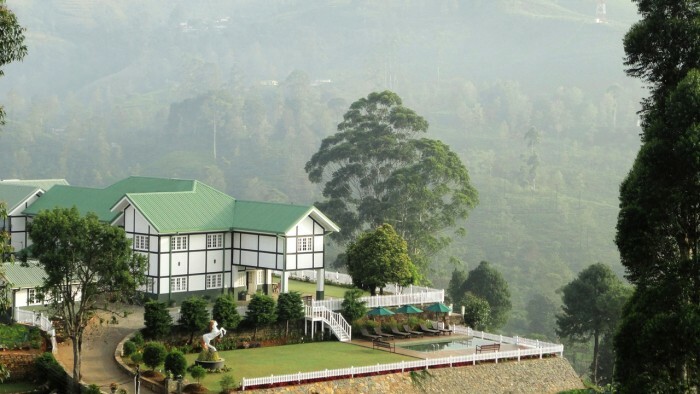 Set against a lofty mountain backdrop in tranquil jungle surroundings demarcating the tea and paddy terraces in the northern region of Sinharaja rainforest, this all-suite boutique hotel allows you to be close to nature while being indulged in luxury. 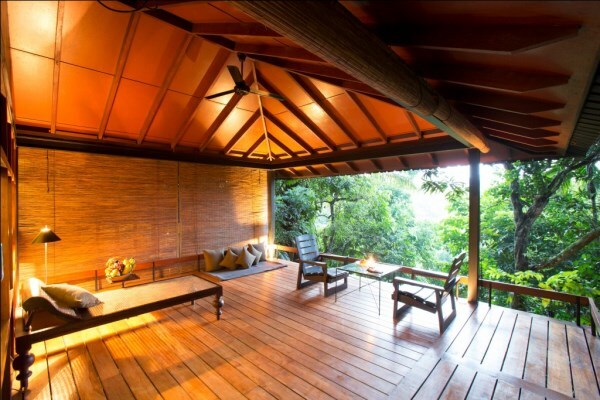 Tucked away in the wilderness of the southern region of Sinharaja rainforest and seamlessly blending sophisticated luxury with a comfortable immersion in nature, the award-winning lodge is designed to minimise its impact on the environment through a closely managed sustainable development. 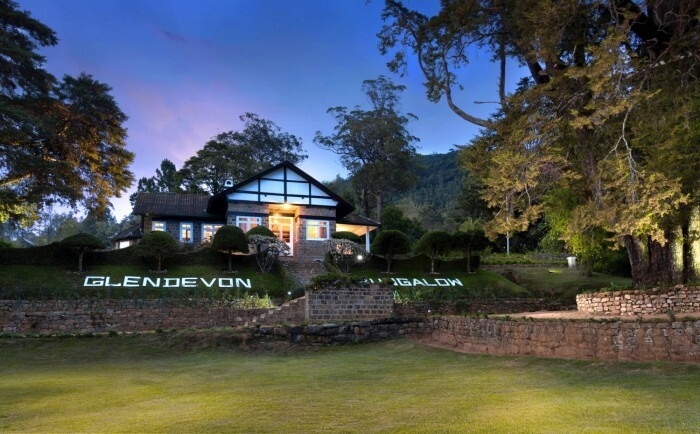 Spectacularly placed within extensive tea gardens and surrounded by mountains, this refurbished 19th century tea estate bungalow retains the genuine air of a typical rustic English cottage despite being nestled in the countryside around Shanthipura, Sri Lanka’s highest elevated village. 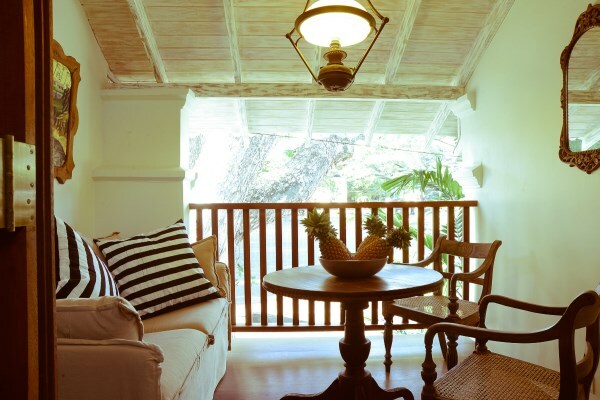 Built in the 1880s for a pioneer of tea in Sri Lanka, the bungalow is incredibly well preserved with original features throughout. 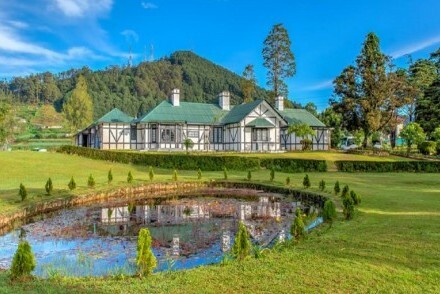 In keeping with the Scottish laird heritage of the owners, the architecture is reminiscent of a hunting lodge in the wilds of Hibernia. 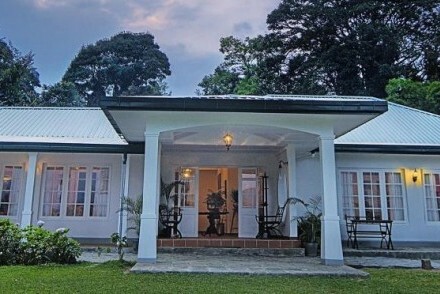 Surrounded by the verdant velveteen slopes of the ubiquitous tea plantations, this extended colonial-era property close to Nanu Oya railway station offers 13 comfortable bedrooms with modern facilities as well as an old world charm of days of yore. 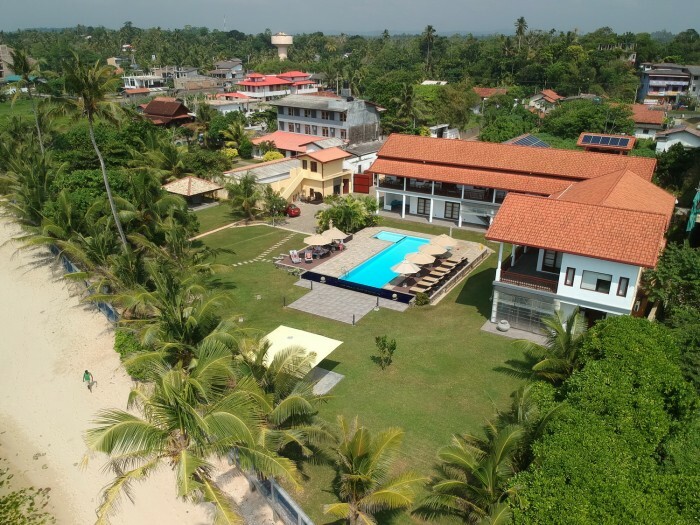 Another Jetwing luxury beachside hotel taking the legendary brand of Sri Lankan hospitality to the world from their popular seaside home town. 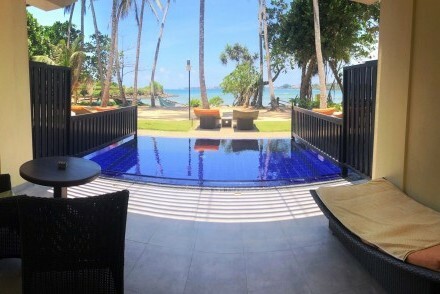 Built where their original villa resided nearly half a century ago, the new hotel provides similar accommodation to Jetwing Beach next door. 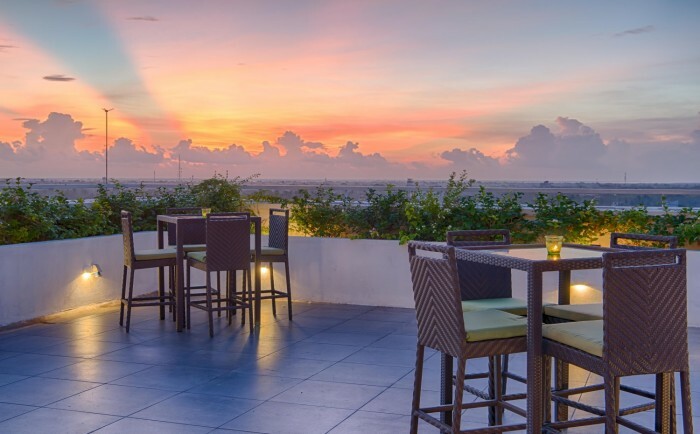 In the buzzing coastal resort of Negombo, this luxury beachside hotel offers cosy, comfortable and quiet bedrooms with colourful décor to reflect the vibrant surroundings, tranquil spaces to kick back and relax, and a rooftop lounge bar to enjoy the spectacular sunsets. 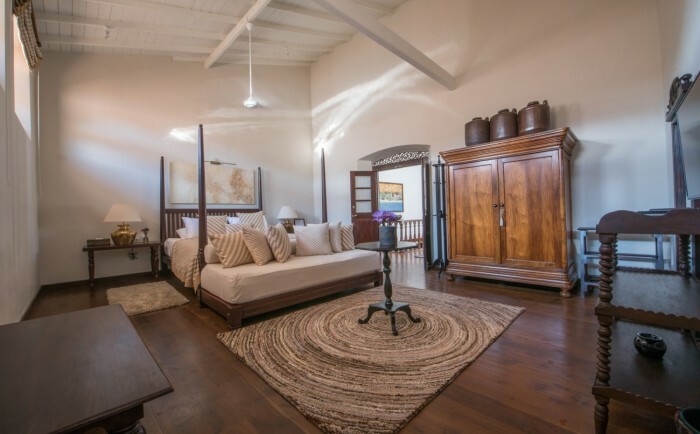 The integrated boutique Ubuntu concept shares the same spirit and feeling as the original Lantern Boutique Hotel close by, creating a relaxed environment and tastefully appointed rooms with private and communal areas for guests to chill out and relax. 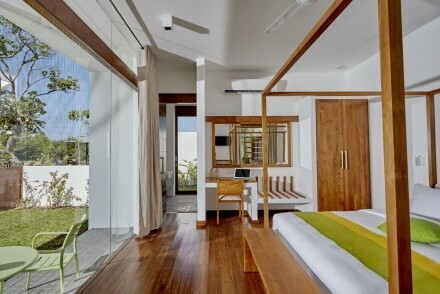 Refreshingly modern, yet consciously sustainable, it is the epitome of exclusivity and unique among local boutique hotels. 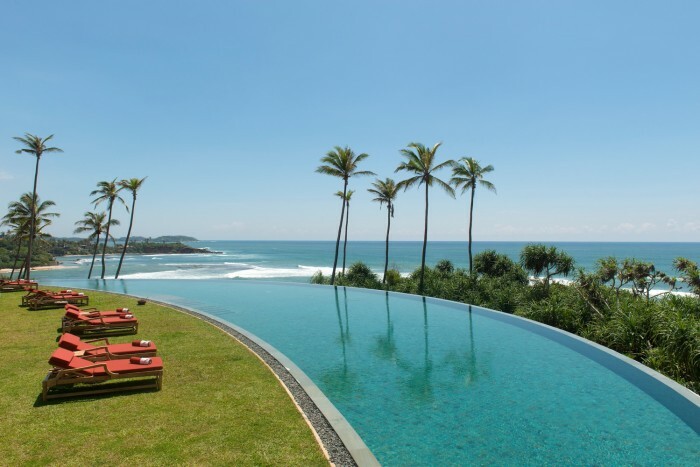 This luxury villa and spa occupies a deceptively large beach side plot with the mesmerising Indian Ocean waves rolling ashore beyond the sparkling swimming pool. 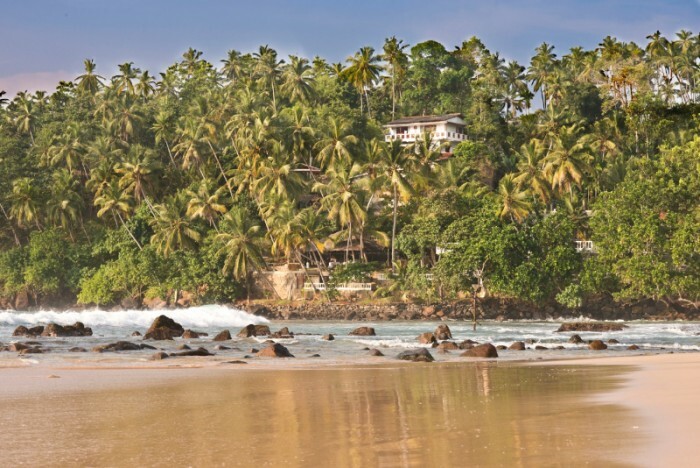 Set in a stunning location in terraced grounds overlooking gorgeous Mirissa beach and with panoramic views of the bays beyond, it is a sympathetically designed hotel, in part homage to Bawa and colonial traditionalism, offering surf-chic luxury and direct beach access. 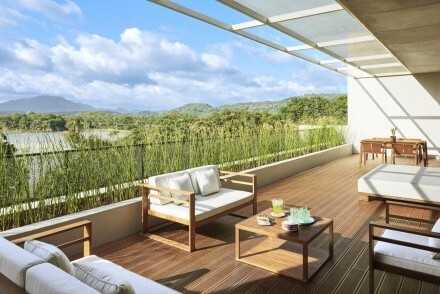 The signature hotel of the Lantern group exemplifies the nature and sentiment of the boutique concept. 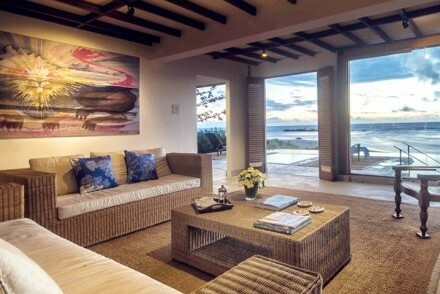 Intimately connecting rooms and private spaces, with communal areas that also encourage interaction, with the freedom to move from one space to another. The quintessential Kerala houseboat experience – in Sri Lanka! 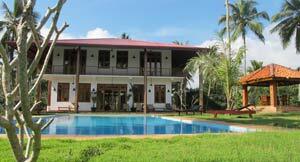 The island’s first backwaters houseboat cruise and accommodation. The chance to enjoy a cruise along the Bentara River, with dinner under the stars and breakfast upon the open deck in the sun. 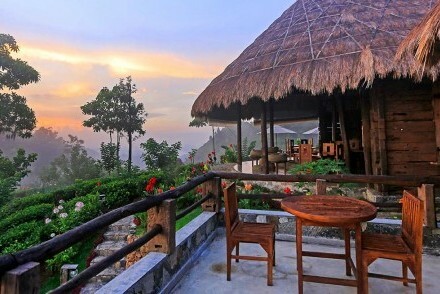 Eco-boutique hotel with spectacular mountain views, lush jungle ripe for exploration and a tranquil lake frequented by elephants, wild boar, deer, wild rabbits, peacocks, land monitors and more than 40 varieties of birds on the doorstep of secluded luxury villas. Encircled by high peaks and lush woodland traversed by a myriad of watercourses, The Glenrock is a luxury hideaway providing a naturally relaxing experience hidden on the banks of a cascading rocky river, and nestled between Horton Plains, Adam's Peak and Rabbit Rock. 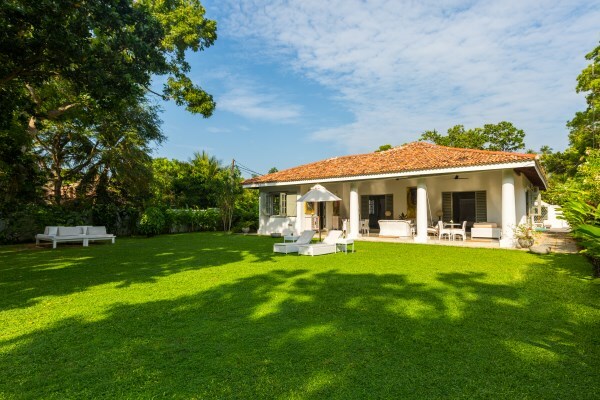 An historic colonial-era bungalow lovingly restored with a combination of original period furniture and chic interiors that complement the ambience of an authentic Ceylon Planter’s estate. 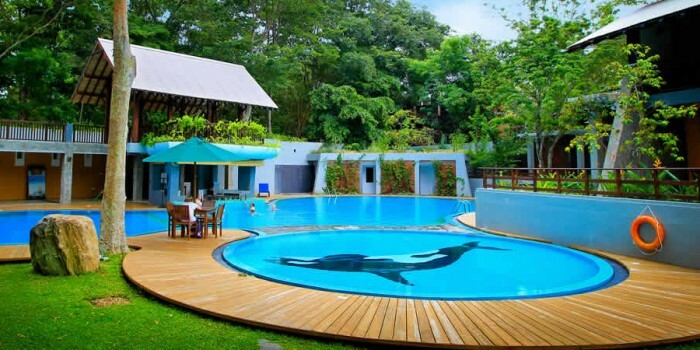 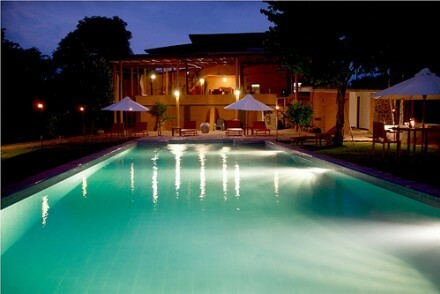 This hilltop boutique hotel offers elegant rooms, a swimming pool and occasionally a resident elephant in the garden! 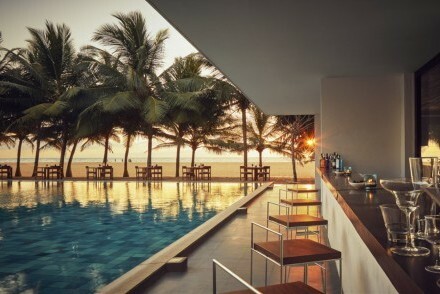 The Muse is another iconic bijou hotel designed by Taru, an enigmatic and truly creative designer of all things stylish. 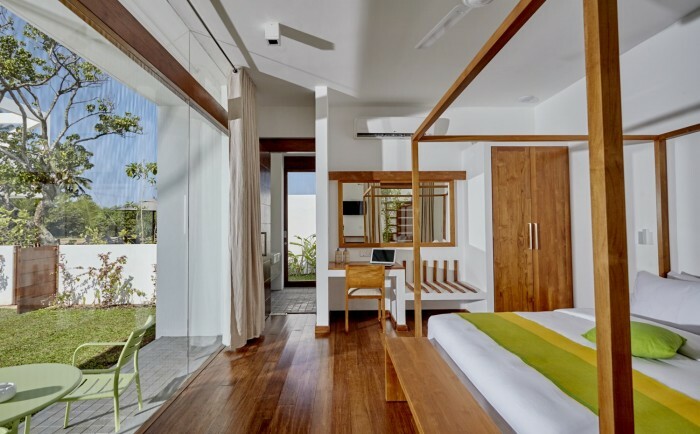 It is the reincarnation of Taru’s first property, Taprobana, which originally set the benchmark for small, contemporary hotels on the island. 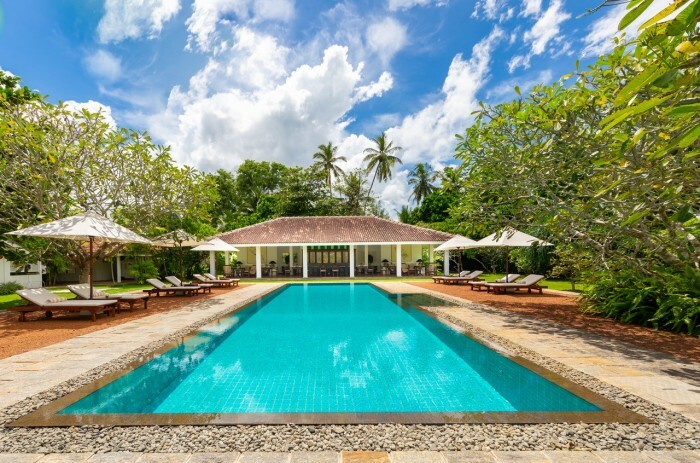 An enchanting 170-year-old walauwa set amidst a hectare of tranquil tropical gardens, with coconut palms overhead and fragrant frangipani blossom. 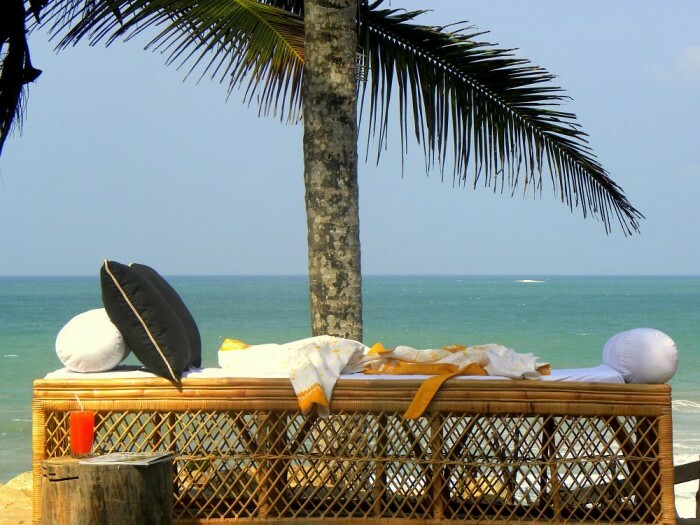 Ideally situated on an attractive coastline, the intimate ambience, soothing pace and unpretentious service makes for a relaxing beach stay. 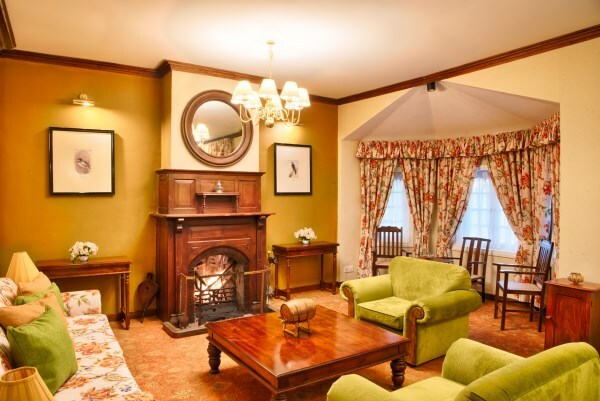 Built in the 1800s for a Dutch merchant and his wife, this classically restored boutique hotel has an eclectic mix of traditional features, antique furnishings and a clean modern aesthetic steeped in a rich history and with a quaint charm. A unique and private hotel, situated in the heart of Colombo and offering ten individually designed suites with all modern amenities and services. 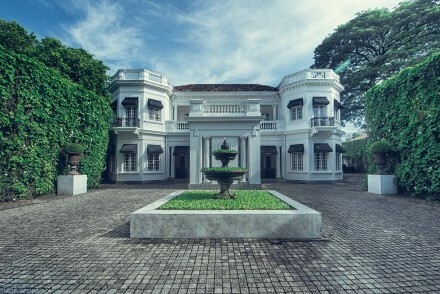 The hotel is housed in a stunning heritage residence that was previously home to three of Sri Lanka’s political leaders. Sensitively converted 19th century colonial manor house and Sri Lanka’s first boutique hotel, designed by Geoffrey Bawa. 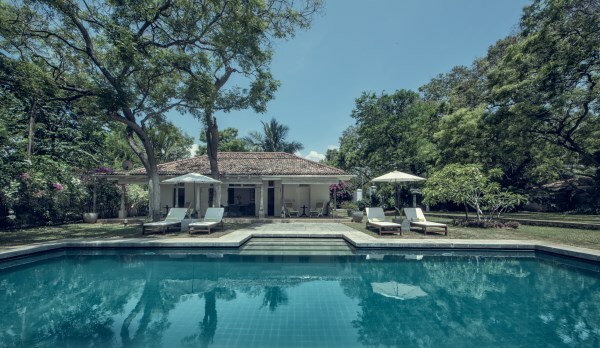 The updated and expanded villa is true to the original Bawa aesthetic, with soothing palettes complimenting the Dutch chandeliers, Jaffna folk art and Chinese ceramics. 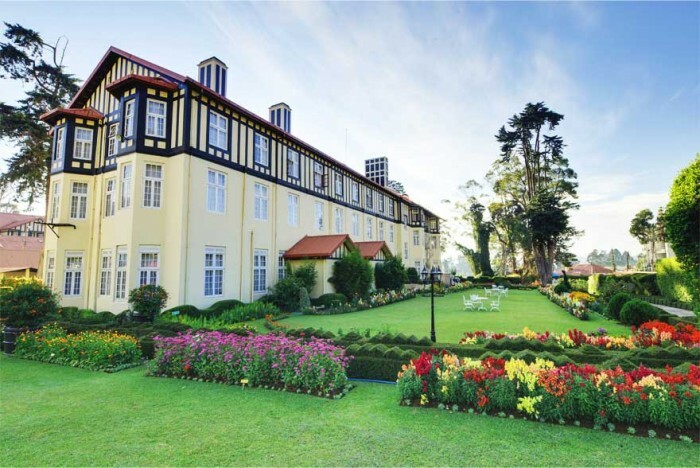 Step back in time and wake up to the charms of living the life of a tea planter in the early 1900s. 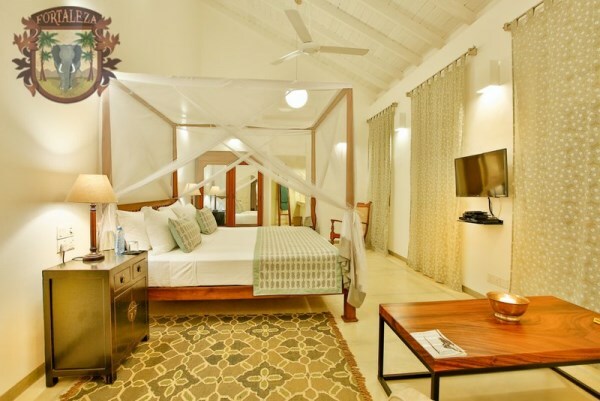 The colonial ambience of the bungalow is preserved today in the elegant décor, the modest luxury and the warm, deferential service. 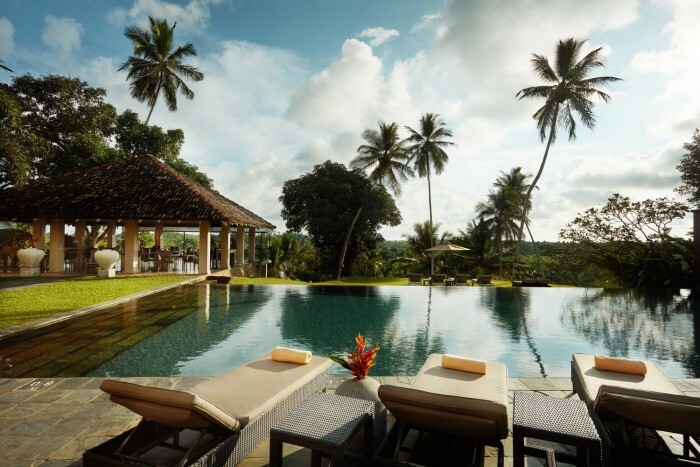 The house and gardens at Lunuganga were lovingly created over several decades by the world renowned architect, Geoffrey Bawa, as his vision of a tropical garden idyll. 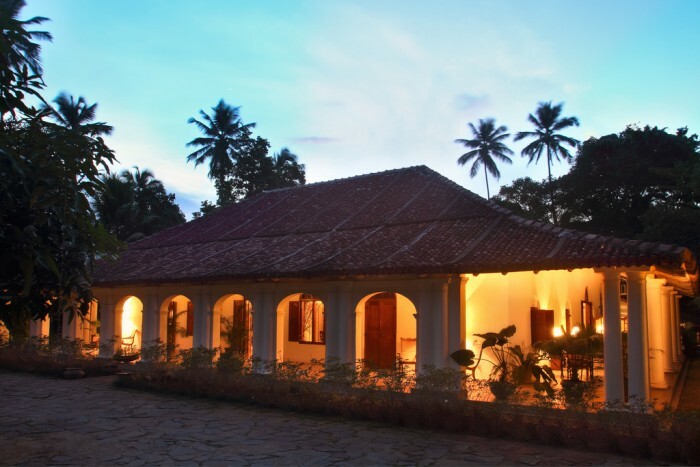 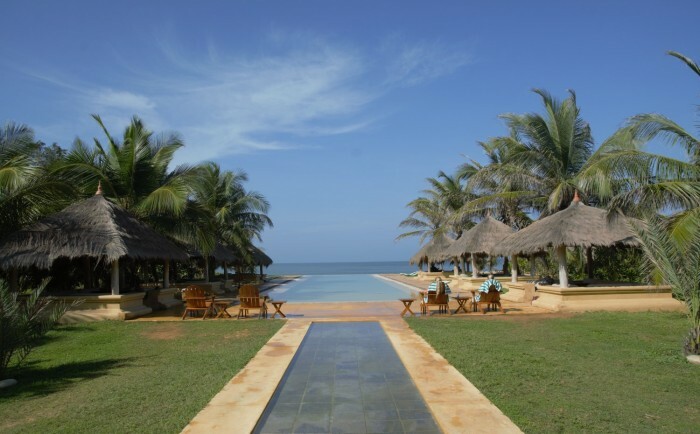 Lunuganga offers you the opportunity to stay in an unequalled heritage property. 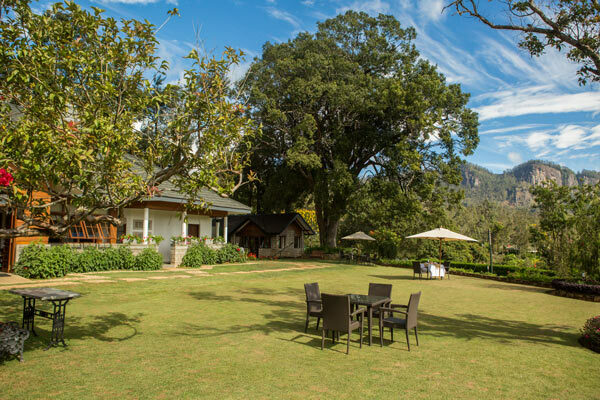 Set in over 30 hectares, this isolated luxury boutique hotel celebrates Sri Lanka’s traditional architectural design and borders a patch of dense woodland known locally as ‘God’s Forest’, which contains a river and a secluded waterfall within walking distance. 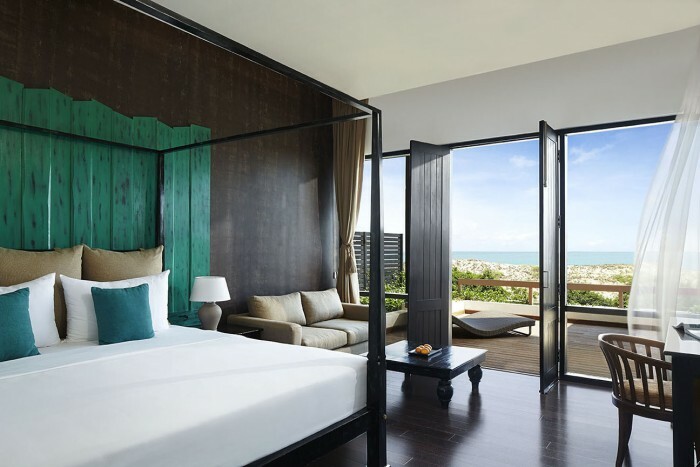 Contemporary and stylish beachfront boutique hotel with just ten rooms and suites overlooking a beach that stretches as far as the eye can see and the Indian Ocean beyond. 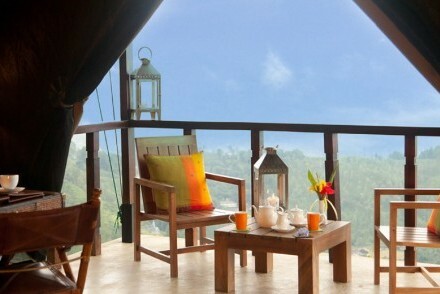 A chic south coast alternative offering delicious food and comfortable accommodation. 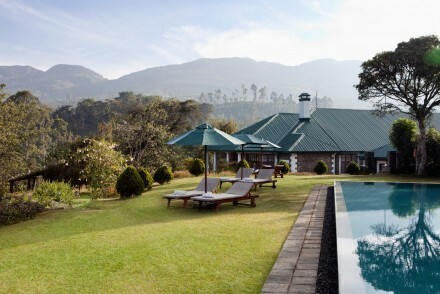 Luxury retreat immersed in 40 hectares of lush countryside with a dramatic mountain backdrop. Set in beautiful natural surroundings designed to soothe the senses, the eclectic abodes have fine interiors and cosy comforts as well as features such as a plunge pool or Jacuzzi. 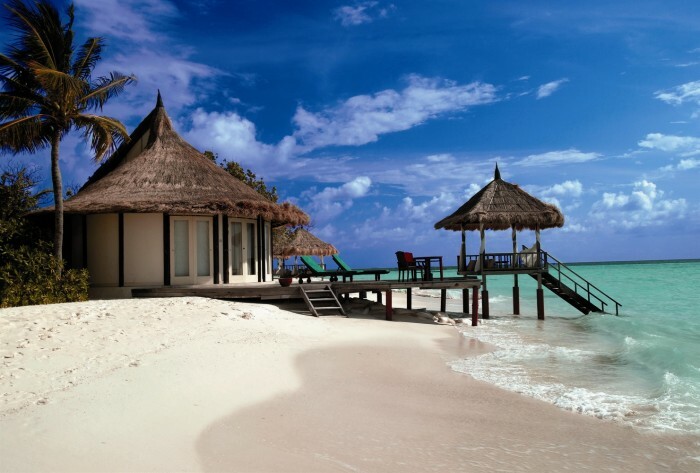 Luxury eco-resort styled on a typical Maldivian island, with high-pitched, grass roofed rondoval cabanas finished in earthen hues and spacious, open-plan interiors. The infinity pool, bar and restaurant overlook a deserted beach with a ‘secret’ surfing breakpoint just off shore. 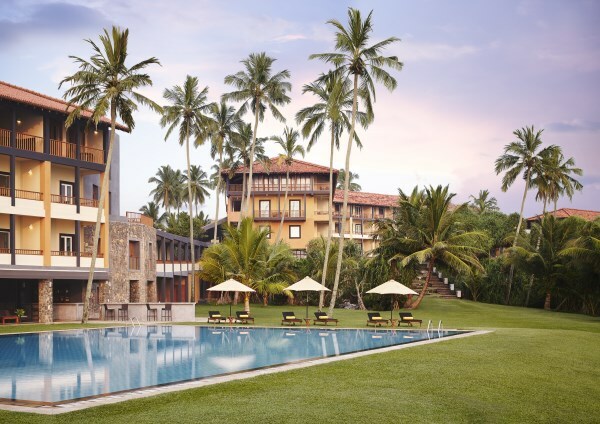 Luxury hotel and spa designed by Geoffrey Bawa, Sri Lanka’s most celebrated contemporary architect, offering world-class accommodation and facilities, and al fresco dining in superb surroundings. The overall architecture creates an atmosphere resembling Moorish palaces, ocean liners, manor houses and colonial villas. 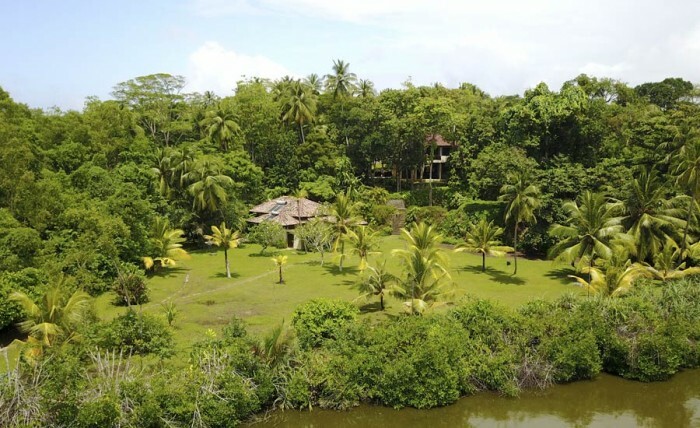 Jetwing Kurulubedda, or ‘Jungle of Birds’, is a sustainably built, luxury eco-retreat surrounded by paddy fields and hidden amidst foliage on a quiet stretch of the Kepu Ela waterway and 10 minutes inland from its sister property, Jetwing Lighthouse. Horathapola Estate is an ancestral home immersed in the verdant and fertile countryside of Kurunegala District, an area famed for its coconuts, and one hour's drive from the airport. 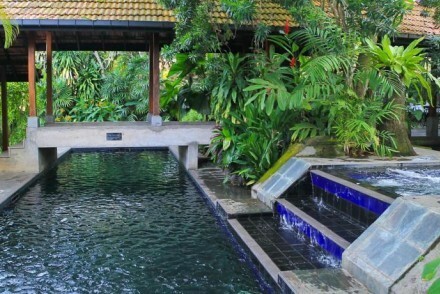 The two-storey mansion house is impeccably turned out, and overlooks the sparkling swimming pool, Jacuzzi and waterfall feature. 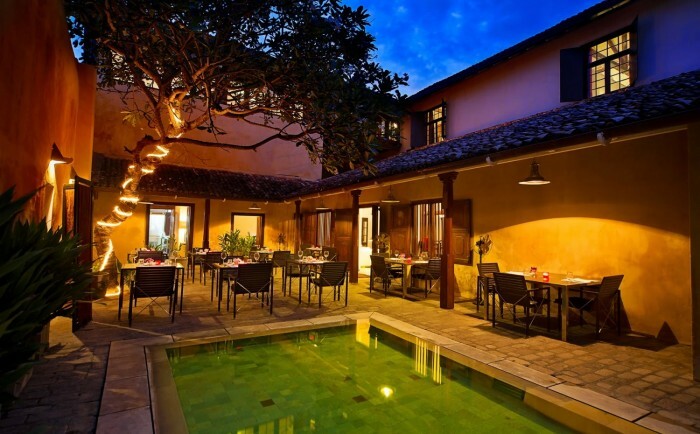 Renovated 17th century Dutch colonial-era villa with delightfully eclectic rooms and suites set around a fabulous colonnaded courtyard swimming pool. 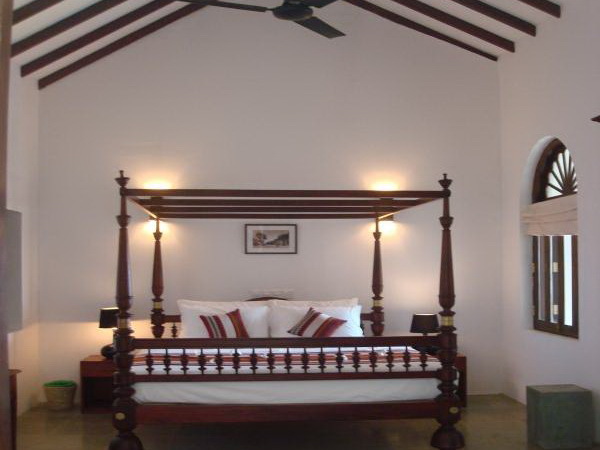 The bedrooms evoke a sense of colonial grandeur with their crisp, white bed linen, antique furniture and minimalist styling throughout. 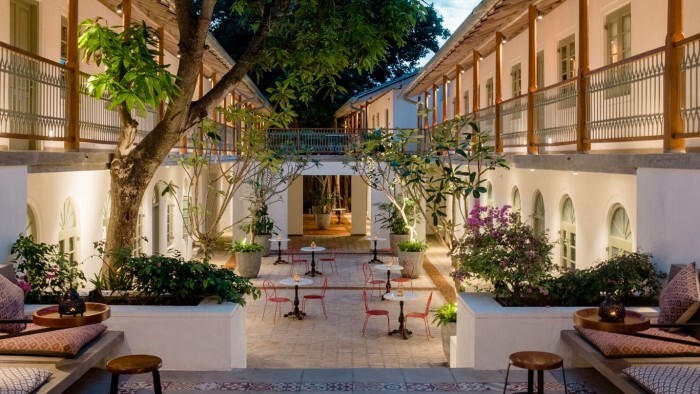 Handsome 17th century merchant’s home redefined as a luxury town house hotel with 18 stylish guestrooms and fresh, contemporary interiors invoking a Middle Eastern vibe. 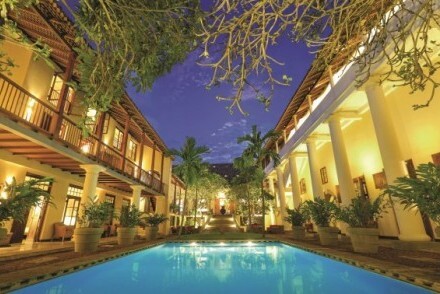 This boutique spa hotel promises serenity, top-quality service and modern gourmet dining within the Fort. 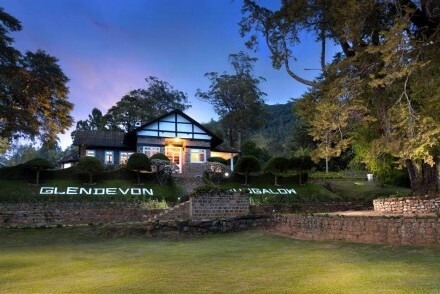 A home-away-from-home set high in the hills outside of Kandy, Ellerton is a characterful and tranquil colonial-era tea plantation bungalow imbuing an informal and relaxed country house atmosphere and surrounded by extensive, well-tended gardens with panoramic views of the spectacular northern Hill Country landscape. 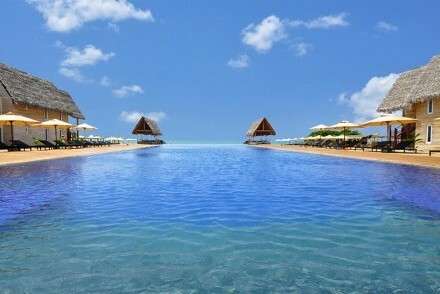 Luxurious resort overlooking a golden sandy beach and azure blue lagoon safe for swimming during the season. 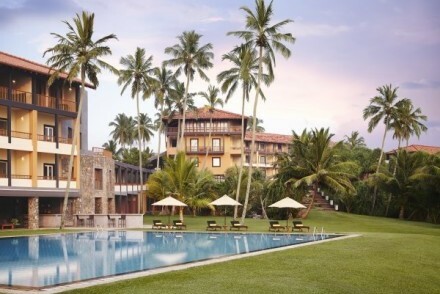 Blending Beruwela’s Moorish heritage with contemporary style and comforts, this 5-star beachfront hotel has extensive, coconut palm-strewn grounds and spacious, well-furnished bedrooms. 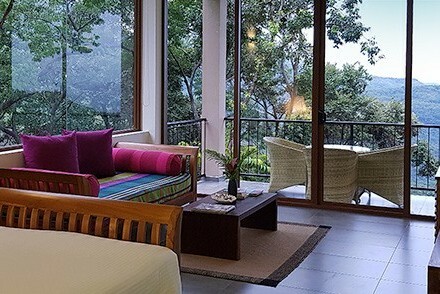 Bougainvillea Retreat is situated on the vast private estates of Victoria Golf and Country Resort overlooking Victoria Reservoir from a raised vantage point at the end of a narrow and winding track, an anomalous access considering the opulence within! 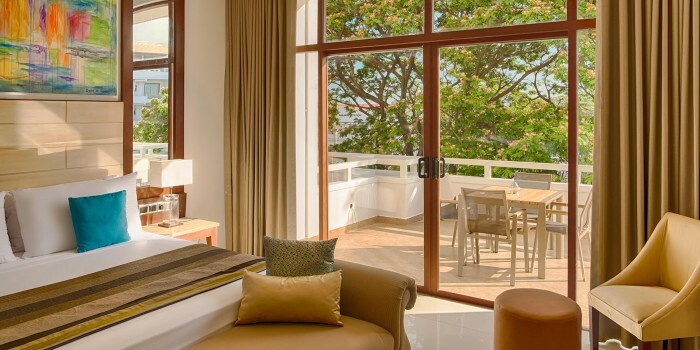 Combining chic design, impeccable personal service and quality cuisine to create an exquisite beachside experience with an elegant contemporary feel, The Frangipani Tree is an intimate beach sanctuary of nine beautifully furnished suites immersed in an attractively landscaped garden. Sensitively converted former tea factory (UNESCO Heritage Award 2001) idyllically situated in the middle of its own tea plantation with superb views of the surrounding spectacular countryside. 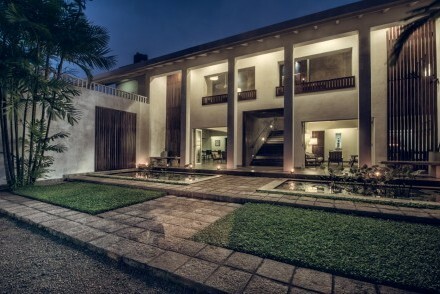 Magically, the tasteful transformation has retained the essence of the building’s previous life. Named after the coastal landscapes that have drawn travellers here for centuries, this chic and stylish beachfront hotel offers a luxury stay in refined surroundings, which is enhanced by the fusion of Sri Lankan minimalism and modern sustainable architecture. 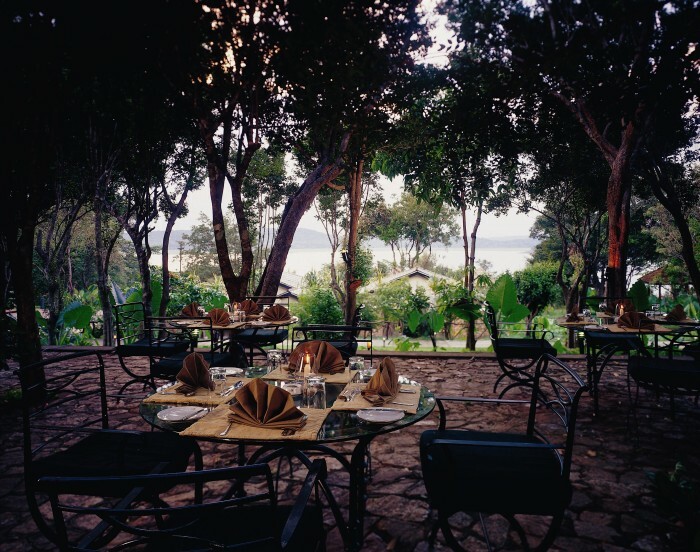 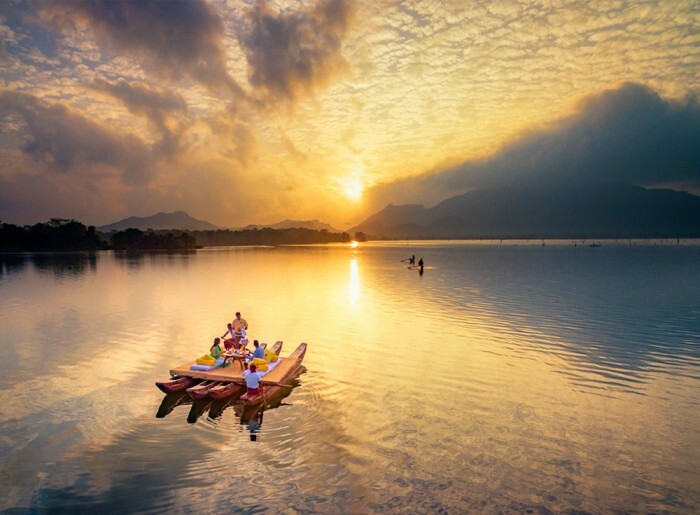 Lake Lodge Kandalama is an intimate and stylish hotel set in two hectares of private grounds with panoramic views of Kandalama Lake and the Pothana Hills beyond. 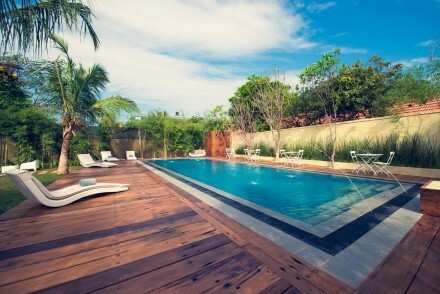 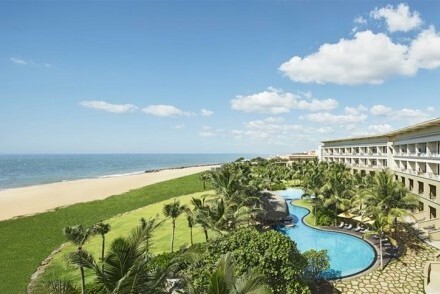 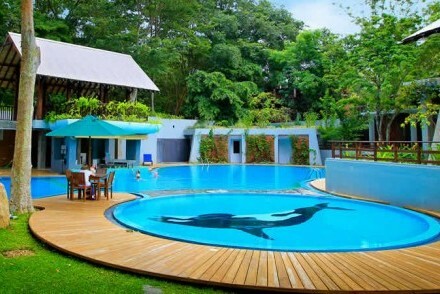 The 12 spacious and well-presented rooms are complemented by a serene pool and open-air restaurant. 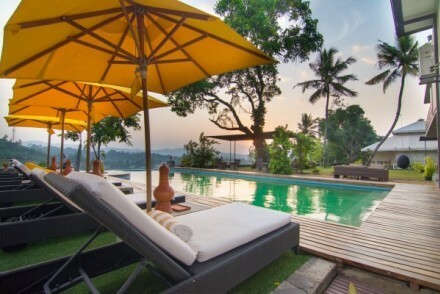 Eco lodges scattered over a terraced hillside tea estate and centred on a faux tea planter’s bungalow encircled by a colonnaded veranda furnished with reclining ’steamer’ chairs and a large swimming pool affording possibly one of the finest views anywhere on the island. A bijou boutique experience with a taste of rustic sophistication on the island’s unexplored east coast. 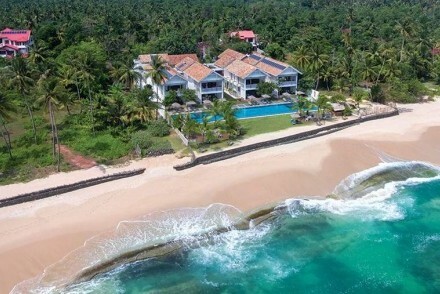 This four-bedroom oceanfront villa has a prime position on a secluded white sandy beach within striking distance of Sri Lanka’s surfing centre, Arugam Bay. 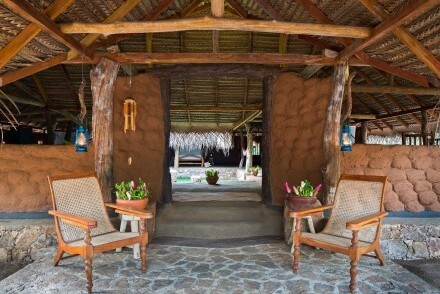 An authentic eco-retreat based around a well-developed community project in one of the least visited areas of the island. 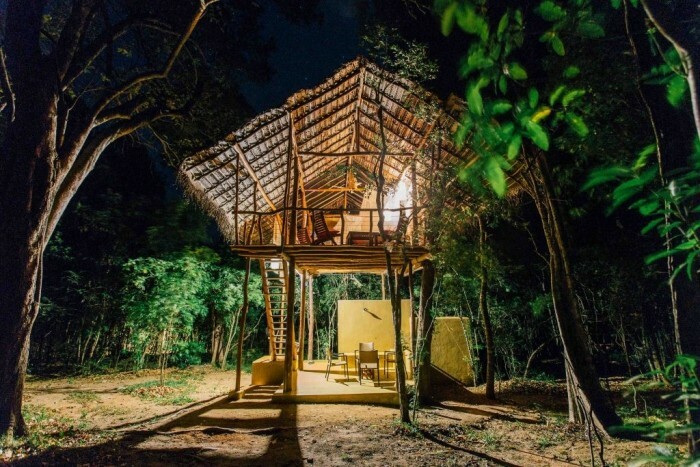 Flanked by lakes and blessed with abundant birdlife, wildlife and natural beauty, the uniquely designed huts are all constructed with natural materials sourced locally. 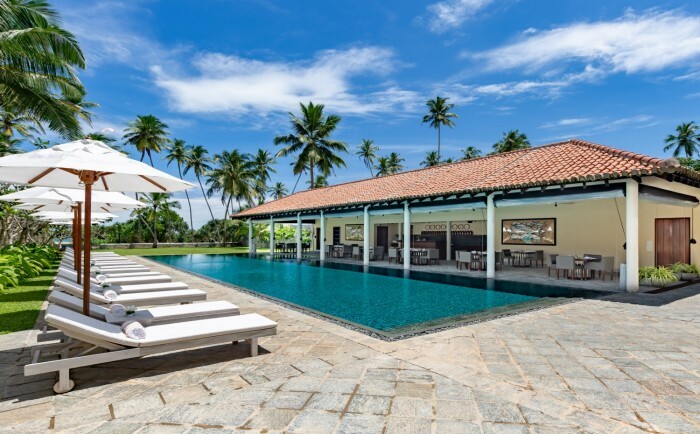 Built on the concept of a traditional Sri Lankan fishing village (‘Waadiya’), the elegant and eco-friendly architecture seamlessly blends with the white sandy beaches and dazzling blue seas under the tropical skies of the tranquil east coast. Sri Lanka is known for quality accommodation at a reasonable price and our Heritage category is no exception. 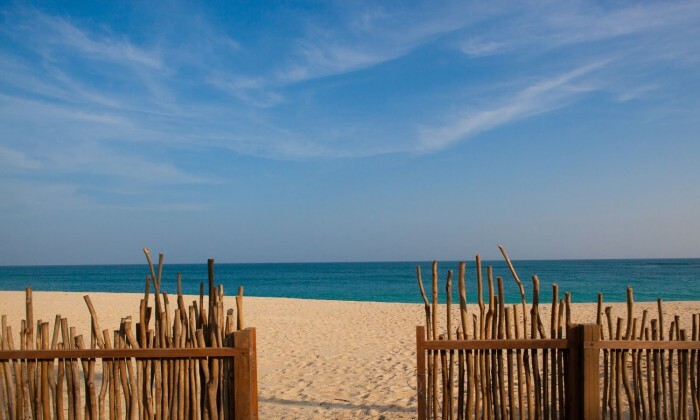 Choose from a special selection of former forts, rustic beachside cabanas, boutique hotels and contemporary resorts. 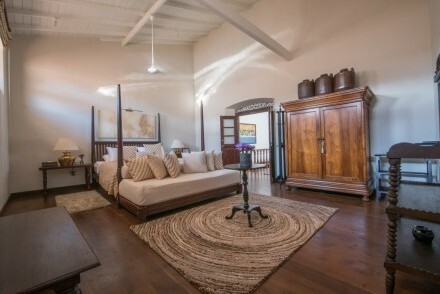 The high standard, unique character and value for money of our Heritage accommodation will be a welcome surprise to many! We offer Heritage accommodation throughout Sri Lanka. Below are outline details of sample Heritage accommodation. 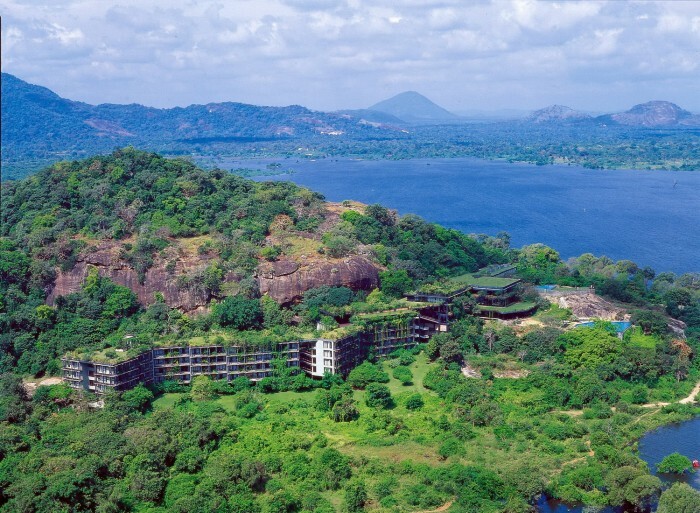 For more details, click on Trip Planner and log in for photos and in-depth descriptions of the accommodation available. 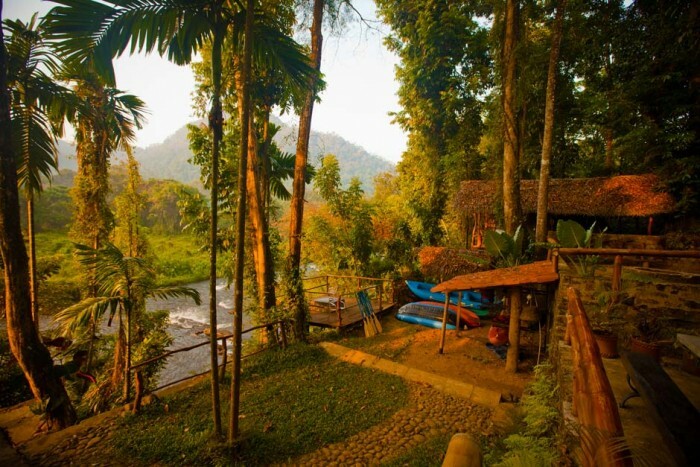 Sited on a hill overlooking the Kelani River, the eco lodge and jungle camp provides a ‘glamping’ experience for those who need a certain degree of comfort. Surrounded by mountains and the clear, rushing river below, the site is truly stunning. 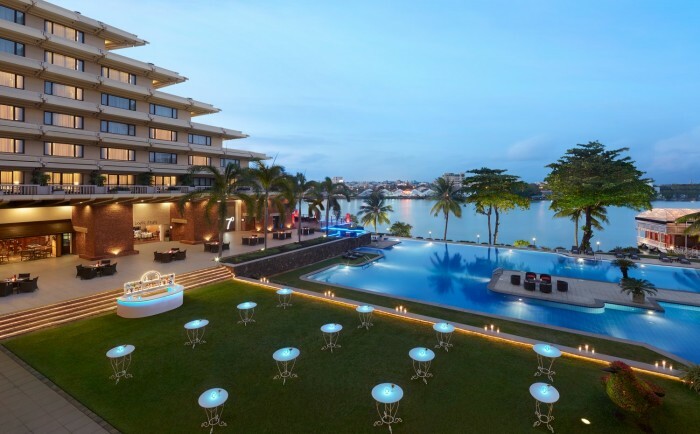 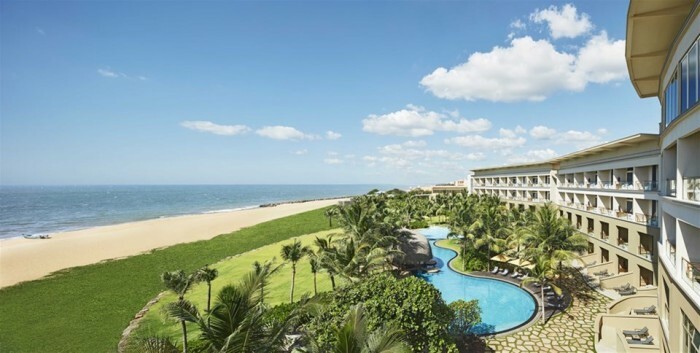 Luxury resort hotel in the heart of Colombo overlooking Beira Lake and the bustling city, housing the largest city swimming pool, spectacular landscaping and a floating restaurant. 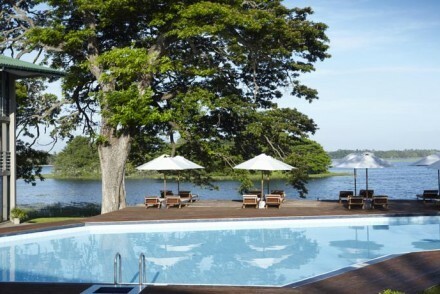 Most of the 346 rooms offer private terraces with breath-taking views of the poolside and lake beyond. 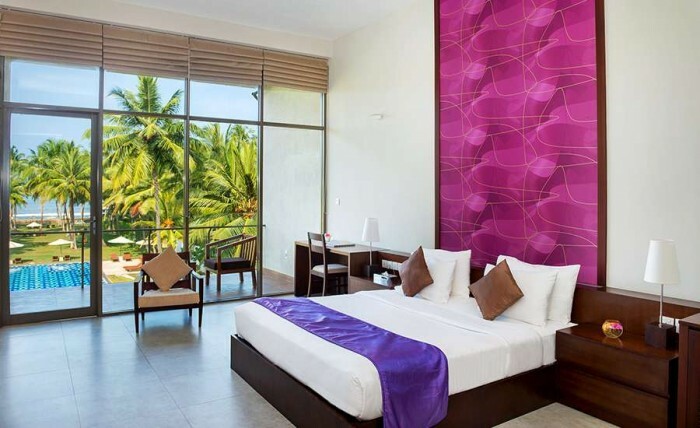 Located directly on the ocean front overlooking a quiet stretch of sandy beach, this contemporary boutique-style hotel has lofty and light living spaces, and all rooms offer stunning views of the Indian Ocean, providing a luxurious environment to kick back and relax. 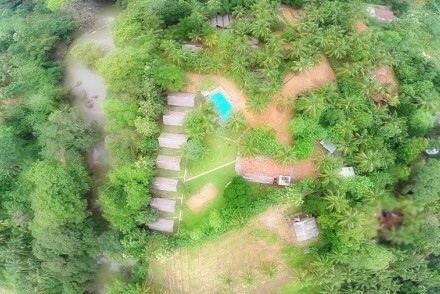 Unique boutique hotel amidst large tropical gardens and around 45 minutes' drive from the airport. 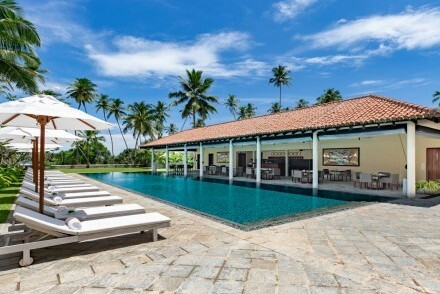 Traditional and contemporary Sri Lankan architecture complements the property's heritage, which offers spacious a/c rooms with balconies, a swimming pool and hearty food in a relaxing setting. 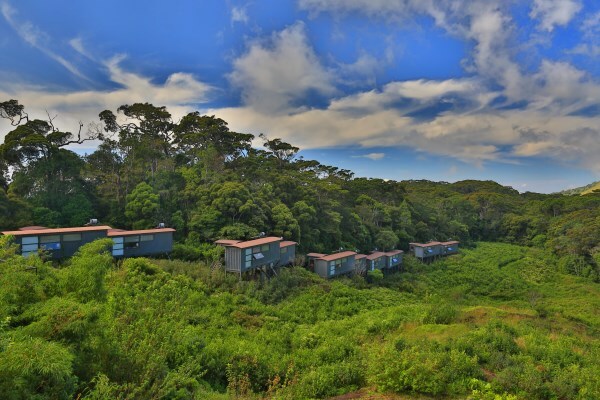 Wild Trails was born from a passion for camping deep in the jungle and experiencing nature in its purest and most rustic form – with modern creature comforts. Large tents on raised platforms with comfortable bedding and amenities makes you forget that you are in the wilderness. 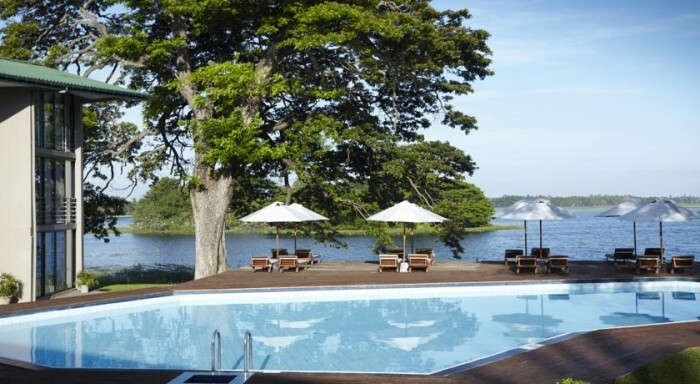 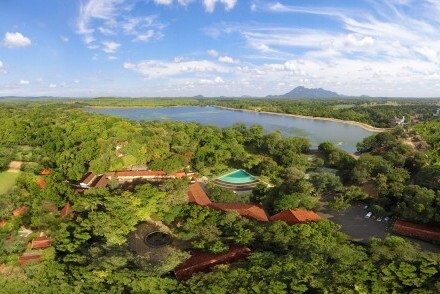 Luxury resort and spa committed to sustainability, with one of the largest privately-owned solar arrays in the country, and close to the entrance to Yala National Park. 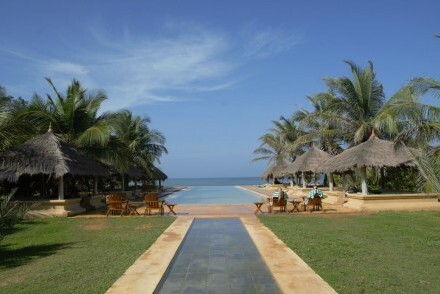 The hotel has developed a beachside lounge area, which allows you to relax by the ocean between safaris. 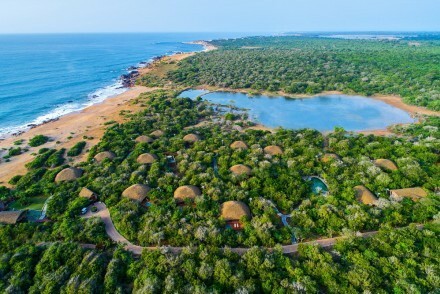 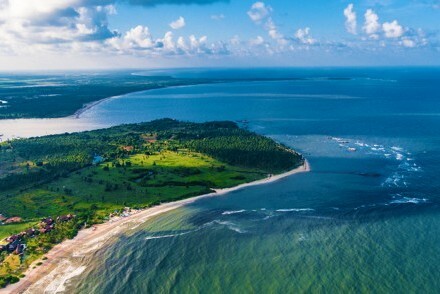 Accredited eco-friendly resort that has been designed to blend into its surroundings covering nine hectares of land on a mangrove-clad peninsula on the beach in a coastal wetland estuary where two rivers converge with the Indian Ocean, about 20 km northwest of the airport. Fresh, bright and chic with a contemporary take on a luxury beachside hotel, Taprobana boasts four unique dining venues, the Amoda Spa, an azure blue swimming pool and direct access to the golden sandy shores of the Indian Ocean. 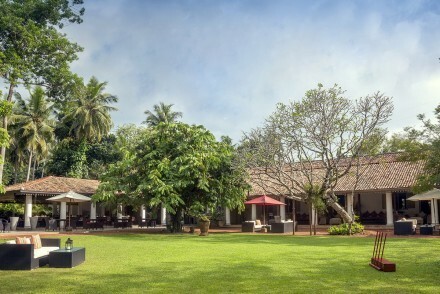 Conceived as a vast urban palazzo by the legendary architect Geoffrey Bawa, the design of the hotel is a cool and palatial version of a traditional rest house, with a lofty entrance porch and a long arcade running across a large garden. 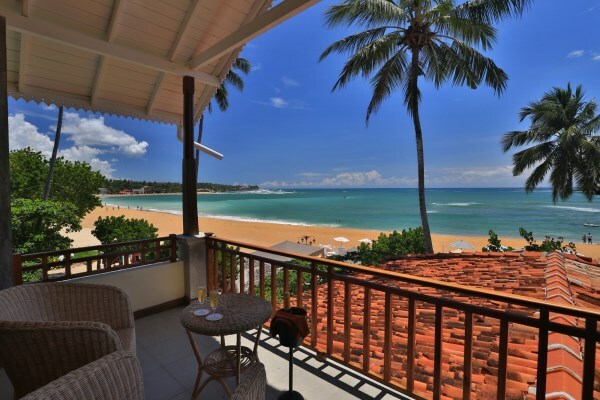 On a secluded sandy beach lapped by the clear warm waters of the Indian Ocean and overlooking Galle Fort, this luxury boutique hotel has a protected bay safe for swimming and surfing, and comfortable ocean view rooms, some with a private plunge pool and Jacuzzi. 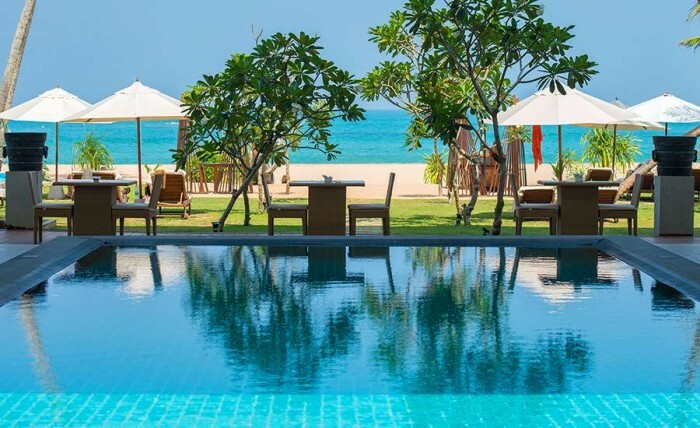 Seven superb suites housed in three distinct villas built in the Balinese style on the beachfront with picturesque views of the Indian Ocean over coconut palm-strewn lawns offering Queen/King-size beds, designer bathrooms and tranquil sanctuaries opening on to private terraces. 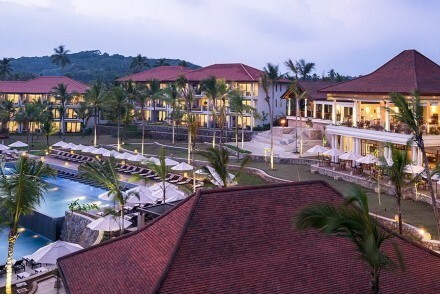 Surrounded by three hectares of grounds on the boundary between the island’s wet and dry zones, the hotel has been constructed to preserve the natural ambience of the jungle under the shade of the stately Kumbuk trees within the grounds. 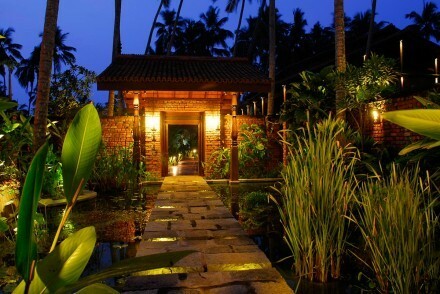 Locally-run hotel and spa set in generous shaded grounds on the banks of tranquil Yoda Wewa (lake). The serene and calm surroundings complement the comfortable rooms, all with spectacular lake views. 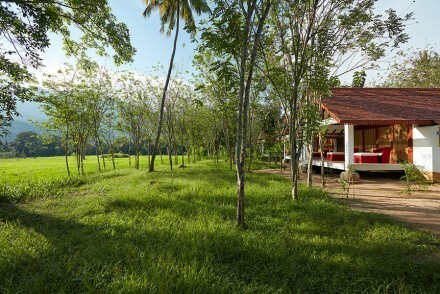 The resort is a specialist centre for Ayurveda therapies. 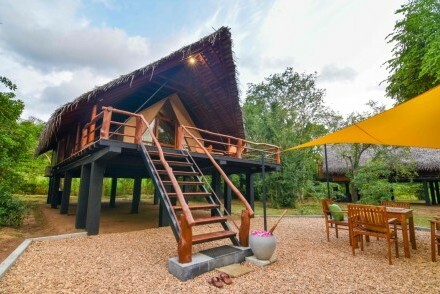 Eco-resort based on the back-to-basics concept of living in a traditional Sri Lankan village and enjoying simple pleasures. 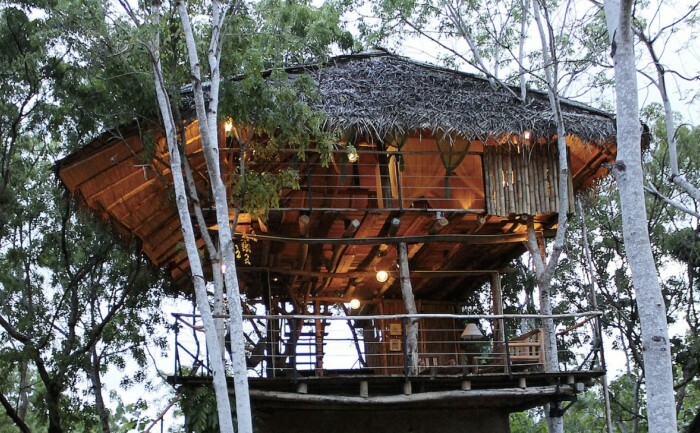 The tree houses and adobe huts with Illuk (grass reed) roofs are spacious and comfortable with all mod cons and en suite bathrooms. 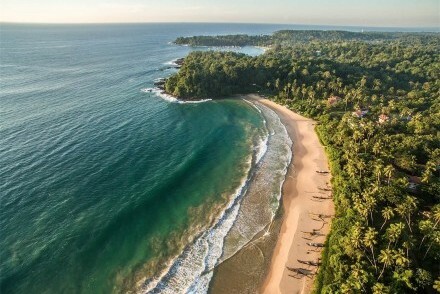 A luxury stay in an environmentally and socially sustainable way is promised at Turtle Bay, which is designed for modern tropical living yet informal to make you feel at home. 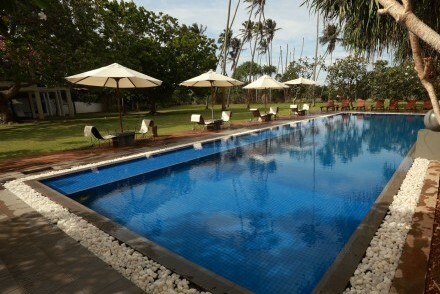 The service is discreet and intuitive to let you relax in the tranquillity of the location. 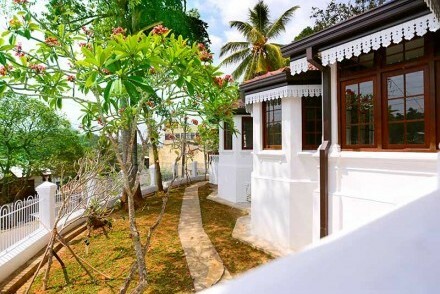 Refurbished historic beachside bungalow restored to the typical ’Black and White’ house design popular throughout colonial Asia in the early 20th Century. 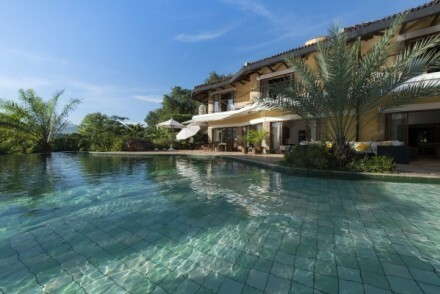 The six-bedroom villa consists of the main house with four bedrooms and an adjoining annexe with an additional two bedrooms. 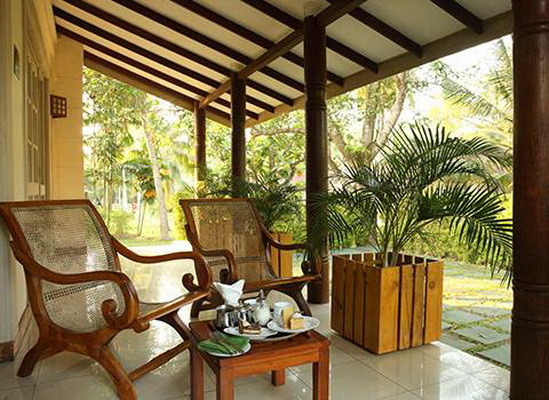 Set against the backdrop of Sinharaja rainforest, the resort is a real ’get-away-from-it-all’ jungle retreat without compromising on comfort or facilities. 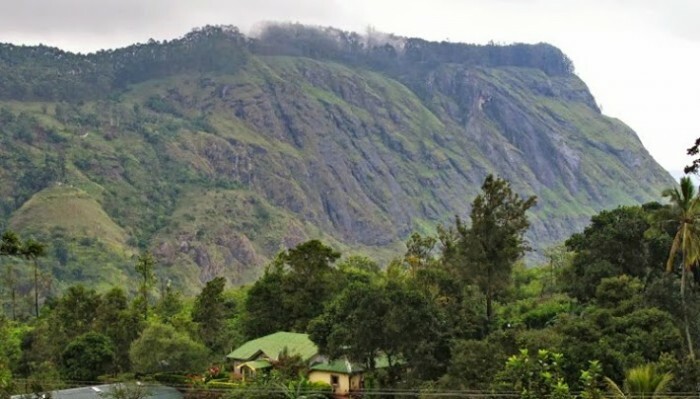 The northern region of the national park is a haven for birdwatchers with 48 bird species, including 12 endemics, spotted locally. 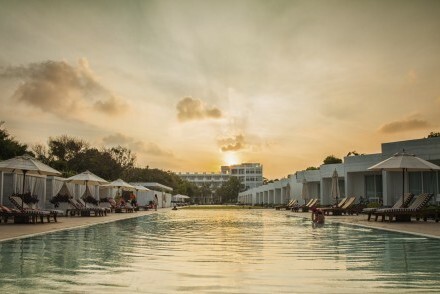 A uniquely designed resort and spa with a showpiece water feature and swimming pool running through the property that fronts the unspoiled natural bay, offering rooms, suites and villas with large open sun decks and plunge pools for a family-friendly beach getaway. 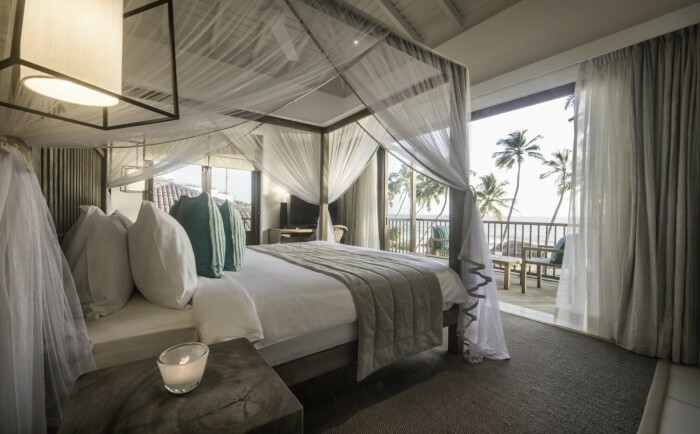 An intimate and adult-oriented retreat preserving the natural beauty of the environment whilst ensuring that the oversized rooms have breath-taking views of the Indian Ocean. 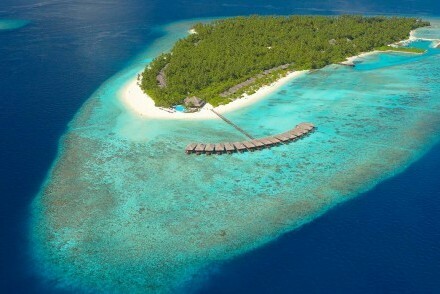 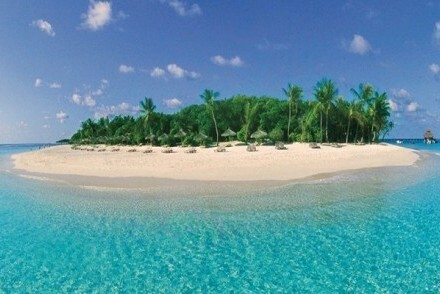 The resort is discretely located away from the crowd on Passikudah Bay and surrounded by a coral reef. 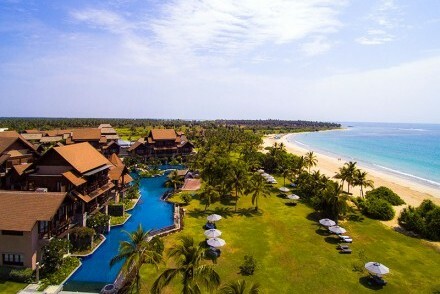 Beachside resort and spa overlooking Passikudah Bay, a long stretch of coastline renowned for its calm and shallow waters ideal for swimming and water sports from March to September. 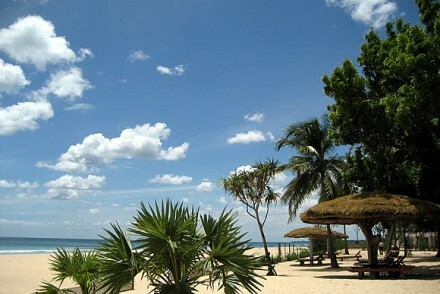 This laidback resort offers ocean view rooms and suites as well as seafood specialities. 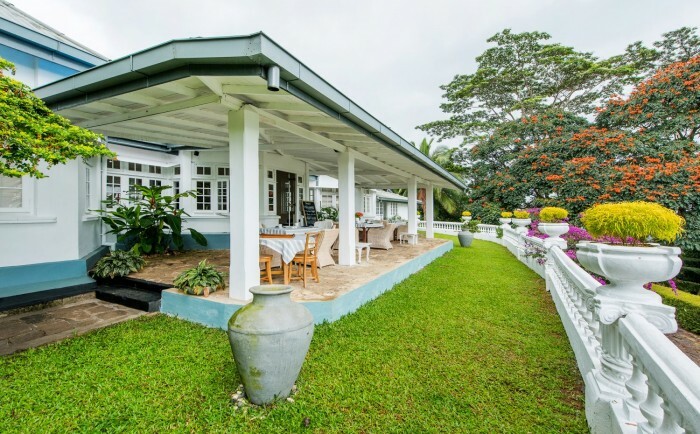 Once a cosy private holiday home and now a restored vintage retreat, this colonial bungalow delightfully melds classic upcountry elegance with the characteristic architecture of the time. 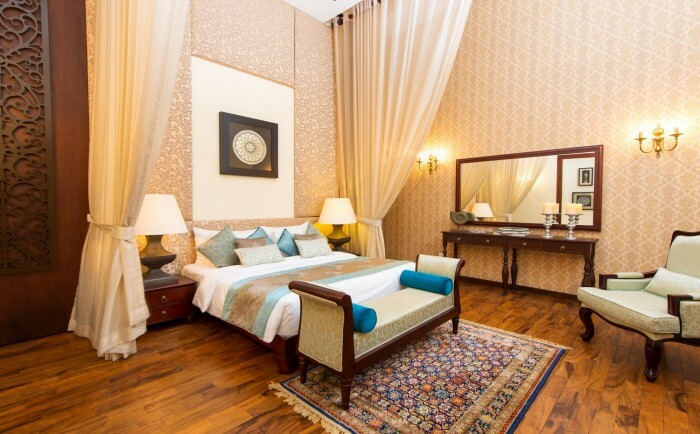 Revisit a bygone era in one of the four stately bedchambers furnished with antiques. 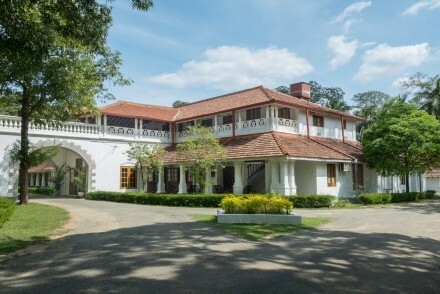 Restored Georgian style upcountry mansion and former tea planters’ club surrounded by terraced lawns and still preserving the charm of a bygone colonial era with its typical Hill Country atmosphere in the heart of ‘Little England’ with a contemporary Sri Lankan touch. Built in 1891, this was the palatial residence of the former Governor of Sri Lanka and an excellent example of a neo-Elizabethan mansion, still retaining the stateliness and grandeur of the bygone British colonial era following an extensive refurbishment. 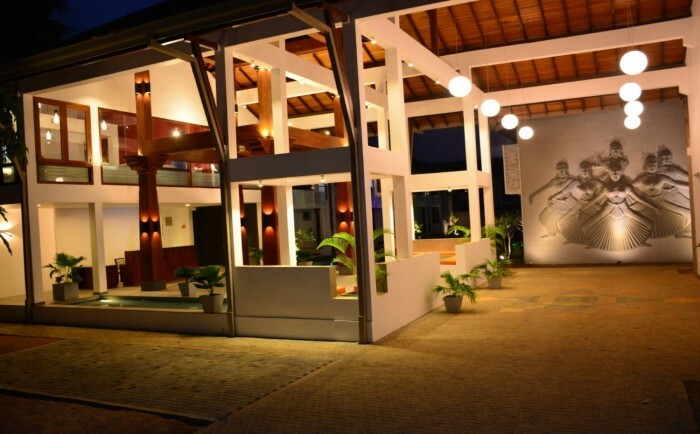 Stylish and contemporary resort for a relaxing beach stay with a splash luxury thrown in – good food, attentive service and beautiful natural surroundings. 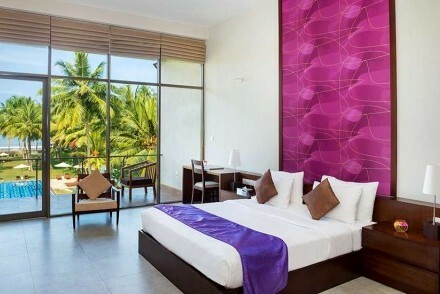 All rooms and suites are comfortably furnished and have breath-taking views of the Indian Ocean or gardens. 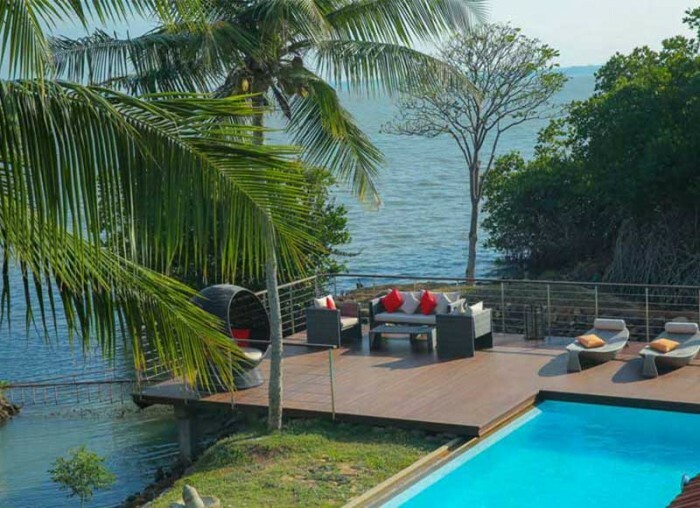 Luxuriate at C Beyond Nilaveli while enjoying spectacular panoramic views across the confluence of lagoon and Indian Ocean. 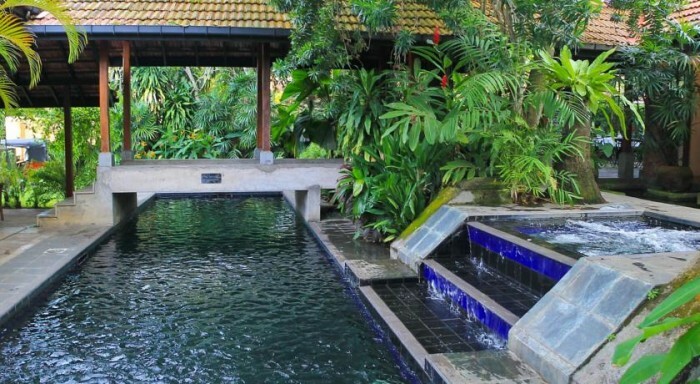 This relaxed, welcoming and intimate beachside villa hotel overlooks a large natural pond with serenely swimming fish, a feature designed by renowned artist Laki Senanayake. 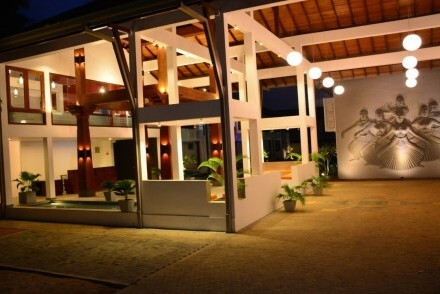 Modest beach front hotel overlooking Pigeon Island and the Indian Ocean beyond, with air conditioned and comfortable rooms including Wi-Fi and satellite TV. 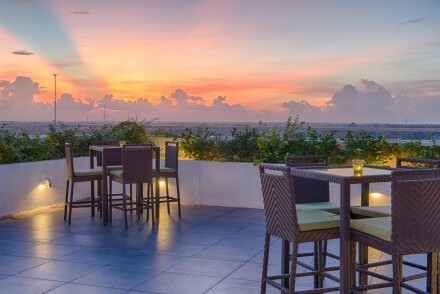 The airy restaurant provides breakfast, lunch and dinner supplemented by room service, and offers Eastern and Western cuisine. 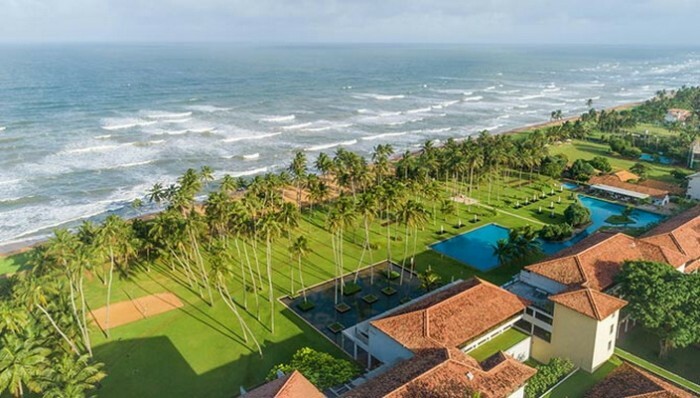 Nestled between the Indian Ocean and a tranquil lagoon just south of Negombo, Jetwing Lagoon is the new incarnation of Blue Lagoon Hotel, Sri Lanka’s very first resort hotel, which was designed by the legendary local architect Geoffrey Bawa. 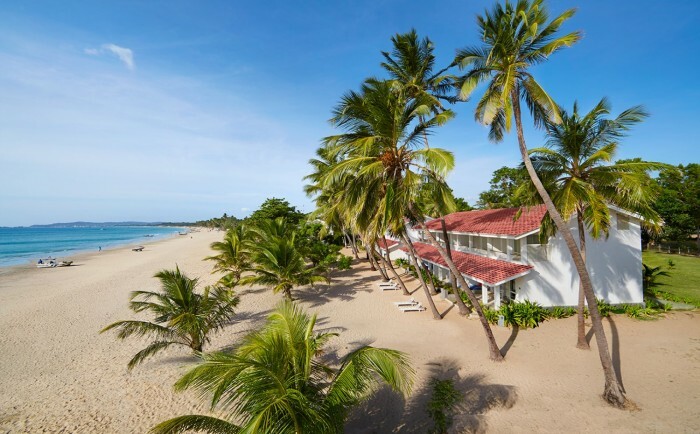 Intimate and modern beachfront hotel inspired by the colonial architecture of the island and offering ten spacious suites and rooms with balconies or terraces. 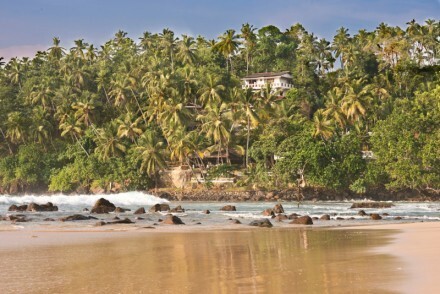 Imagine encourages you to “relax, feel happy and free” – a home away from home close to beautiful Mirissa bay. 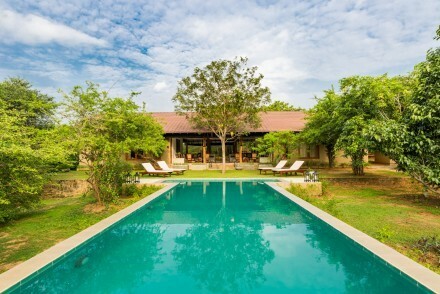 Luxury villa overlooking Talangama Wetlands southwest of Colombo, it is the perfect escape from the hustle and bustle of the city. 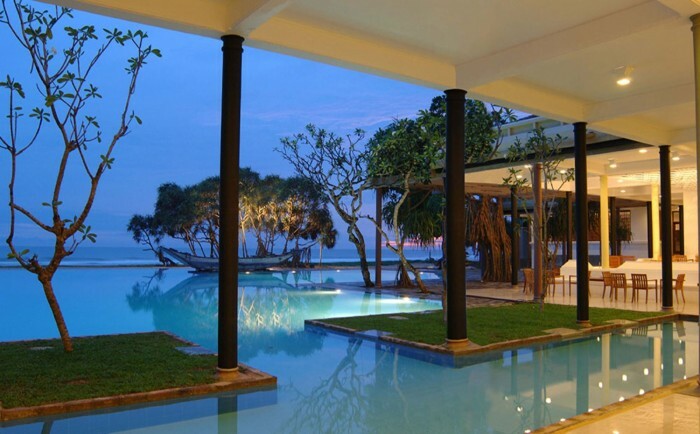 The villa enjoys a quiet, unspoilt lakeside setting and it is an ideal first or last stop of your holiday. 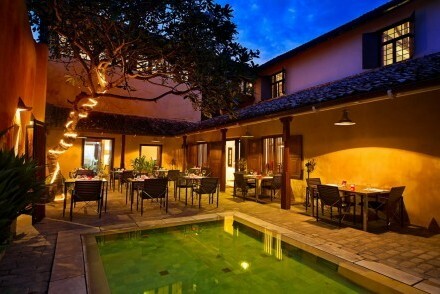 The hotel resembles the distinctive ‘thinnai’ homes of the region, the traditional and hospitable terraced town houses designed as havens of peace and tranquillity. In the countryside, Thinnai Organic farm preserves the natural environment while supporting the local community. 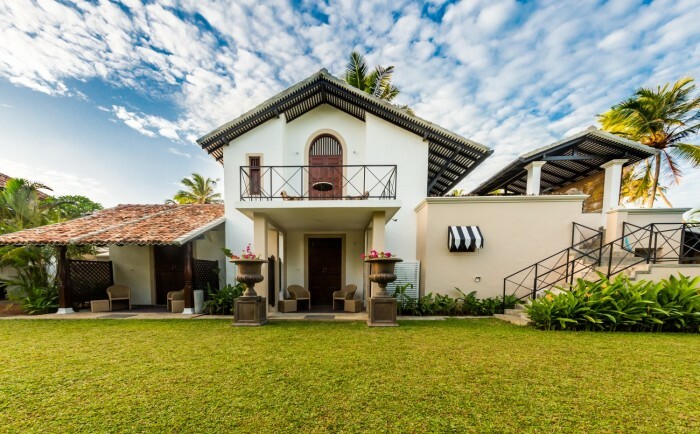 Tastefully restored Scottish spice merchant’s hilltop mansion originally built in 1861, with wonderful views over Galle and to the Indian Ocean beyond. 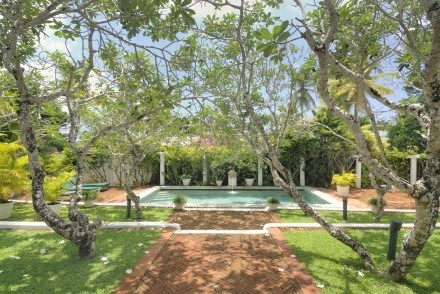 It is immersed in a private shady garden full of Frangipani and Hibiscus trees around a swimming pool. 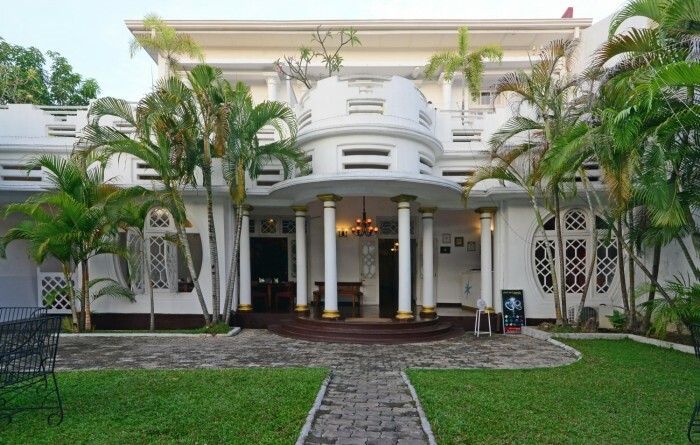 A wonderful bijou boutique hotel sensitively converted from a traditional walauwa (mansion villa) and former Moslem girls’ school, an inspired blend of traditional grandeur and contemporary living. 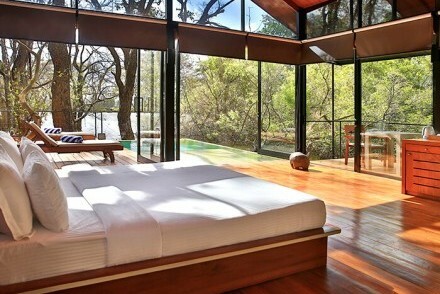 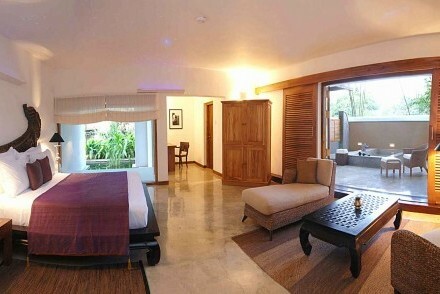 The bedrooms vary in style and ambience but all include King-size bed and luxury bathroom. 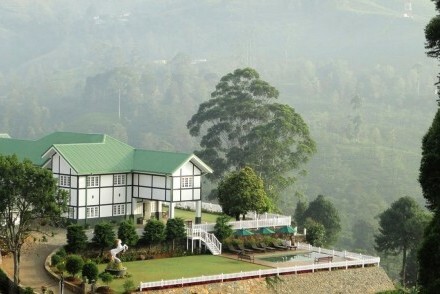 Former tea planter’s bungalow surrounded by an enchanting four-hectare tea estate. 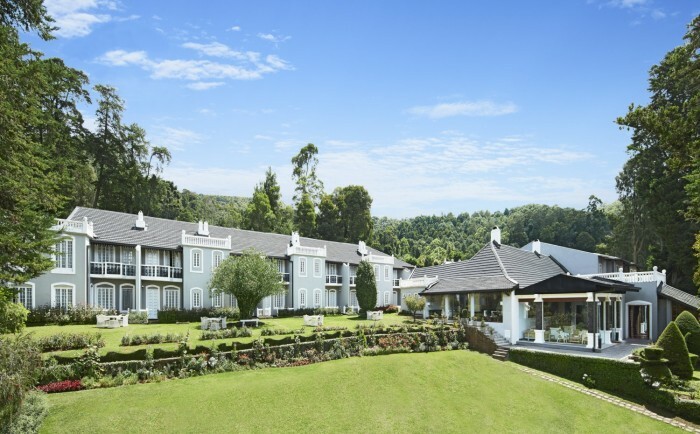 Blending tradition and old world charm with modern creature comforts including a swimming pool, it is nestled in the mountains overlooking the famed ‘Nine Arch Bridge’, an impressive railway viaduct. 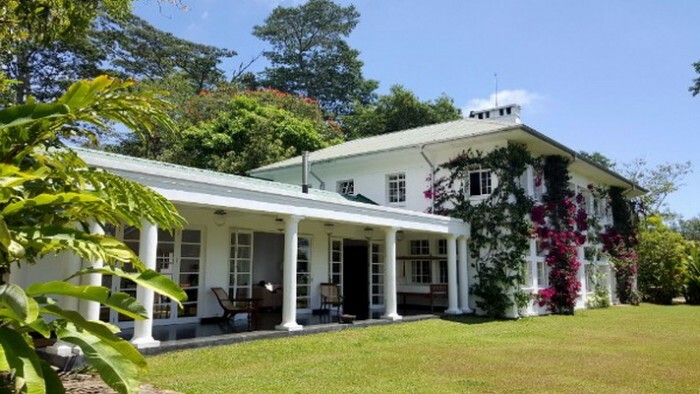 Late 19th century tea estate bungalow and deluxe apartments immersed in landscaped gardens harbouring a rare collection of tropical fruit and timber trees surrounding a swimming pool. 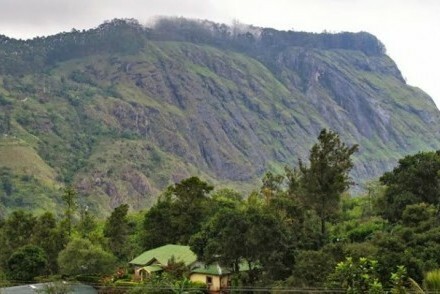 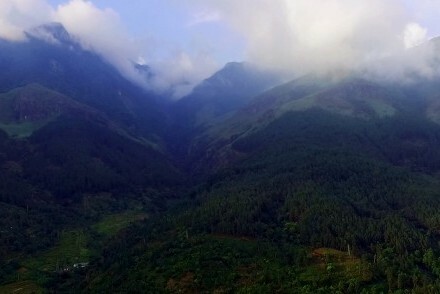 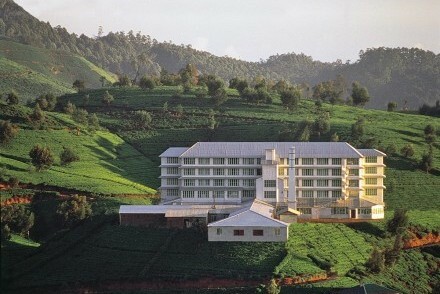 The bungalow is located in the lower southern tea plantations of Ella Gap towards Wellawaya. Magnificent 18th-century mansion villa turned printing facility now housing five stylish suites furnished with antiques and fitted with copper-lined rain showers. 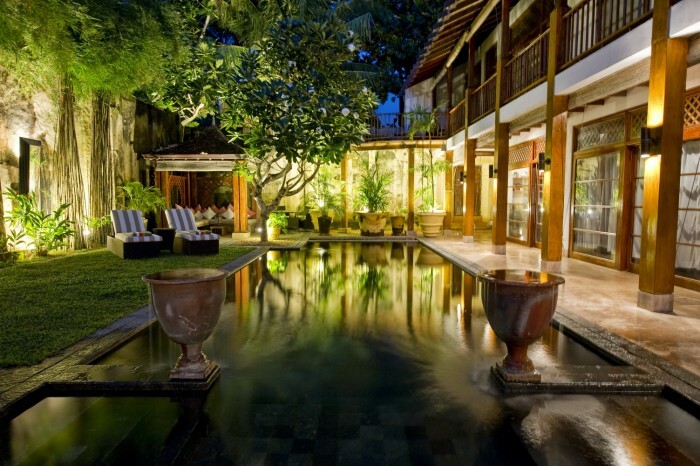 Since 2013, the boutique hotel offers 13 suites in total with the addition of two other heritage villas close by. 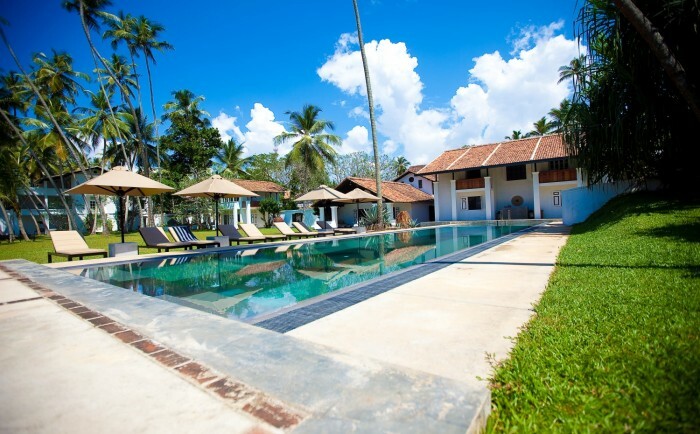 An aristocratic manor house built on the banks of the majestic Gin Ganga over 250 years ago, the villa is set around a stunning central courtyard. 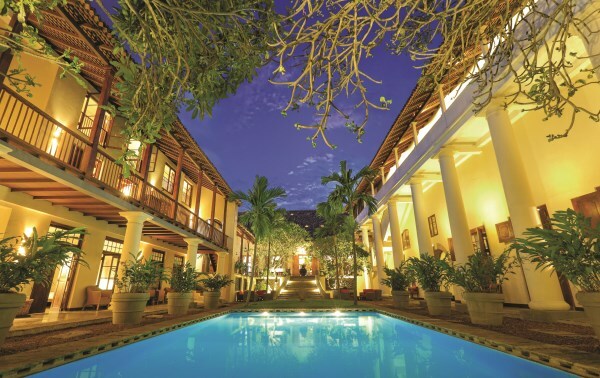 This sumptuous colonial-style luxury boutique hotel is a perfect blend of old-world hospitality and contemporary luxury. 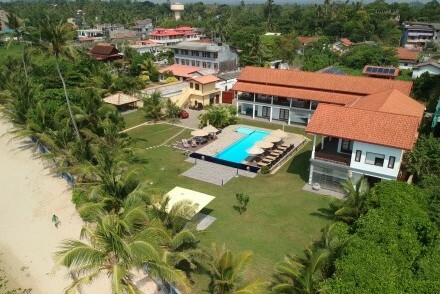 In the centre of Mannar Island, famed for migratory birds during the winter and some of Sri Lanka’s best seafood, this contemporary styled hotel offers 14 light, spacious and comfortable bedrooms, restaurant and bar, swimming pool, traditional well bath, recreational area, gym, and library. 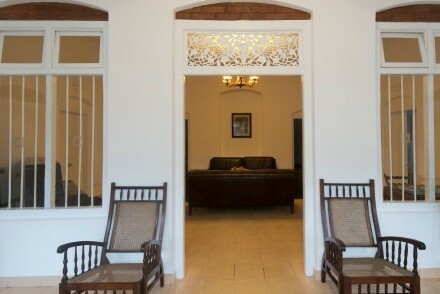 Just footsteps away from Jaffna railway station and equipped with an array of modern amenities and services including luxury balcony bedrooms, contemporary elegance meets northern heritage and its legendary hospitality at the new addition to the Jetwing family in Jaffna. 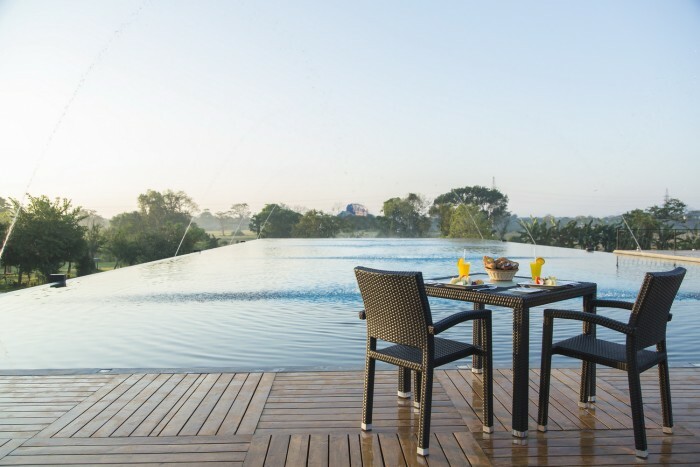 A mountain eyrie with spectacular views from the numerous terraces and comfortable bedrooms, Melheim Resort has the impression of being on top of the world, with the sky stretching seemingly endlessly above and cloud-shrouded hills disappearing into the distance below. 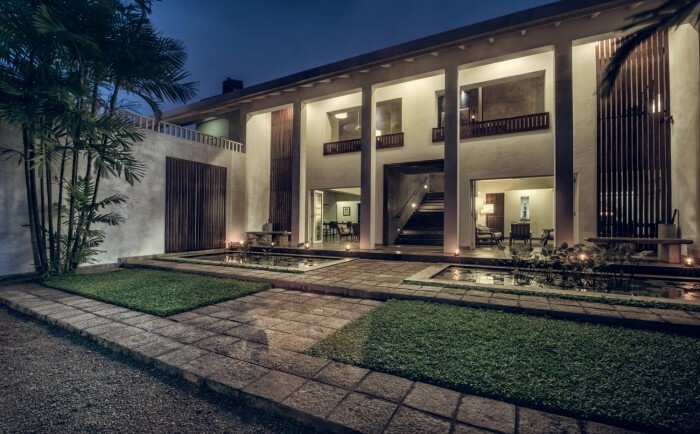 Refreshing alternative to the traditional colonial Dutch aesthetic prominent within the Fort. 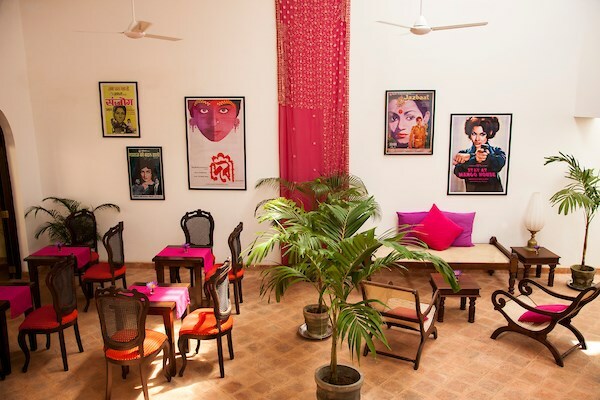 White-washed walls, bold colour combinations, poster art and ingenious use of space contrive to produce a novel style, enhanced by waving fronded palms and long-stemmed ceiling fans. 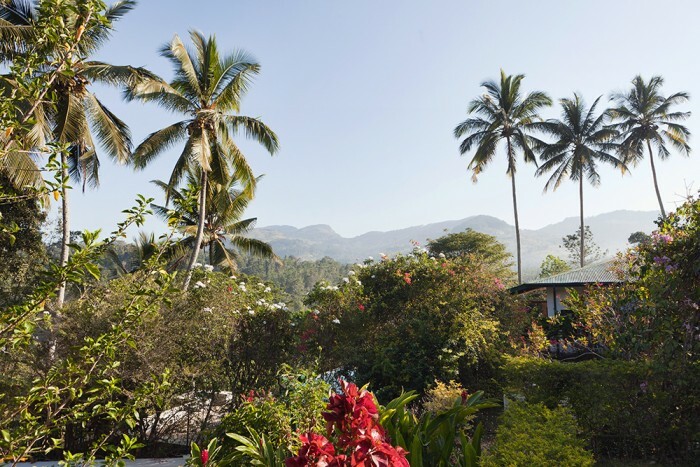 Off the beaten track and surrounded by spice plantations and palm trees, Jim’s Farm Villas is an eco-gem and family favourite. 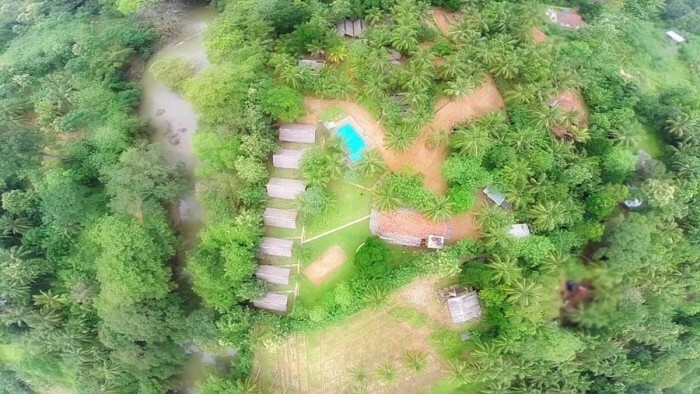 Developed from virgin jungle, the villas are immersed in a 20-hectare organic farm producing black pepper, cinnamon, bananas and coconuts. 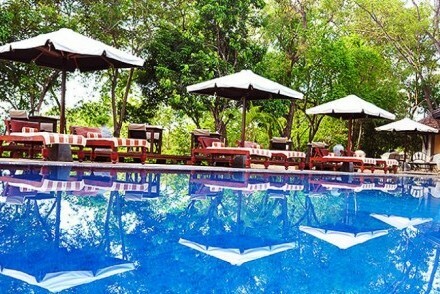 Modern resort immersed in a secluded dry zone forest overlooking Siyambalawewa tank, a relic from an ancient civilisation. Combining contemporary architecture with the solitude and calming ambience of its natural environment, the hotel is set in over 7 hectares of leafy grounds. 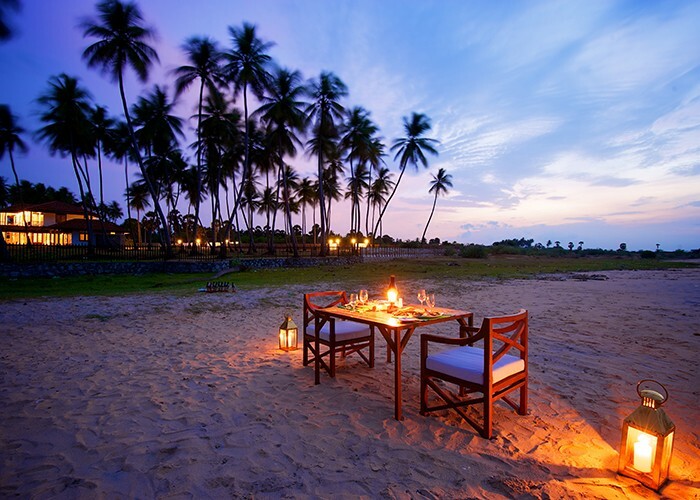 Jetwing Jaffna delivers experiences of exotic luxury influenced by the fascinating mix of colonial charm and the local Tamil culture. The hotel is elegantly furnished in an ethnically contemporary style and the comfortable deluxe rooms have magnificent views over the town. An iconic hotel designed by Geoffrey Bawa, Sri Lanka’s most celebrated contemporary architect. 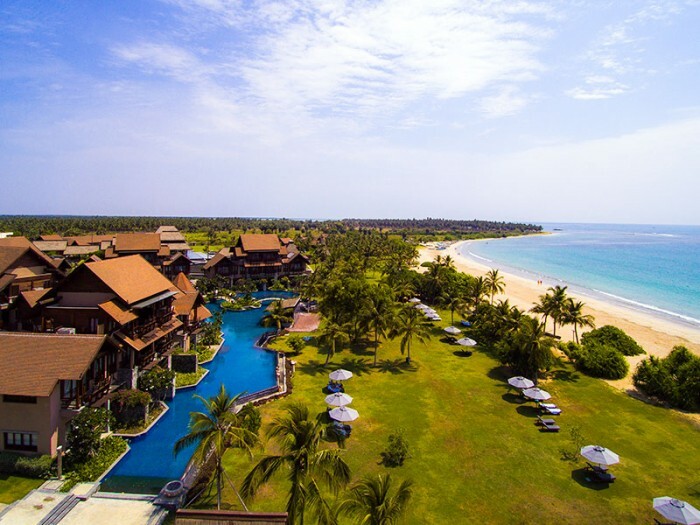 This 4-star+ resort commands an unbeatable position on a long stretch of sandy beach lapped by the Indian Ocean, and includes a fine-dining restaurant and night club. 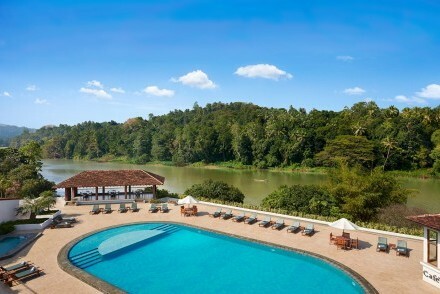 Rustic luxury amidst a tropical forest on the edge of a tranquil lake making you feel at one with nature, which is emphasised by regular sightings of monkeys, monitor lizards and a spectacular array of Sri Lankan bird life in the immediate area. An iconic landmark on the seafront in the heart of Colombo and restored to its former glory, Galle Face is one of the oldest hotels east of the Suez, embracing its rich history and legendary traditions to offer a unique experience. 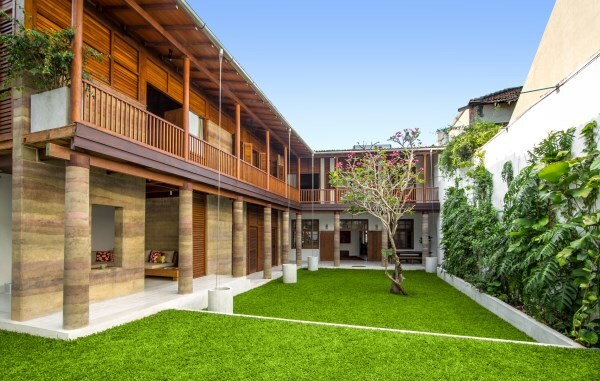 A throwback to Dutch colonial life in its heyday, the house with its white columned façade appears much as it would have 250 years ago, but inside you step into the present day, with a new contemporary extension blending seamlessly into the old. 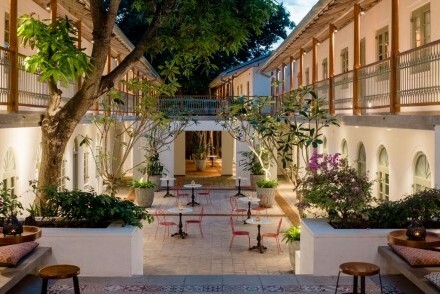 Built by a Dutch merchant to store spices over 300 years ago, this warehouse is now home to a boutique hotel with restaurant and bar. The sensitive renovation has retained most of its original infrastructure including exposed coral walls and high ceilings. 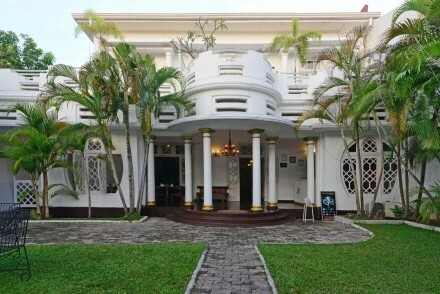 Built in 1789 as the residence of a Dutch merchant and rescued from dilapidation in 2012, the villa is a fine example of Dutch colonial architecture. The renovation has preserved its original style and retained its facade, high timber ceilings and towering arches. 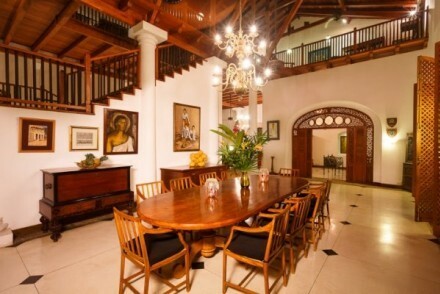 Once the chambers of an eminent family of lawyers since 1826, its origins lie further back in time, having been built during the Dutch colonial period. 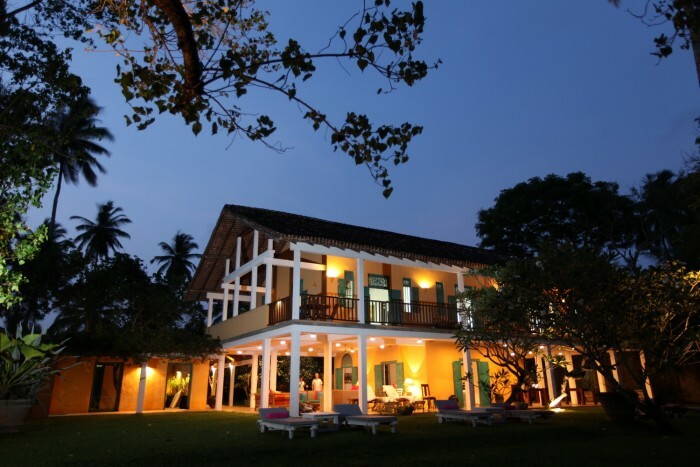 Restorations have preserved its heritage and create a property that is incomparable in character and style. 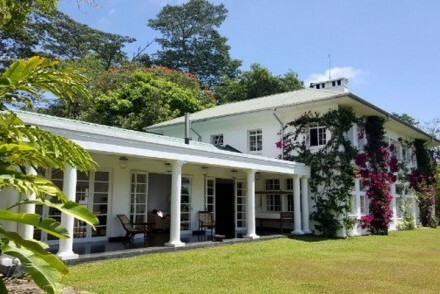 Fine example of Dutch colonial architecture and a rare insight into the lives of some of the more prominent early 18th century residents of the Fort. 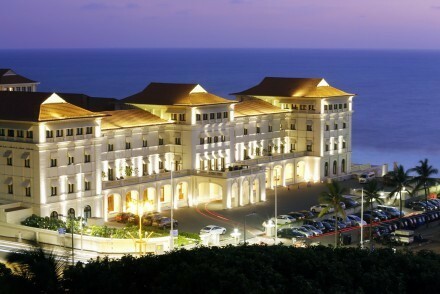 Its heritage is plain to see in its epic proportions and grand facade. 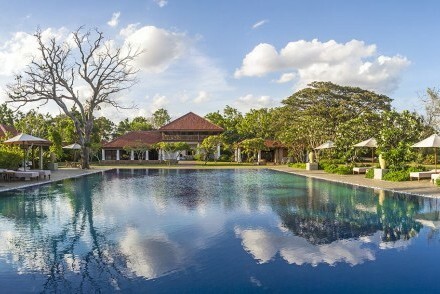 Recreating the ancient kingdom of Anuradhapura on a 20-hectare estate, and elevated 6 metres above ground level to conserve trees and limit environmental damage, the resort is situated within Andarawewa forest, an ‘elephant corridor’ linking the local arboreal areas with Wilpattu National Park. 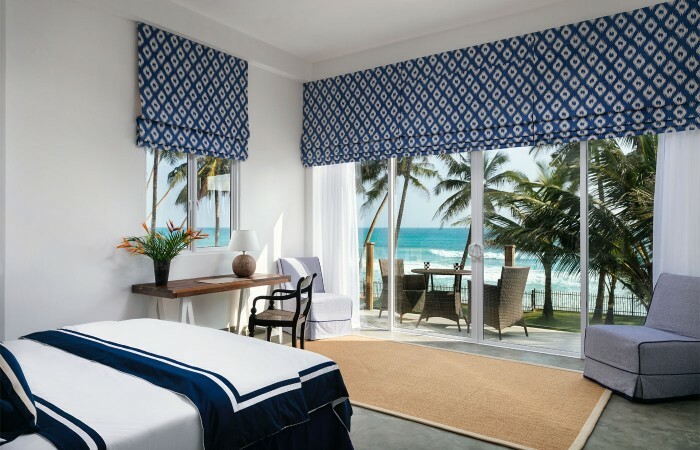 Originally built in the 1930’s by a wealthy gem merchant and the only Art Deco hotel on the island, Deco on 44 has been sensitively renovated and decorated in keeping with the Art Deco theme of its original architects. 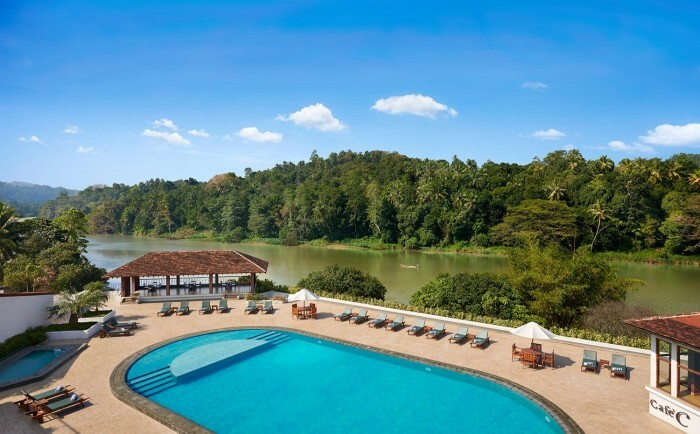 5-star Cinnamon Lodge is an environmentally-friendly resort (Green Globe 21 Certified) built in the style of nearby Ritigala Monastery ruins and spread over 15 hectares of lush woodland and mature gardens connected by a myriad of pathways and nature trails. Rambling chalet-style hotel with an ethnic and luxuriant feel situated in an enviable position overlooking the great Mahaweli Ganga, Sri Lanka’s mightiest river, and designed to reflect the rich history and majesty of Kandy, the seat of the last Sinhalese kingdom. 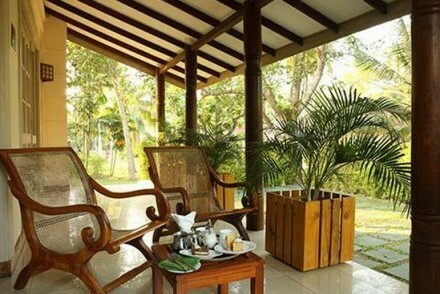 Intimate and eclectic hideaway where lush jungle meets stylish luxury within an hour's drive of the international airport. 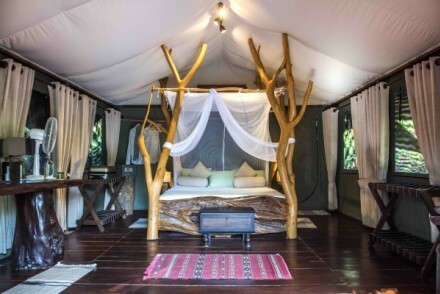 With only three rooms, each located in its own stylised pavilion with individual veranda dining, guests are guaranteed privacy in this 'jungle glam' property. 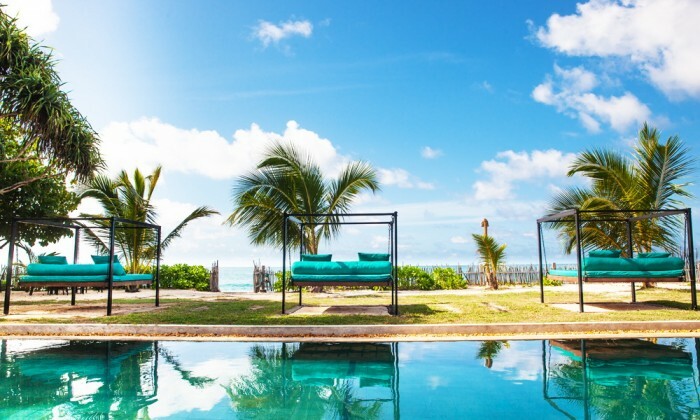 A captivatingly quirky retreat of rustic cabanas and villas situated on a quiet two-kilometre stretch of pristine beach in an undiscovered part of the island. 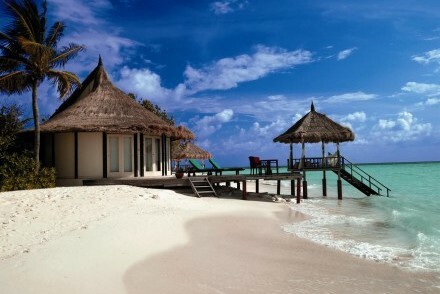 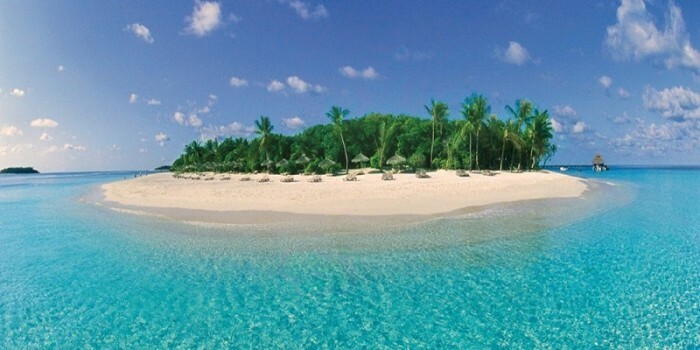 The resort offers a relaxing and discrete getaway for a sand-between-the-toes, Robinson Crusoe experience! ‘Ash’ is a renovated and funky 1930s tea planter’s bungalow set in its own 40-hectare tea estate and boasts stunning waterfalls and far reaching views up to and across the Knuckles Mountains, not to mention lush tea fields, plucked each day. 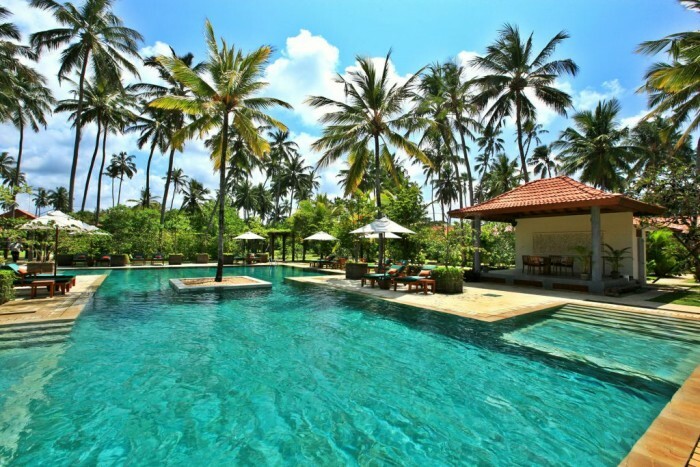 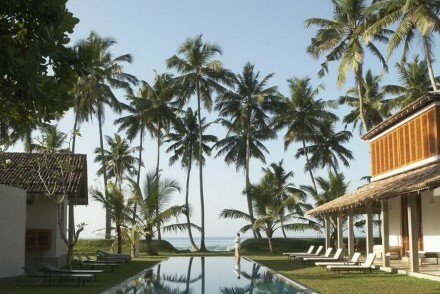 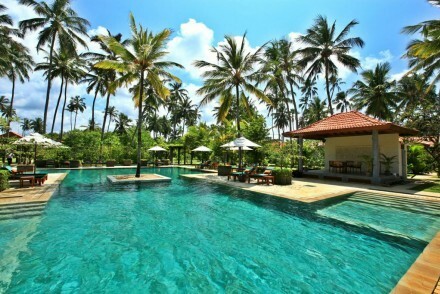 The villa is a former plantation house renovated into Zen-inspired accommodation inland from Galle. Thoroughly modernised but retaining the flavour of the island's colonial past, the expansive 200-year-old house sits on a 4-hectare estate of tropical gardens and paddy fields. 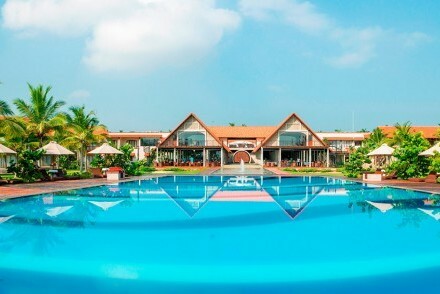 On the shores of picturesque Kandalama Wewa (lake) in its own 12-hectare ’Dry Zone’ forested estate, Amaya Lake is a relaxed and eco-friendly resort with attractive lawns and mature gardens, an outdoor swimming pool, and plenty of activities for children. Intimate sanctuary spread over 2.5 hectares of forested land without manmade barriers to the surrounding jungle, which is home to a variety of wildlife. 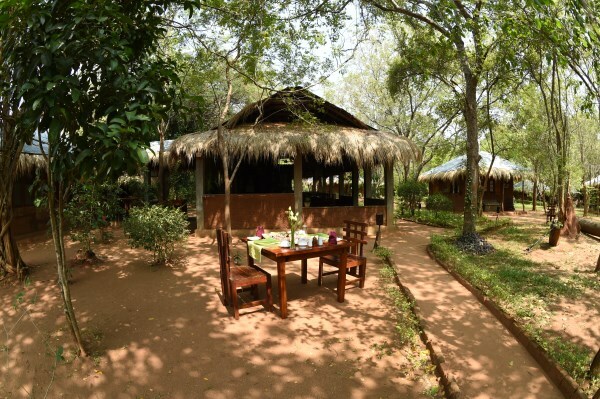 The accommodation is hidden amongst foliage, and all includes a/c, en suite bathrooms and modern facilities. 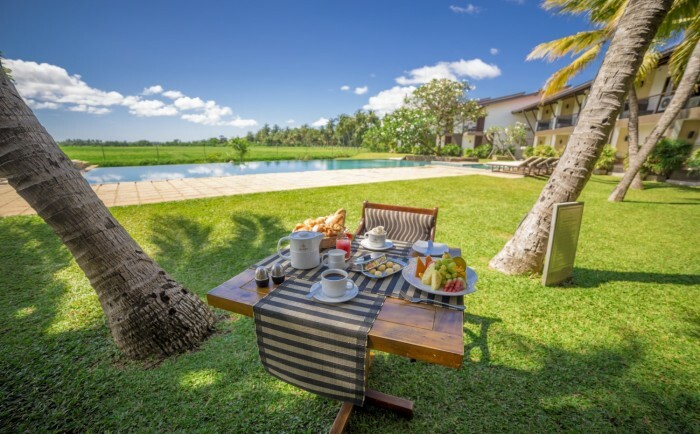 Nestled in a beautifully manicured garden of two hectares, including raised organic vegetable beds, swimming pool and spa, this rustic countryside hotel is close to Uda Walawe National Park and surrounded by lush woodland and paddy fields. 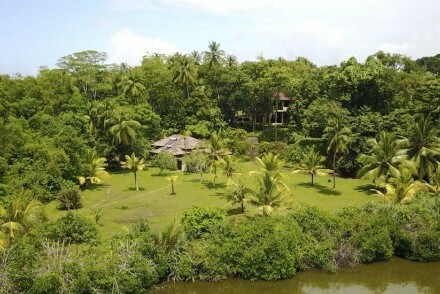 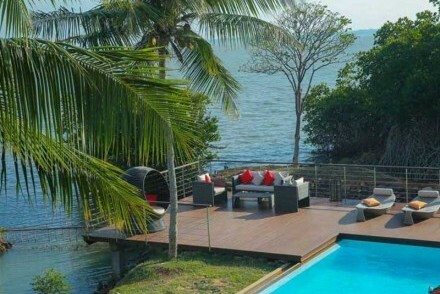 Secluded retreat set in over one hectare of land overlooking a deserted Indian Ocean beach and a river alongside. 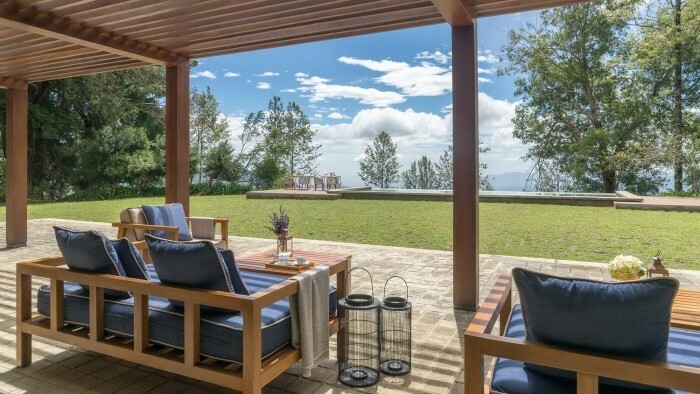 Two thoughtfully designed bungalows have been created with utmost care, to optimise the views and maintain absolute privacy for each property. 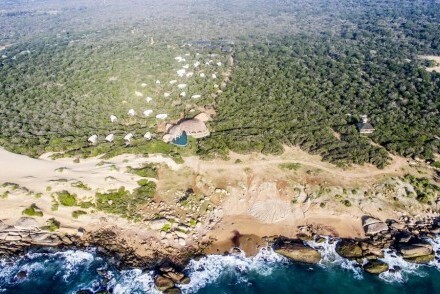 Ideally located and attractively appointed nature resort spanning four hectares of jungle on a seemingly endless beachfront with wild animals wandering through the hotel’s grounds. 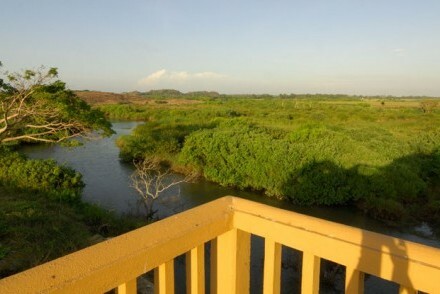 Take the opportunity of spotting a variety of wildlife from the well-positioned, 360-degree observation deck. 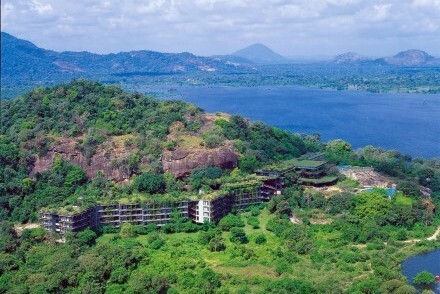 The hotel has a superb beachfront position within a palm grove overlooking nearby Pigeon Island. The shady garden is a welcome haven during the heat of the day, with a large swimming pool to cool off in and a beachside cabana bar serving light meals. 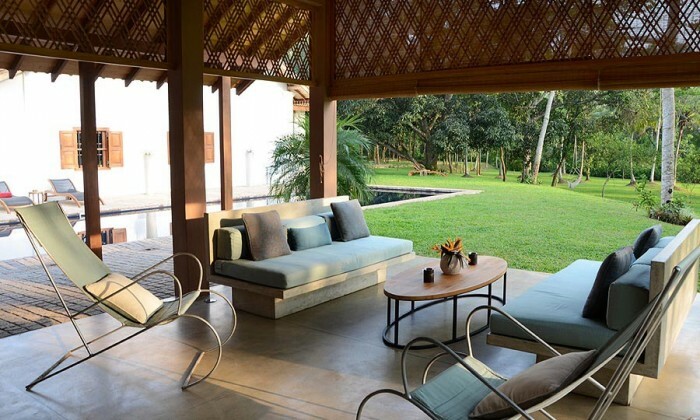 Village living, naturally designed, has created beautiful, sustainable living spaces, blending traditional Sri Lankan design with a touch of the contemporary. 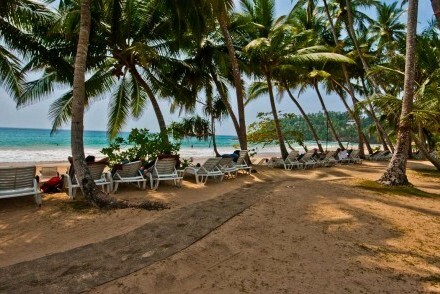 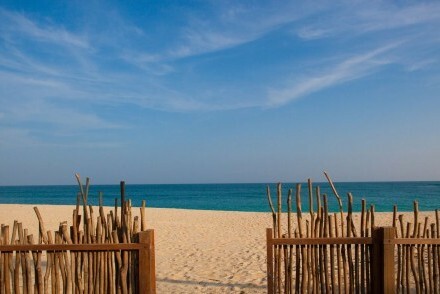 Palagama Beach has kilometres of empty, wild beaches stretching out along the west coast, just how beaches should be. 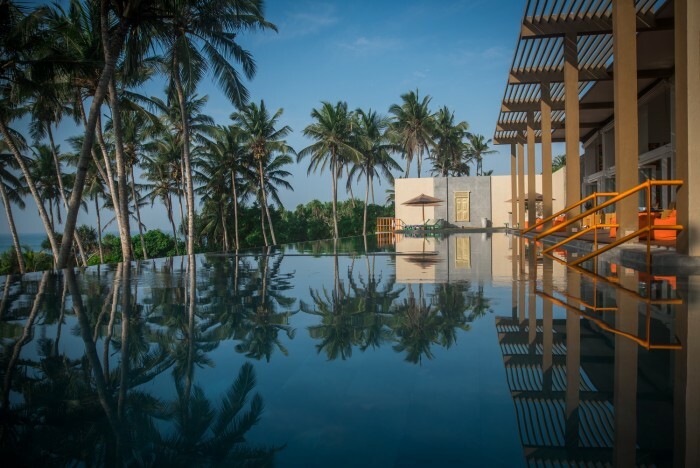 Set in lush vegetation where elephants roam free – ‘Aliya’ means elephant in Sinhala – the resort is an artful blend of contemporary architecture and authentic Sri Lankan minimalism, and aims to provide a distinctive experience of traditional village life. 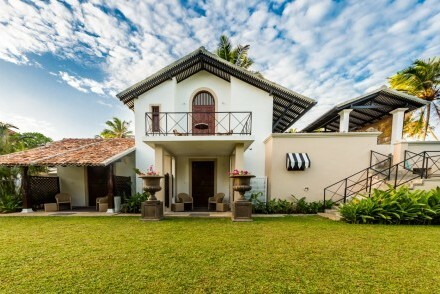 Staying with a family in their own guesthouse or homestay is a unique opportunity to experience the traditional Sri Lankan way of life and sample authentic home cooking. 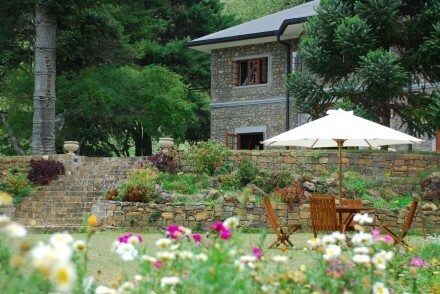 All of our guesthouses and homestays have comfortable bedrooms with en suite bathrooms and supply meals. 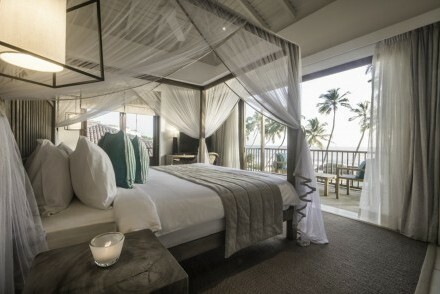 Mosquito nets are always provided, if necessary, and air conditioning is becoming widespread. 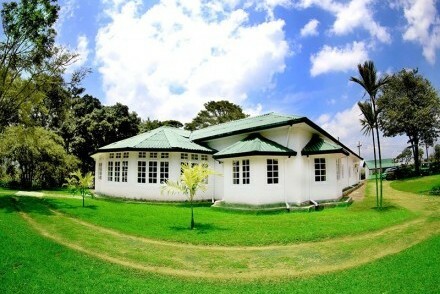 Wi-Fi and other facilities are frequently available. 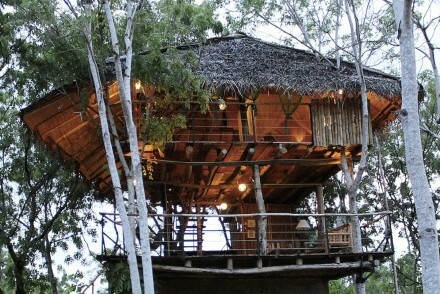 We also offer locally-run small hotels, cabanas and tree houses in this category. 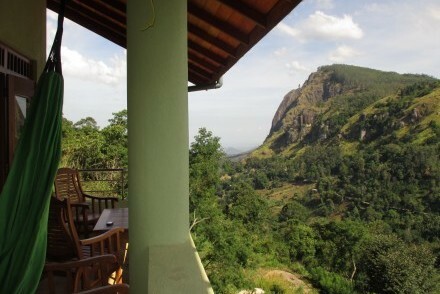 We currently offer Guesthouse accommodation in all regions of Sri Lanka, with the exception of the North and East. Below are outline details of sample Guesthouse accommodation. 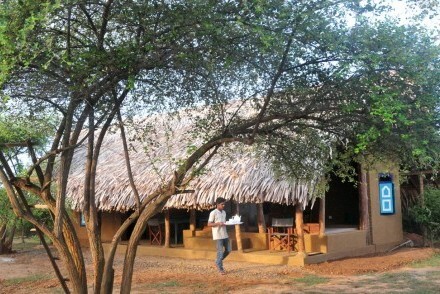 For more details, click on Trip Planner and log in for photos and in-depth descriptions of the accommodation available. 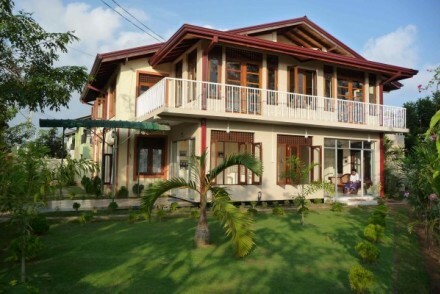 Clean and cosy budget homestay in a quiet, gated development close to the international airport. 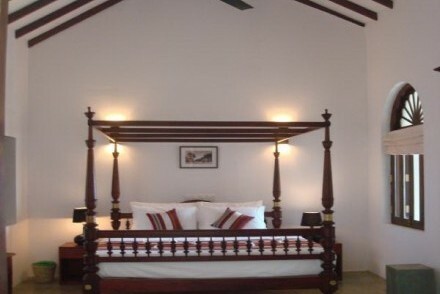 Simple en suite rooms are complemented by a friendly and welcoming atmosphere, and genuine Sri Lankan home cooked food. 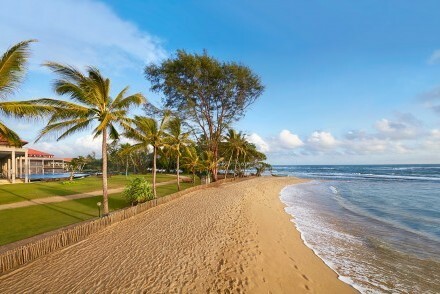 There’s no place like home! Set in a quiet, leafy and extensive garden, including a swimming pool, and offering comfortable air conditioned rooms, just 15 minutes’ drive from the international airport. 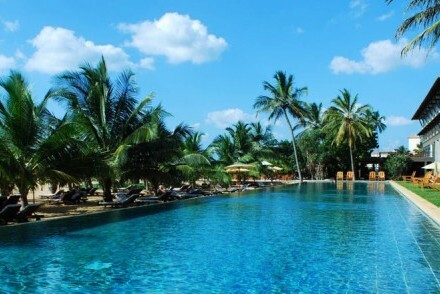 Deriving its name from the lofty tamarind tree that shades the premises, this is a convenient budget airport resort. 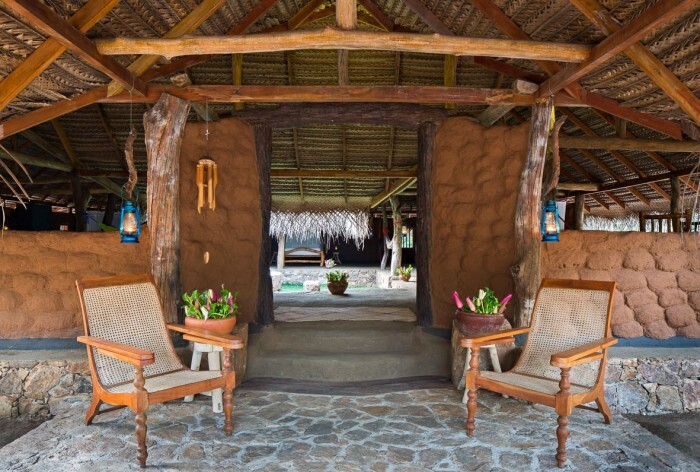 Inspired by the traditional clay wall and thatch-roof homes of the dry zone, but with crisp linen and modern bathrooms, three distinct bungalows have large open verandas for dining and socialising, and small enclosed ‘safe areas’ for sleeping. 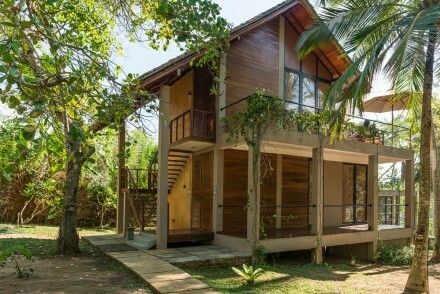 Eco-friendly place to stay set back from the attractive sandy bay of Unawatuna and only 5 km east of Galle. Over-sailed by a densely wooded cliff, the retreat is a shady and secluded sanctuary surrounded by bamboo, mango and kitul trees resonant with birdsong. 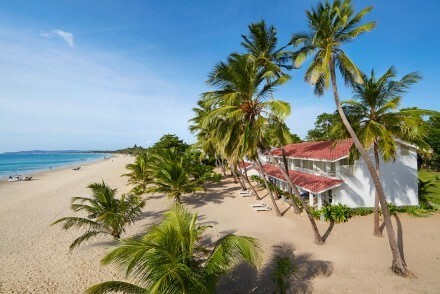 Three-storey, beachside guesthouse surrounded by palm trees on the sandy, crescent-shaped bay of Unawatuna. 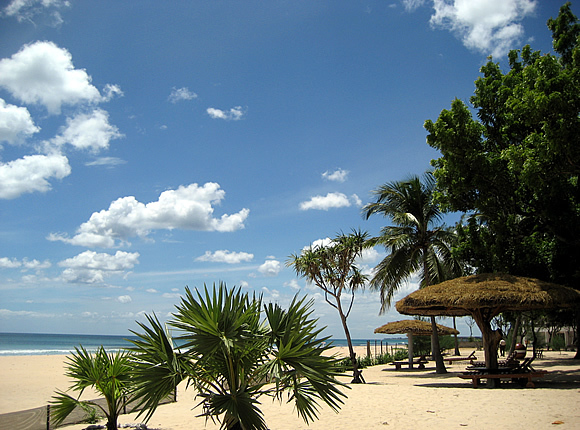 The beach is ideal for swimming during the season (November to April), and there are breath-taking sea views across the Indian Ocean to the horizon. On the banks of the Rakwana River in a forested glade within easy reach of Uda Walawe National Park, the river view cabanas and ‘glamping’ tents come with comfortable beds, cooling fans, mosquito nets, en suite bathrooms and verandas. 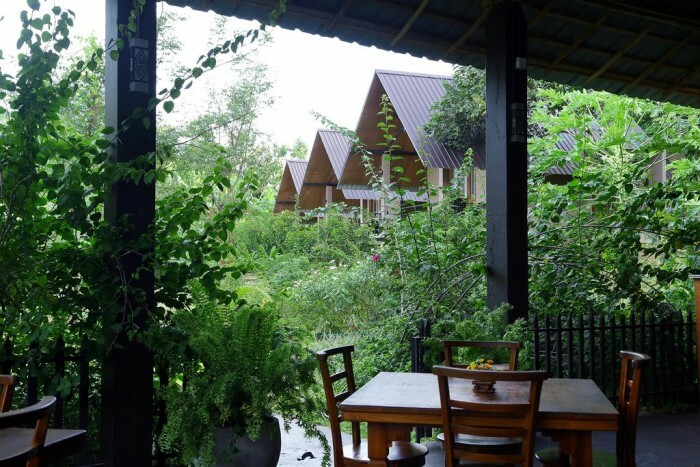 Set in peaceful, leafy grounds, including a swimming pool, and surrounded by paddy fields and attractive countryside home to an array of birdlife, hence its name – Kithala or Purple Coot. 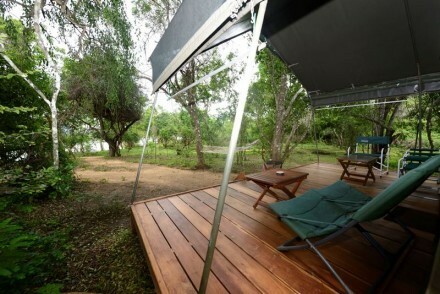 It is conveniently located for arranging jeep safaris in Yala and Bundala National Parks. 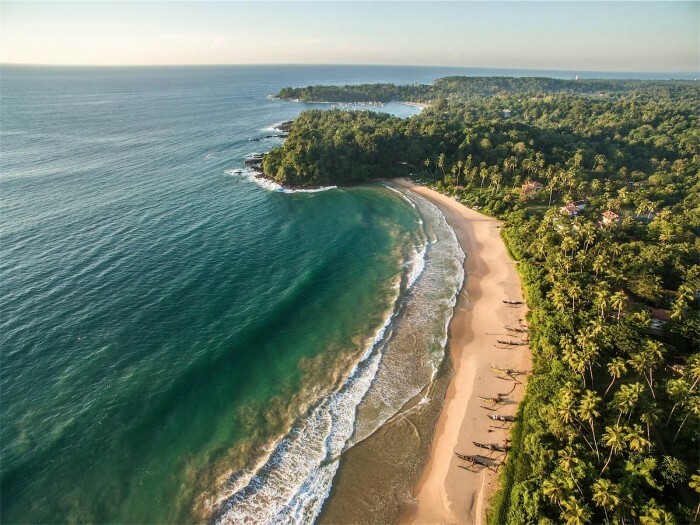 Lying just behind one of Sri Lanka’s most peaceful and protected beaches, a crescent cove of glassy-still, crystal clear turquoise waters, spotless golden sand and tropical sunrises, this surf, yoga and wellness resort is set in a verdant palm garden nestled by the shore. 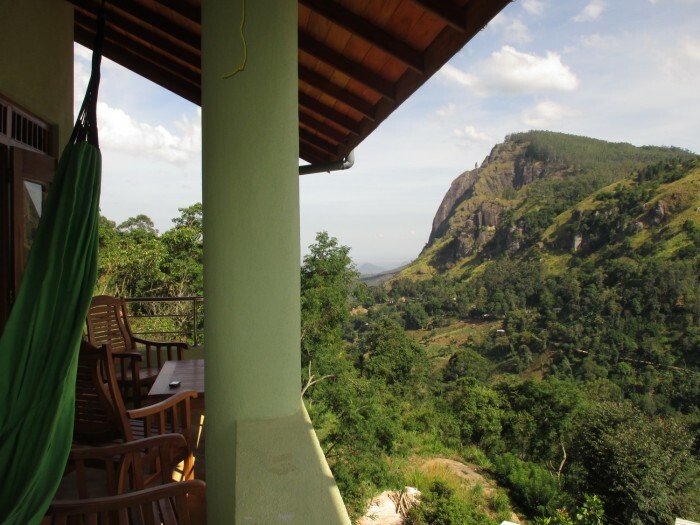 Intimate and simple guesthouse offering clean and basic rooms and serving authentic Sri Lankan food, close to the southern entrance of Sinharaja National Park. 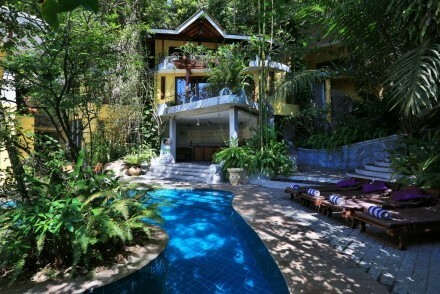 There are a couple of hill top en suite chalets with wonderful views of the surrounding jungle. Cosy colonial style Hill Country cottage offering intimate bedchambers that feature vintage comforts and modern facilities in a nostalgic ambience filled with old world charm amongst picturesque mountains. 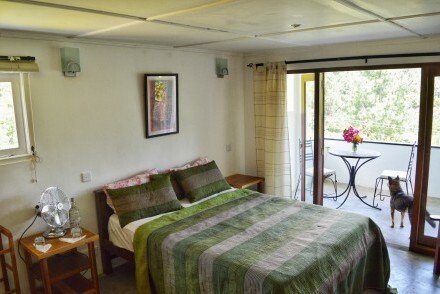 With just three bedrooms, this bijou residence is ideal for a family or group of friends. Overlooking Negombo lagoon, the villa has high-quality accommodation, a relaxed and serene ambience, and also runs an on-going community project in-house that supports local fisher folk through an arts and crafts workshop, Thimble, established by Indira, one of the passionate owners. 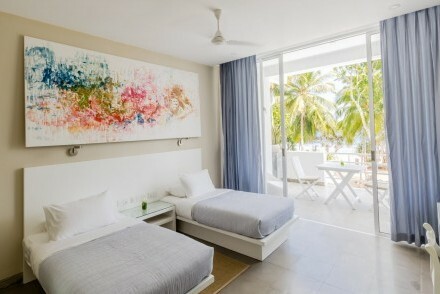 Bijou budget boutique hotel in a quiet and secluded neighbourhood off the main beachfront with restaurants, bars and sun-kissed sandy beaches only a short stroll away. 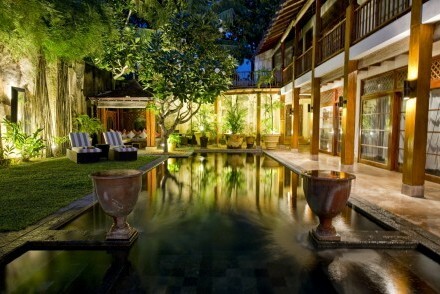 The stylish rooms and suites complement the private, walled courtyard with pool terrace, bar and restaurant. 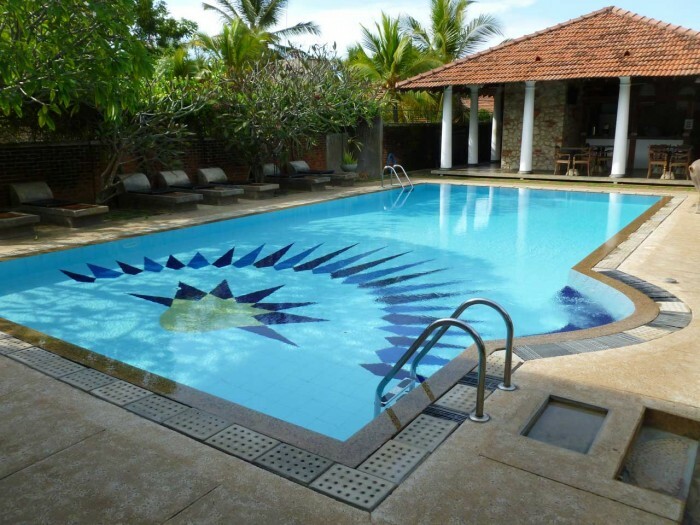 An original colonial style villa and modern apartments with individually decorated rooms, swimming pool and bar terrace, just a few minutes’ walk from the beachfront at Negombo. 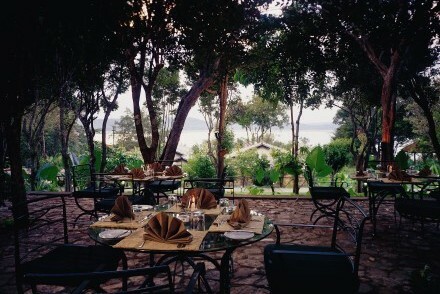 In harmony with the hotel’s eco aspirations, only vegetarian cuisine is served. 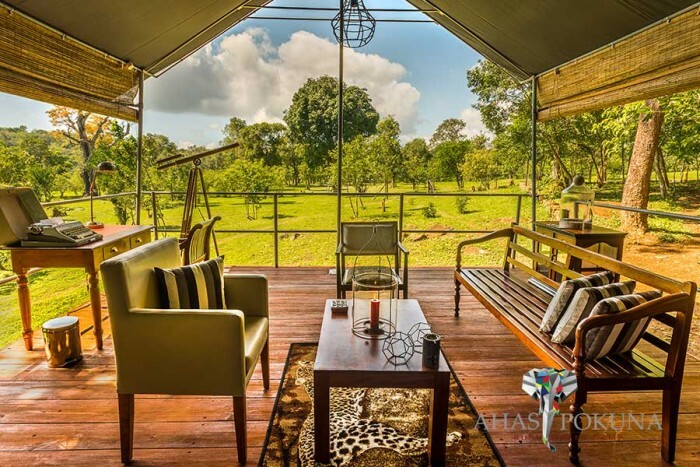 Welcoming family-run guesthouse located in the cradle of Ella Gap with wonderful views of the surrounding southern Hill Country. 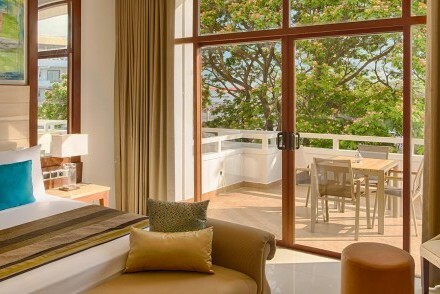 Popular with families, Zion View offers clean and comfortable rooms with balconies as well as an open-air lounge, terrace restaurant and pool with panoramic vistas. 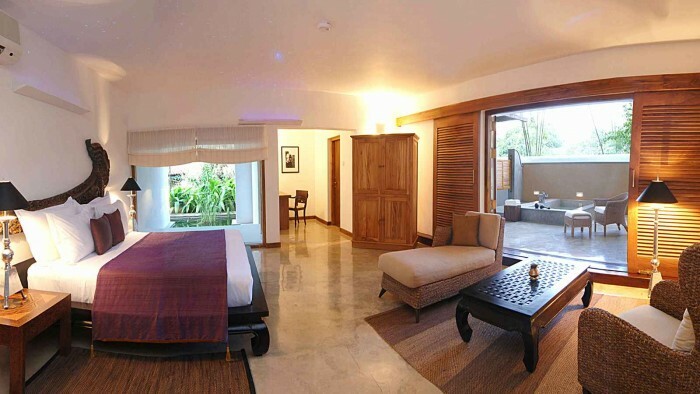 A ‘luxury for less’ hideaway only moments away from the capital’s attractions and the ancestral property of Taru, the renowned local designer and hotelier. 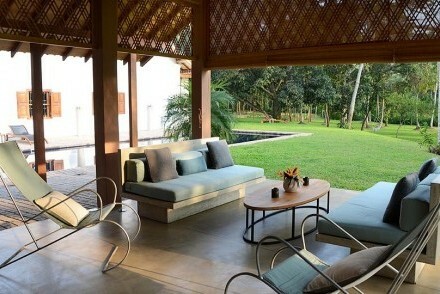 With her creative emphasis on lines, light, and space, Taru's brainchild is the template for contemporary elegance. 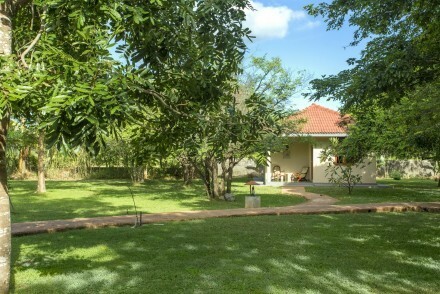 Welcoming family-run guesthouse in Anuradhapura new town with clean and comfortable rooms, traditional Sri Lankan home cooking, and a private garden full of birdsong. 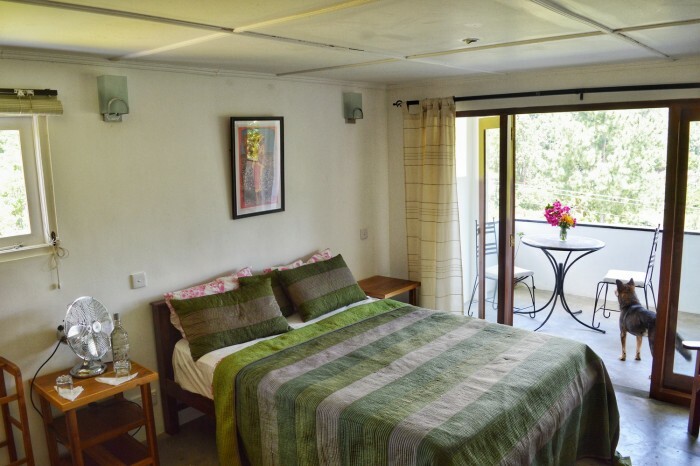 The four rooms are spacious, all en suite and a/c, and have balconies with garden views. 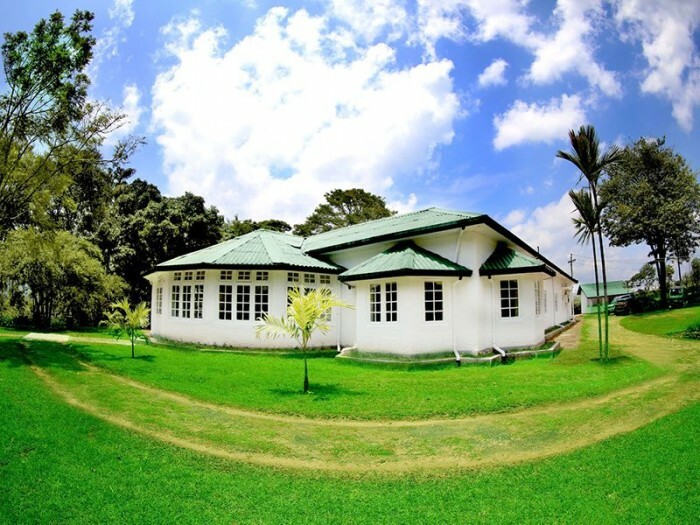 With stunning views of ‘Lion Rock’ dominating the skyline, this modern chalet complex is surrounded by woodland and the lush grounds are frequented by wild peacocks. 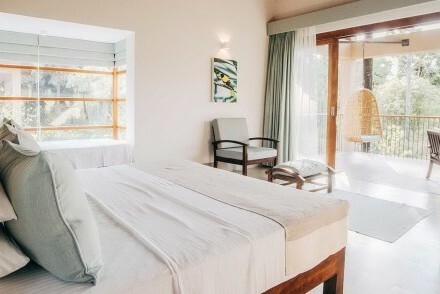 The simple but comfortable rooms are all en suite and a/c with private shaded terraces. 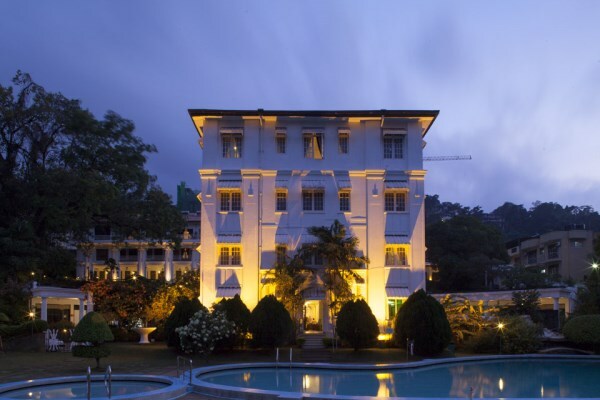 Colonial-style hotel and former British governor’s residence in a quiet and secluded location close to Kandy Lake and within striking distance of the Temple of the Tooth and city centre. 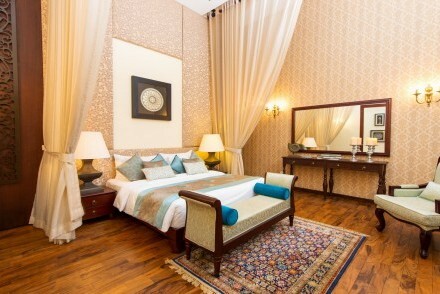 Although reminiscent of a bygone age, the hotel has modern refurbished rooms. 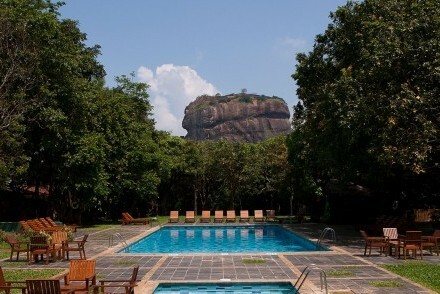 Eco-friendly resort in the shadow of Lion Rock at Sigiriya and a recipient of the Responsible Tourism Awards for incorporating energy-saving and pollution-limiting processes. 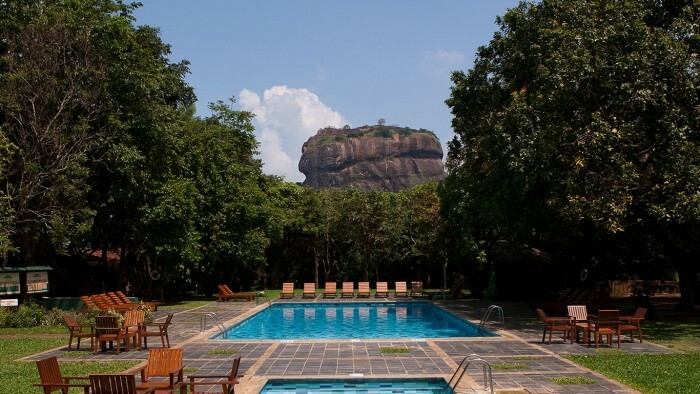 Superior Rooms throughout include modern amenities, and the swimming pool and dining areas have uninterrupted views of Sigiriya rock. 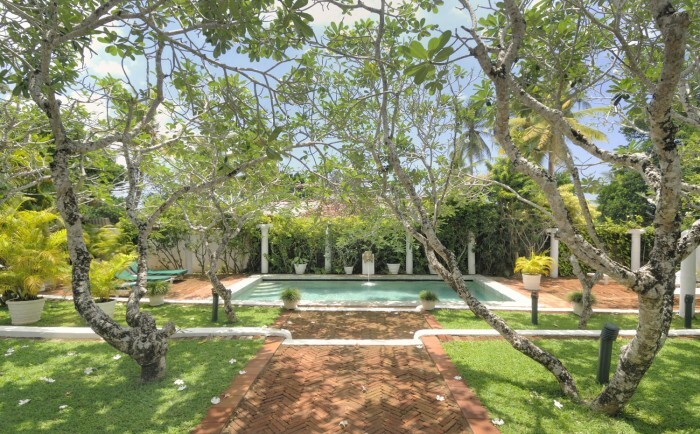 Comfortable four-bedroom town villa with courtyard garden and sit-out veranda within the Fort. 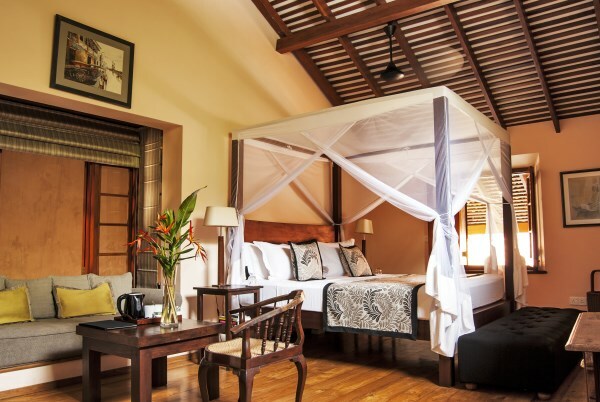 Elegantly furnished and built in harmony with the original colonial Dutch architecture of the 17th century, it is located only a few metres from the famous ramparts. 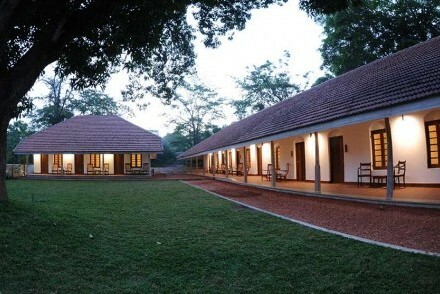 Renovated and expanded former government rest house with a prime position overlooking Lion Rock at Sigiriya. 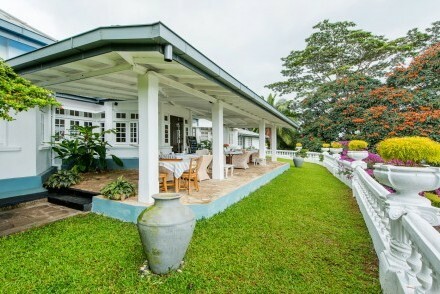 Deep verandas with overhanging roofs borrow from the local vernacular of traditional walauwas (manor houses) and reinstate the colonial architecture of times past. Secluded retreat of traditionally-built tree houses and mud-walled cottages hidden in two hectares of forest at the base of Pidurangala rock, an area named by local villagers as “Kurulu Uyana” (Bird Park) and also home to various wildlife including passing elephants! An organic farm and guesthouse perched in a tranquil valley above Ravana Falls, with spectacular views of Ella Rock and Lipton’s Seat. 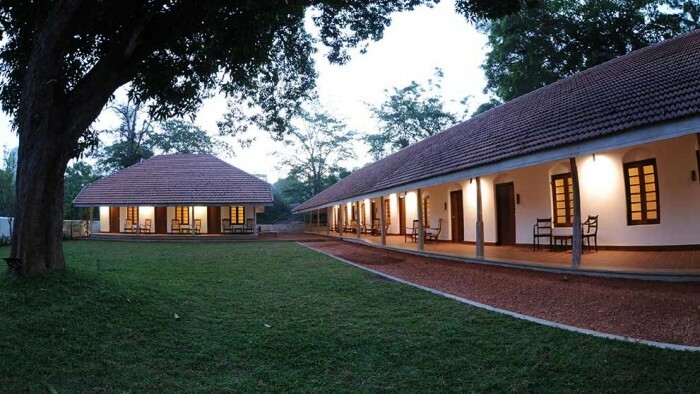 The 100-year-old estate bungalow is a full-service guesthouse, offering guests the opportunity to learn more about organic farming and artisanal tea-making. 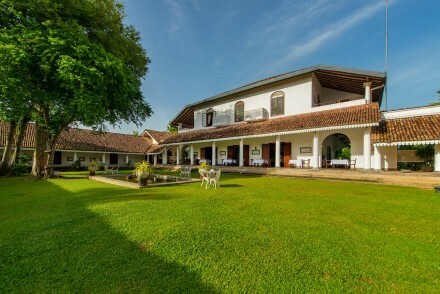 A former government rest house idyllically positioned on the banks of serene and tranquil Tissa Wewa lake, EKHO Safari Tissa offers stylishly decorated rooms with spectacular lake views, refreshing swimming pool and dining terrace, and it is conveniently located for arranging jeep safaris in Yala and Bundala National Parks. Intimate and well-established beach resort immersed in a palm grove behind a secluded and attractive sandy bay. 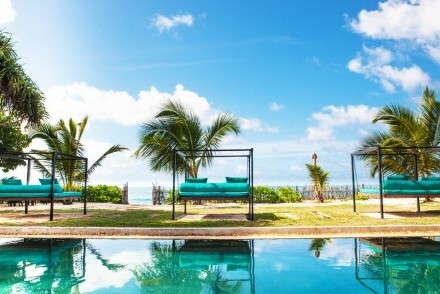 The original wooden cabanas and newer villas are scattered around the estate, with its sheltering palm trees, exotic tropical birds and ocean breezes. 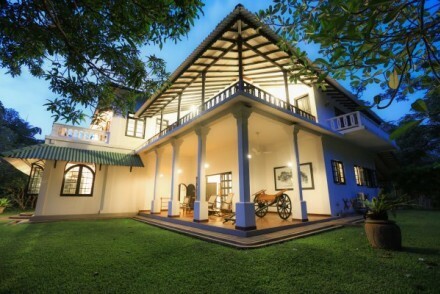 Colonial-era bungalow and urban oasis, quietly secreted away from the city’s hustle and bustle but conveniently situated for visiting the capital’s attractions. 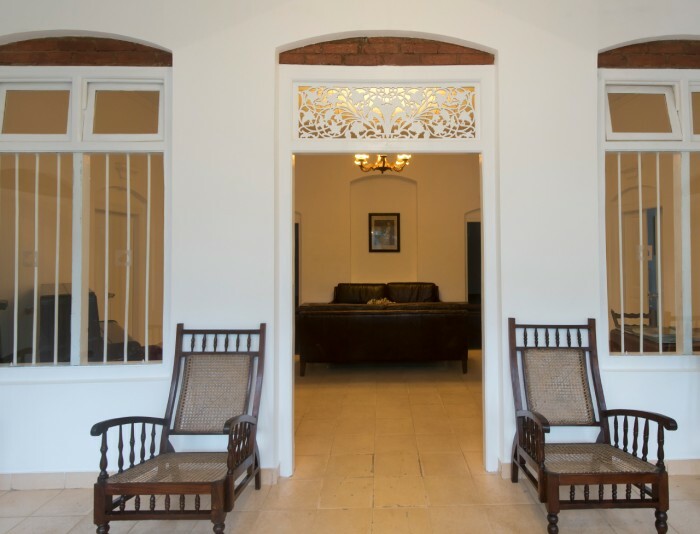 The tastefully decorated rooms reflect the bungalow’s heritage, with antique furniture and rugs, and historic photos adorning the walls.